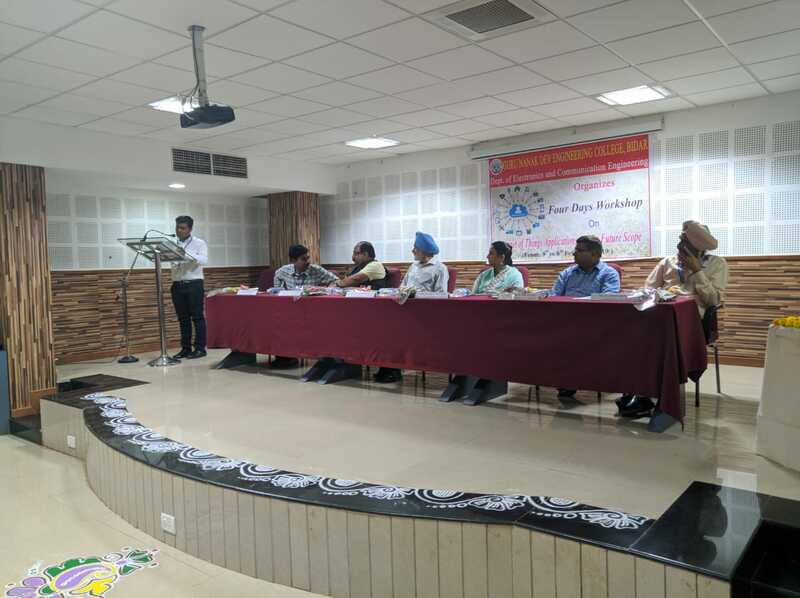 A National Level Workshop on Digital Library and E-Resource on 16th April 2019 Organized by Library Information Center Guru Nanak Dev Engg.College Bidar in Association with Global Information System Technologies ,New Delhi. 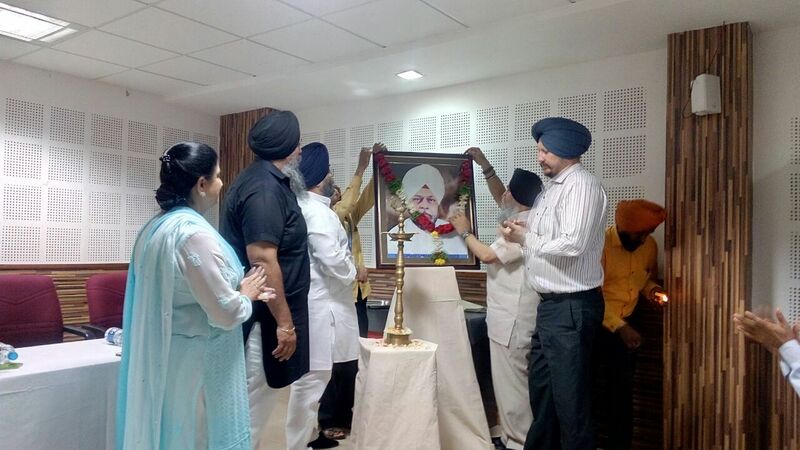 This Function is inaugurated by Chief Guest Dr. Sardar Balbir Singhji President SNJSF, Guest of Honor Smt. 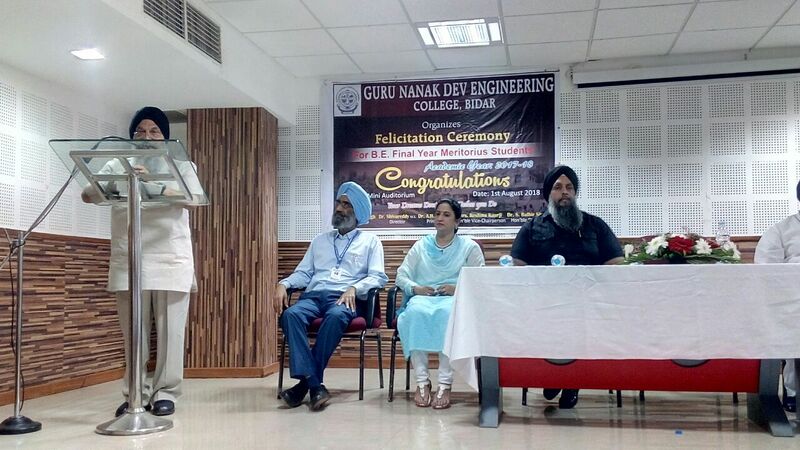 Reshma Kaur ji Vice Chairperson Guru Nanak Group of Institution, Resource person Mr.Girish Kulkarni (Dy. 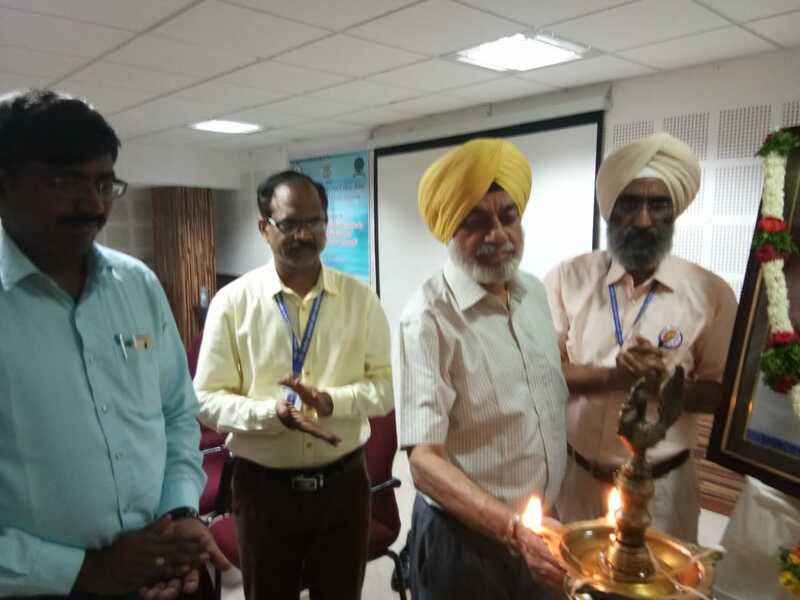 Regional Manager,Sales & Training Global Information System Technology New Delhi),Dr B.S Dhaliwal Director Academics, Dr. Ashok Biradar Principal ,Sardar Jagtar Singh Administrator ,Mr. Venketrao Potdar (Sr.Librarian). All staff members and students were present during inaugural function of Workshop. 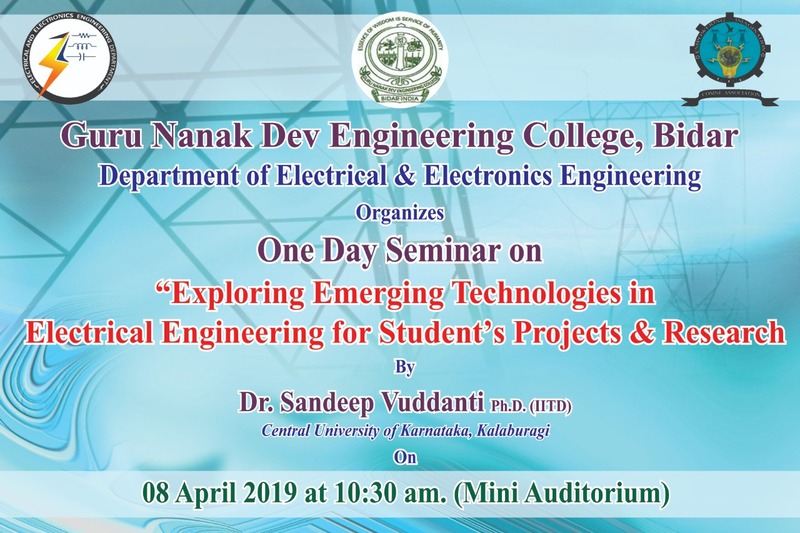 The Department of electrical & Electronics Engineering has organized one day seminar on “ EXPLORING EMERGING TECHNOLOGIES IN ELECTRICAL ENFINEERING FOR STUDENTS PROJECTS & RESEARCH” on 08-04-2019, presented by Dr. Sandeep Vuddanti of Central University, Kalaburagi. In his presentation he explained on various approaches to start with project and research work and also interacted with students. The Seminar was attended by B.E. 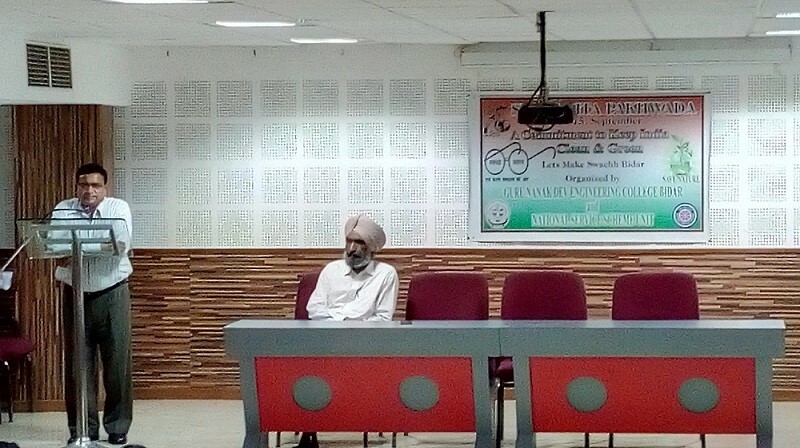 third year and final students, Dr. B. S. Dhaliwal (Director, academics), S. Jagtar Singhji (Administrator), Dr. Neelshetty. 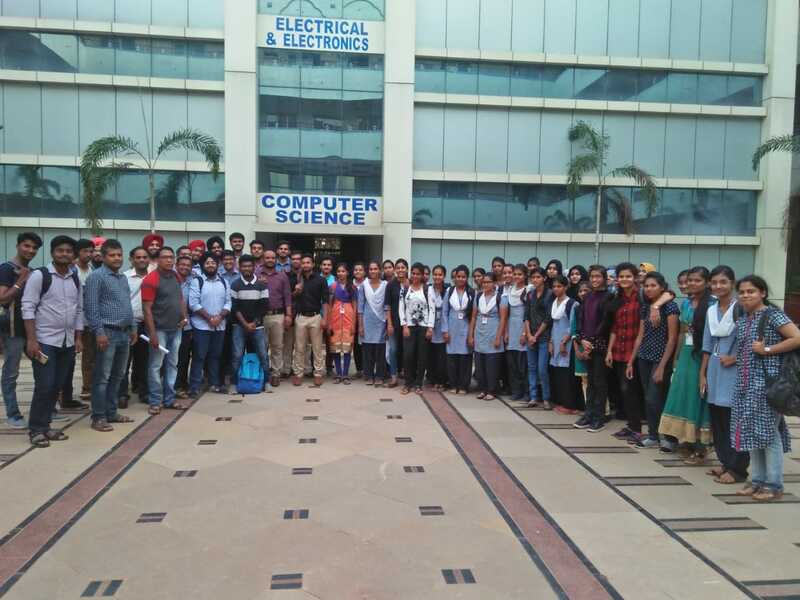 K(HOD, EEE), Heads of various departments, Co-Ordinator Prof. Rohini D and all faculty of Electrical & Electronics Engineering department were present. 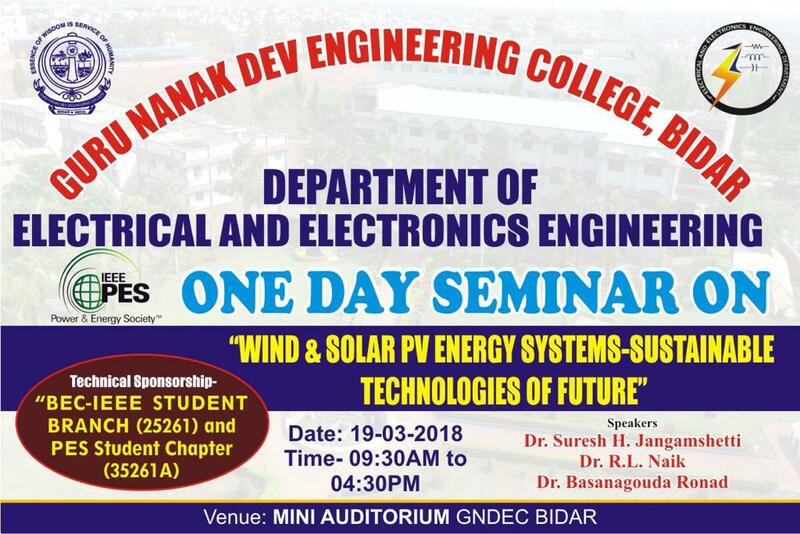 The Department of electrical & Electronics Engineering has organized one day seminar on “WIND & SOLAR PV ENERGY SYSTEMS – SUSTAINABLE TECHNOLOGIES OF FUTURE” on 19-03-2018, Following were the resource persons: Dr. Suresh. 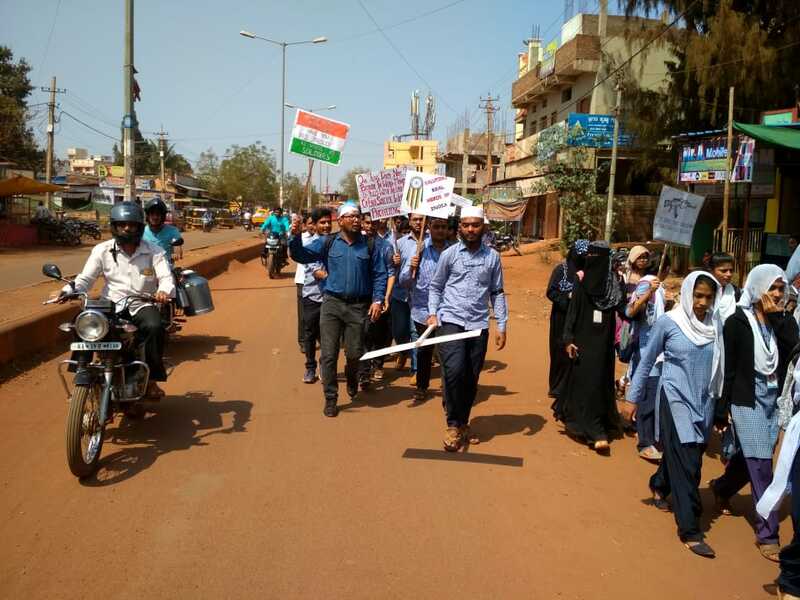 H. Jangamshetti, Dr. R. L. Naik, Dr. Basanagouda Ronad of BEC, BAGALKOTE. 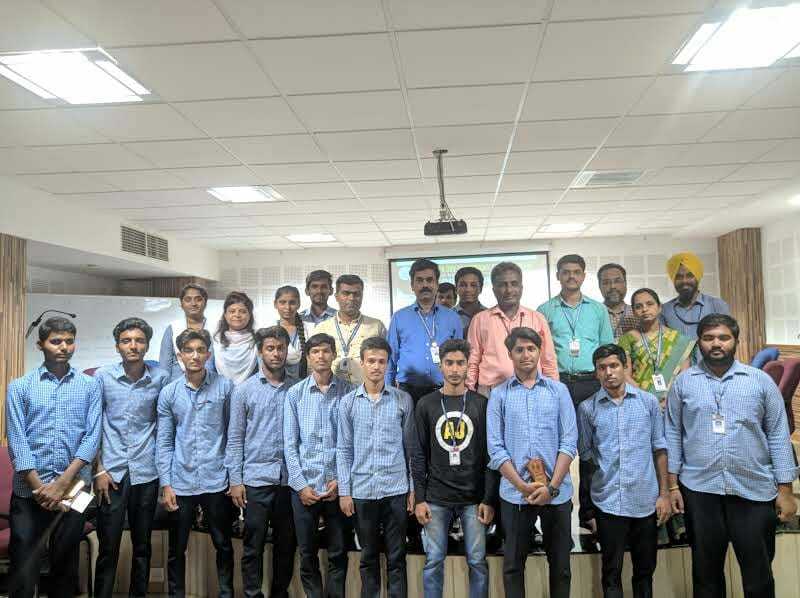 In their presentation they explained on various opportunities available to work in wind and solar technologies and also interacted with the students. The Seminar was attended by B.E. third year and final students, Mrs. Reshma Kaur (Vice Chairperson), Dr. Ashok H. Biradar, S. Jagtar Singhji (Administrator), Dr. Neelshetty. 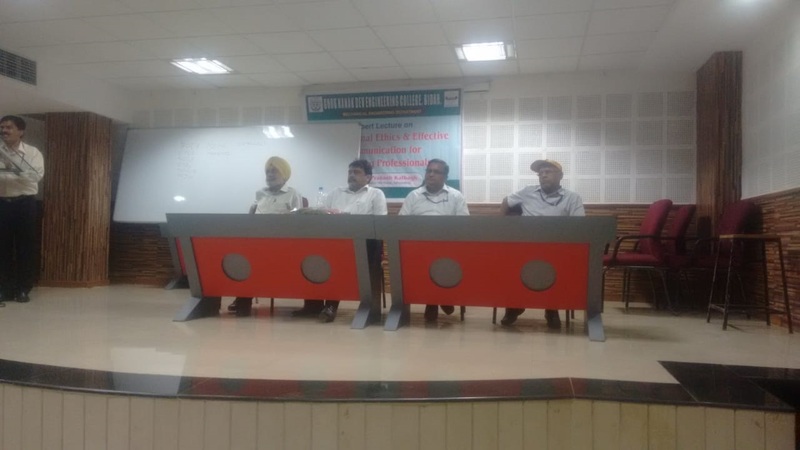 K(HOD, EEE), Heads of various departments, Co-Ordinator Prof. Deepak Ghode and all faculty of Electrical & Electronics Engineering department were present. 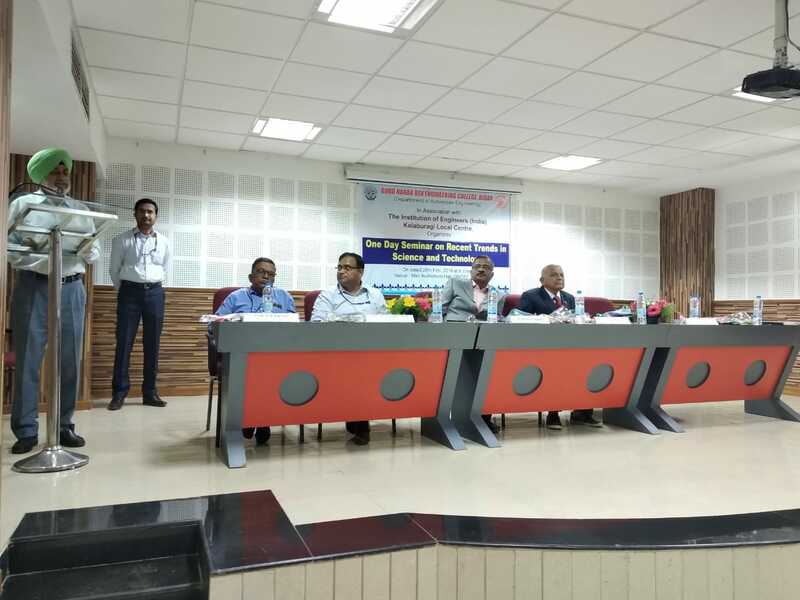 Expert lecture on “Professional ethics and effective communication for engineering Professionals"
Department of Mechanical engineering in association with Mechanical Enginnering Students association organised an expert lecture on “Professional ethics and effective communication for engineering Professionals”. 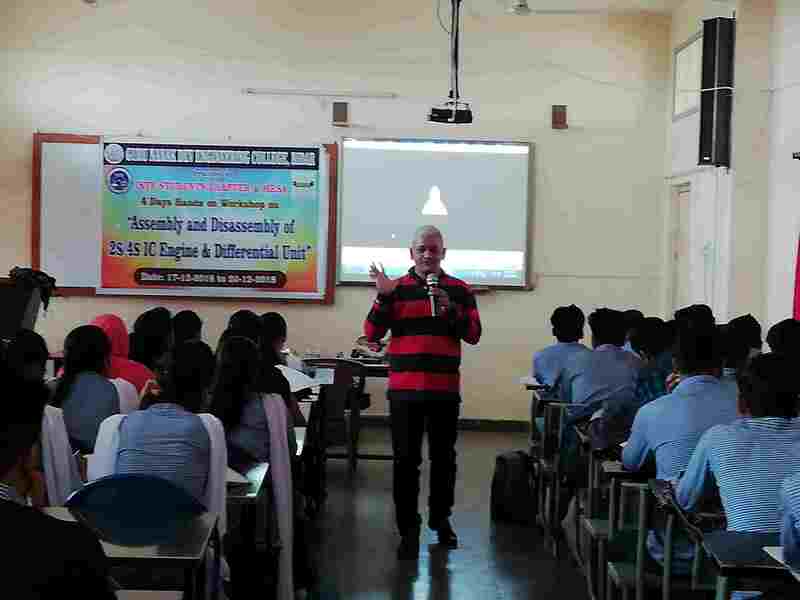 During this lecture, Mr. Prakash Kalbagh, Executive Director, MG group Zaheerabad explained importance of Ethical values and communication skills in engineering profession. He asked budding engineers to practice ethical practices so that they can be a successful professional and can be an asset to the country. Effective communication between various levels of management is very essential to do the work in correct and effective way. This lecture was attended by B.E. third year and final students. 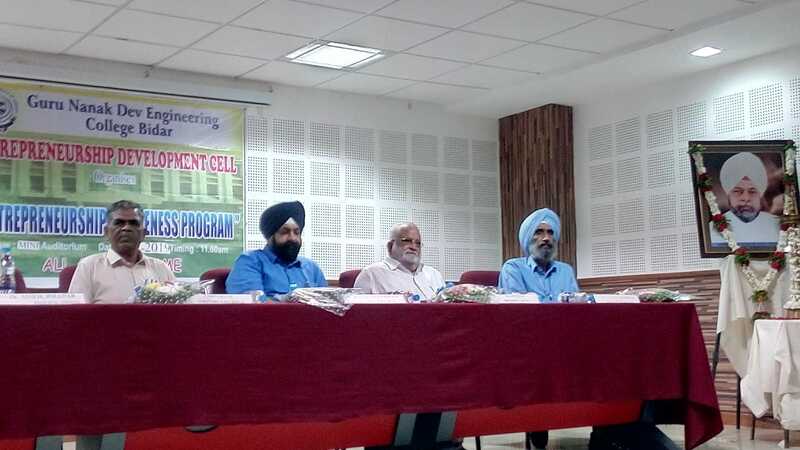 Dr. B. S. Dhaliwal (Director, academics), Dr. Ashok Biradar(Principal), Dr. D. Choudhary HOD(Mech. Engg. Dept) and all faculty of Mechanical Engineeirng department were present. 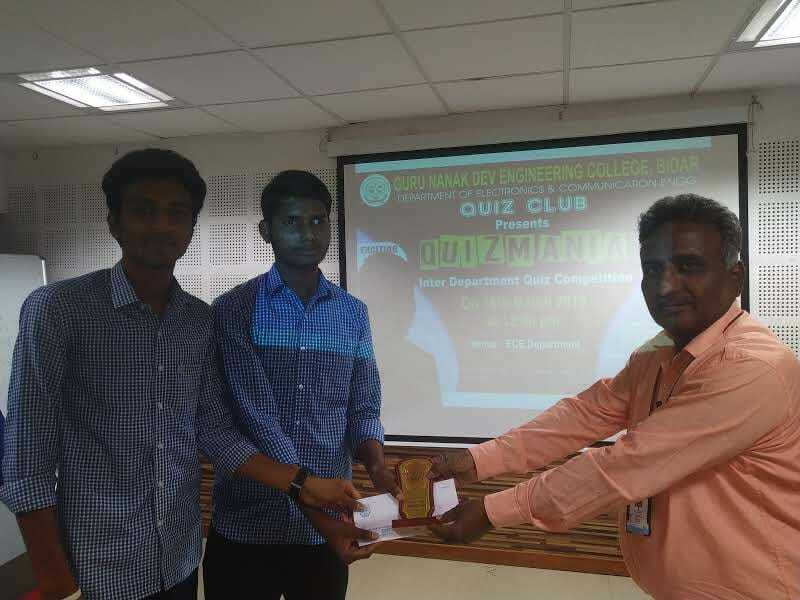 Quiz Mania(Inter-department Quiz Competition) from Quiz club Of ECE department has organized First round through Google classroom on 16 March 2019 .Total 168 Students(84 groups) of different departments were participated ,out of which 5 groups were selected for Final round, Which is held on 11 April 2019 at 12:30pm in Mini auditorium. Syed Abdul Gafoor Naveed of 6th semester ECE and Md.Amir Sohail of 6th semester Mechanical Engg were winners and Cyril Marodona and Syed Rizwan Ali of first year Engg., were runners. 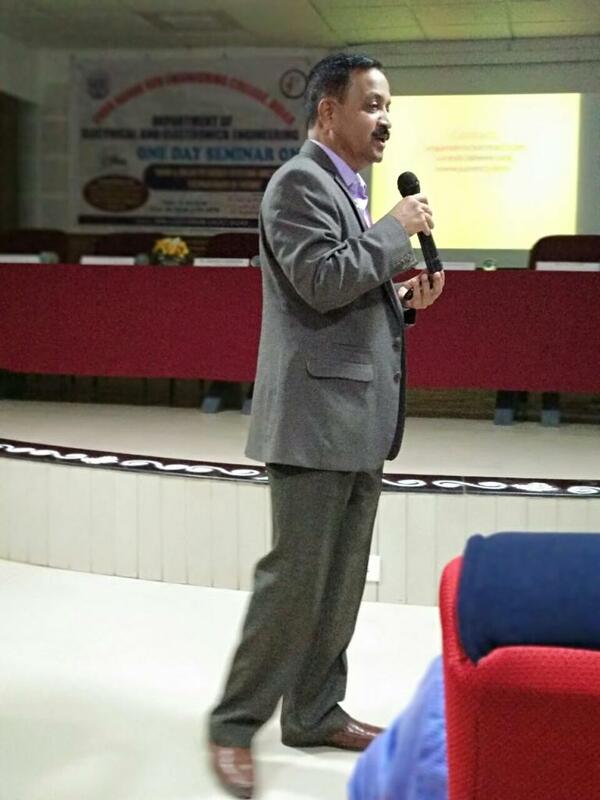 Dr.Ravindra E,HOD of ECE Dept. 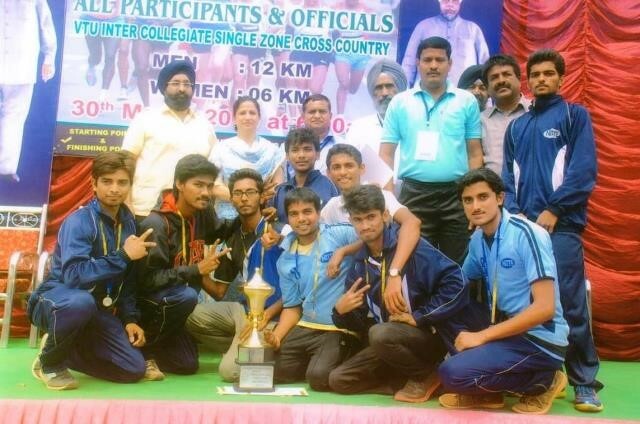 and Prof.Madhav Nirgude ,HOD of ISE Dept have distributed the prizes to winners and runners. 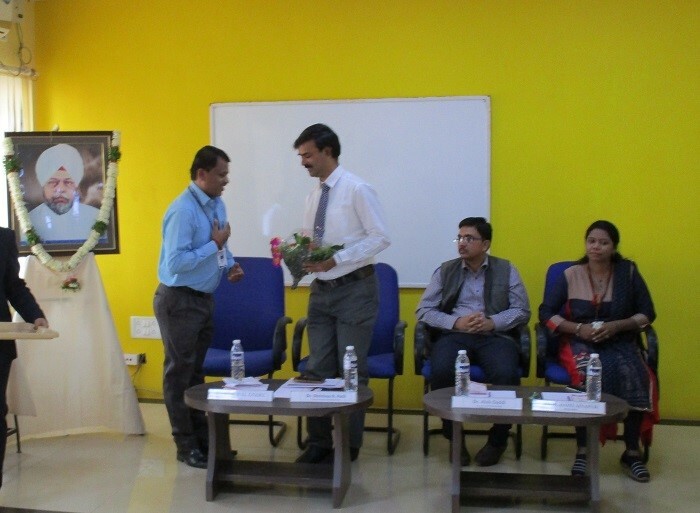 Dr.Md.Bakhar and Prof.Ramesh Patil were judges. 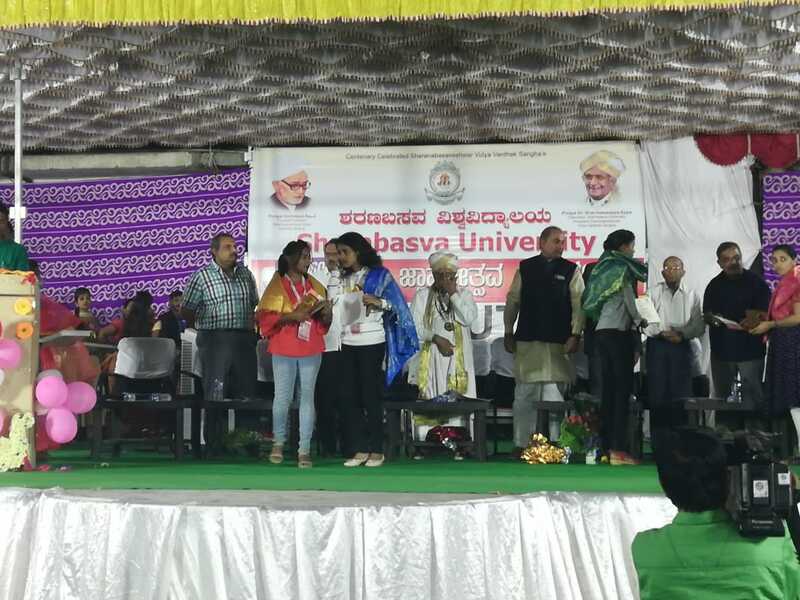 Prof.Savita Soma, Prof.Pradeep Karanje, Prof.Harish Joshi and the Student Coordinators Neha Byale, Ganesh Bochare,Nandini Patil,Varsha,Syed Sarafraj and Karandeep Singh Co-ordinated the Event. 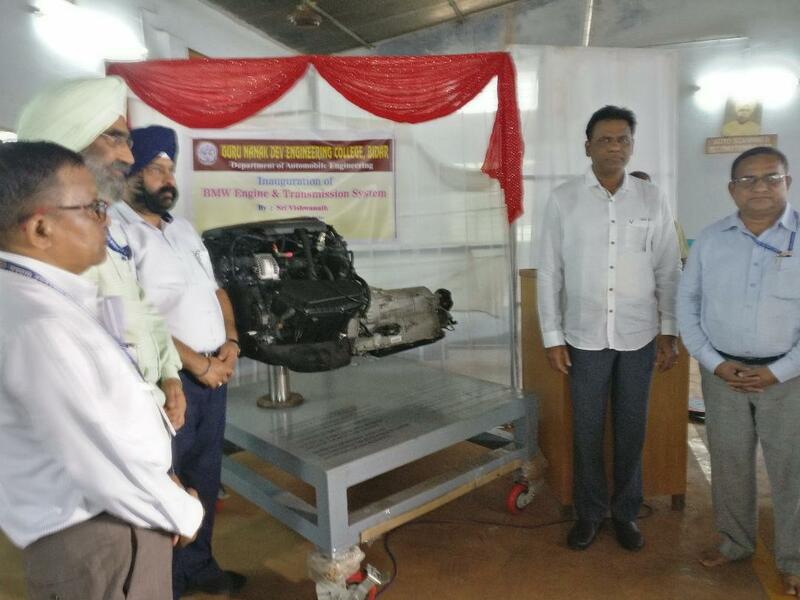 A Two Days Hands on workshop on ‘Casting Processes’ was organized by Mechanical Engineering department,Guru Nanak Dev Engineering College, Bidar. From 18/03/19 to 19/03/19. DR. B S Dhaliwal, Director Academics, Dr. Ashok Biradar, Principal, Sardar Jagtar Singh, Administrator and Dr. D Choudhary H O D Mech. Dept., inaugurated the workshop. The faculty members and students were present for the workshop. Director Academics stressed on the developing casting skills among the students so as to face the changing scenario of the world. 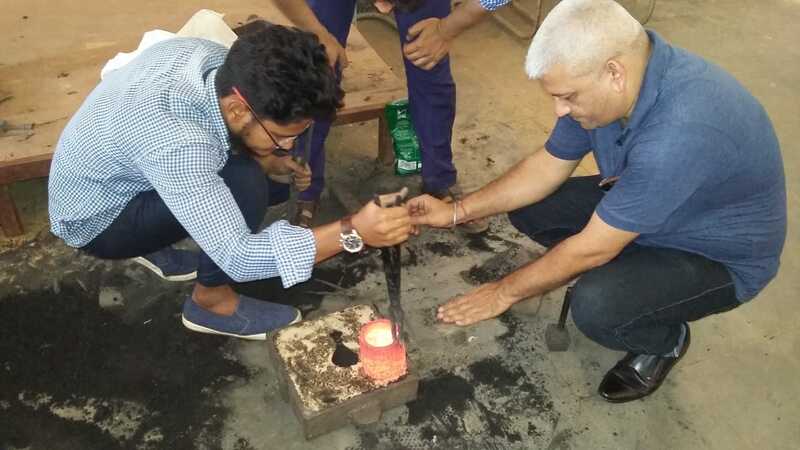 Dr. D Choudhary, enlightened the students about casting processes. 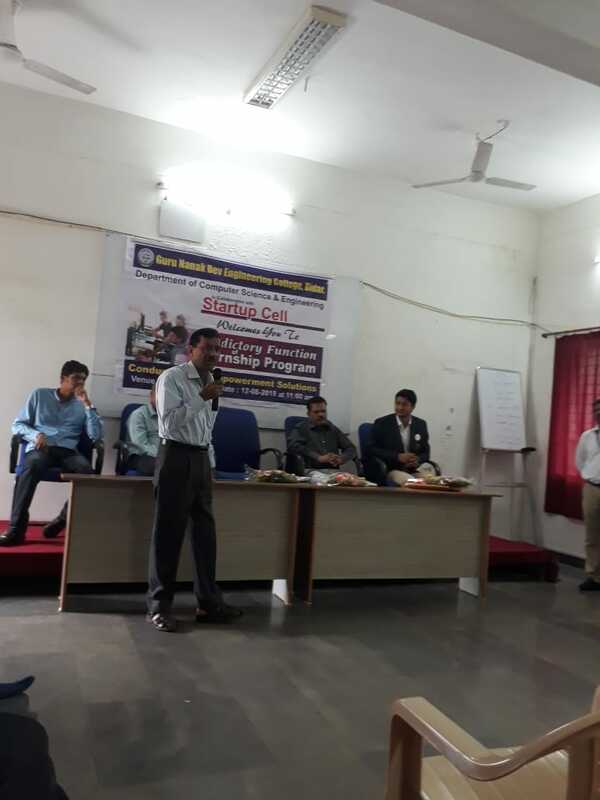 Dr.Nagraj R G, Welcomed the participants and highlighted the work shop. The workshop was moderated by Er.Vijay Kumar Industry Expert. The workshop was conducted in two sessions. The workshop was attended by 100students who expressed their desire that such programmes should take place at regular intervals. 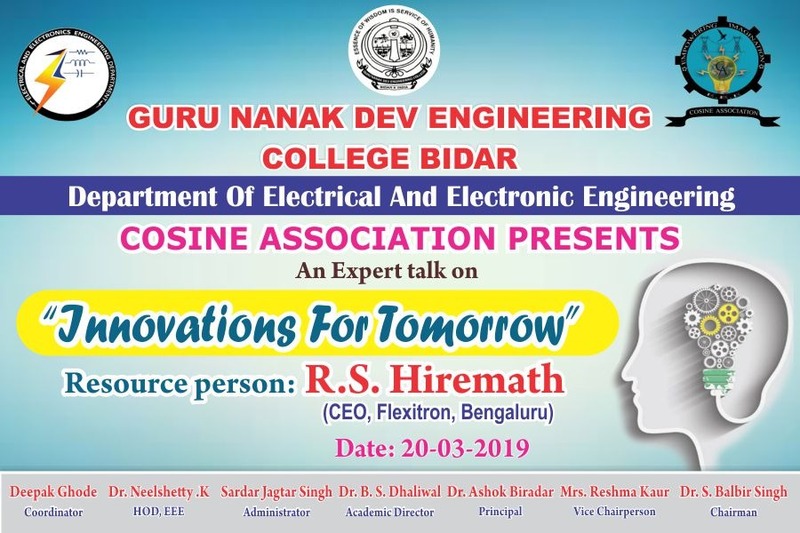 Cosine Association of EEE Dept GNDECB Presents an Expert Talk on "Innovation for Tomarrow"
The Department of electrical & Electronics Engineering has organized one day seminar on “INNOVATIONS FOR TOMORROW” on 20-03-2019, the resource person Mr. R. S. Hiremath recipient of 04 national awards for Best Innovations of FLEXITRON, BENGALURU. In his presentation he explained on various opportunities available for innovation in the field of energy and also interacted with the students. He also interacted with the incubation centre in- charge regarding the projects submitted. The Expert Talk was attended by B.E. 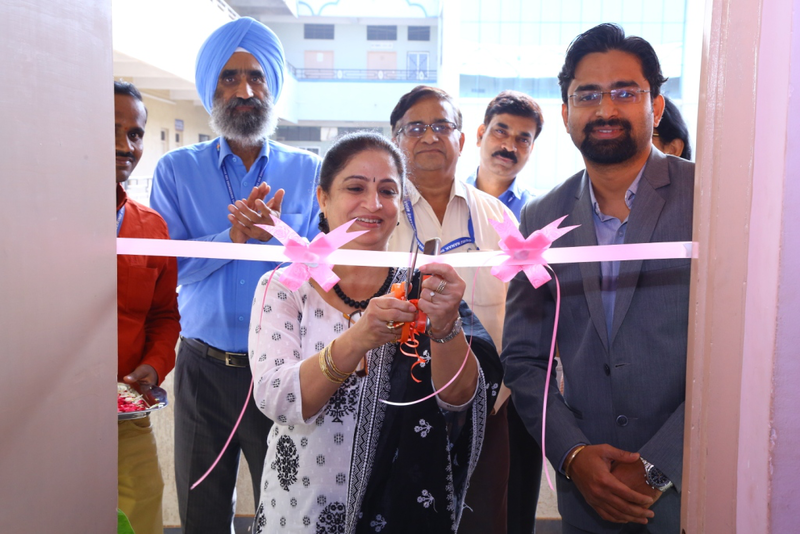 third year and final students, Mrs. Reshma Kaur (Vice Chairperson), Dr. Ashok H. Biradar (Principal), Dr. B. S. Dhaliwal (Director, academics), S. Jagtar Singhji (Administrator), Dr. Neelshetty. 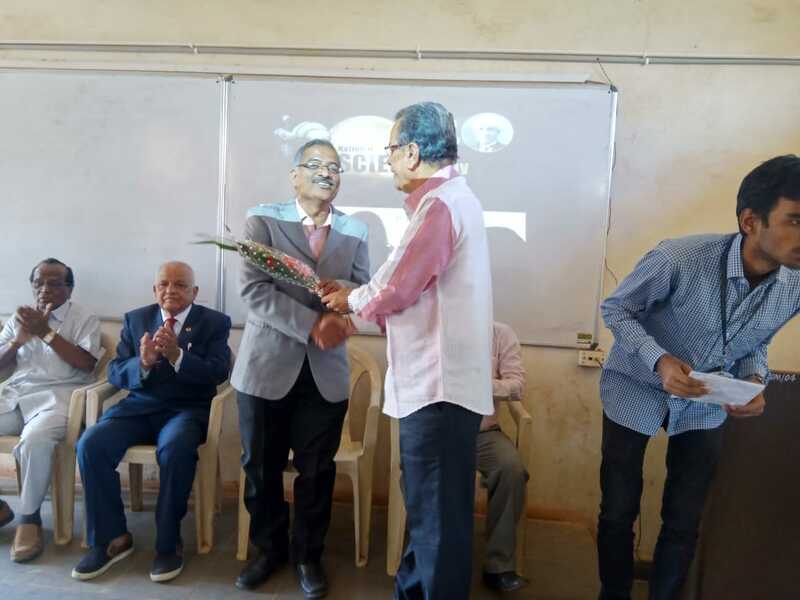 K(HOD, EEE), Heads of various departments, Co-Ordinator Prof. Deepak Ghode and all faculty of Electrical & Electronics Engineering department were present. 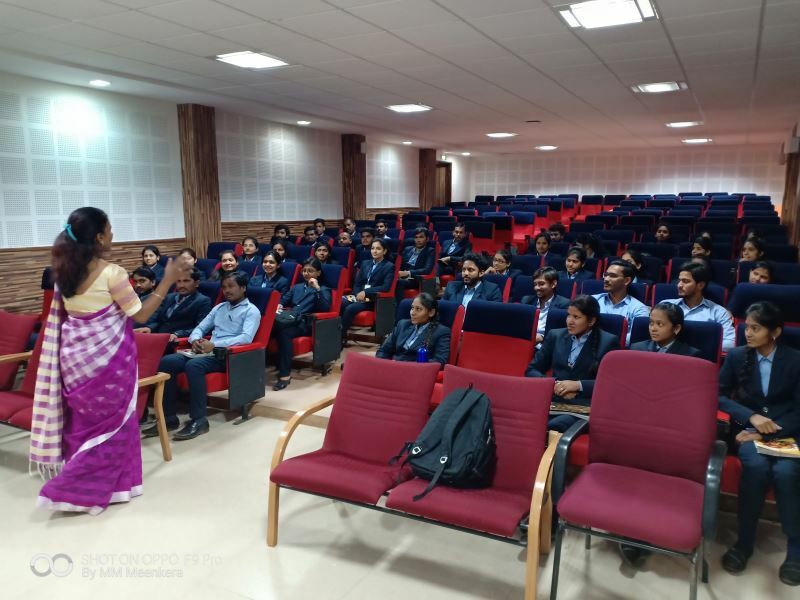 Department of MBA, GNDEC, Bidar is Organizing Soft Skill Training Progam for MBA Ist and IInd Year Students from 11/03/2019 to 14/03/2019. 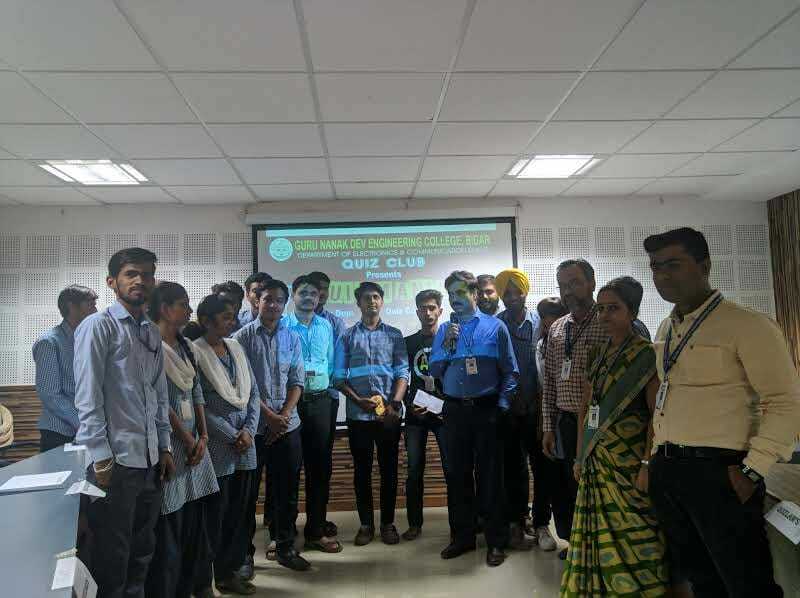 Department of Civil Engineering Organized observance of National Science day on 28th Feb 2019 for Pre Final Year Civil Engineering Students of Civil Engineering Department and all the Faculties actively involved in the program. 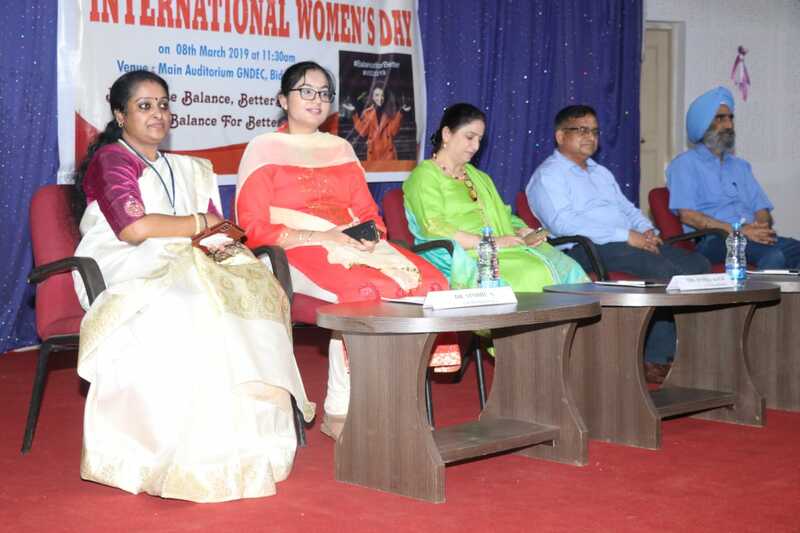 The program was chaired by B. S. More Kalaburgi and Dr. Baburao N. Sherikar, Dr. B. 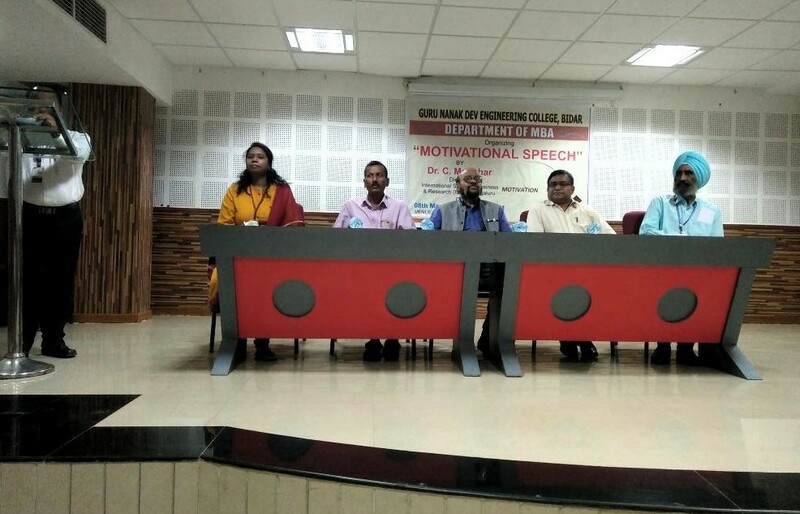 B. Kori Prof & Head along with the entire Staff of Civil Engineering Department at Civil Department GNDEC, Bidar Chief Guest briefed about the innovation and its application in civil engineering, encouraging the students to engage in innovations for the development of self and society. 2. Advent of Raman’s Effects on the eve of National Science Day. 3. Motivation for Innovations in Civil Engineering. The Financial Support was aided by Management GNDEC Bidar. The H.O.D (civil), Dr B.B Kori was the Conveyor for one day works. 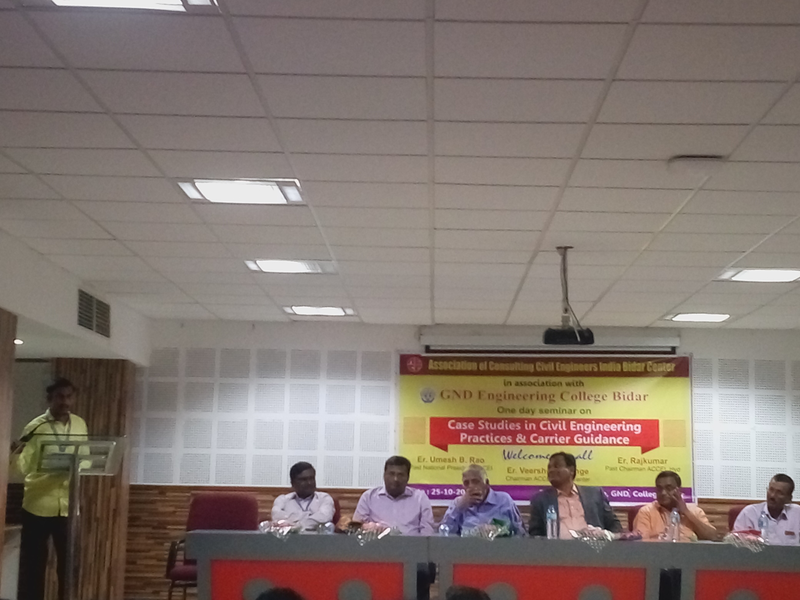 Department of Civil Engineering Organized one day Seminar on Advances in Structural Engineering & Special Concrete on 8thFeb 2019 for Pre Final Year Civil Engineering Students of Civil Engineering Department and all the Faculties of Civil Engg Dept have participated in seminar organized by Department of Civil Engineering GNDEC, Bidar. The Students took part in seminar of civil engineering department. 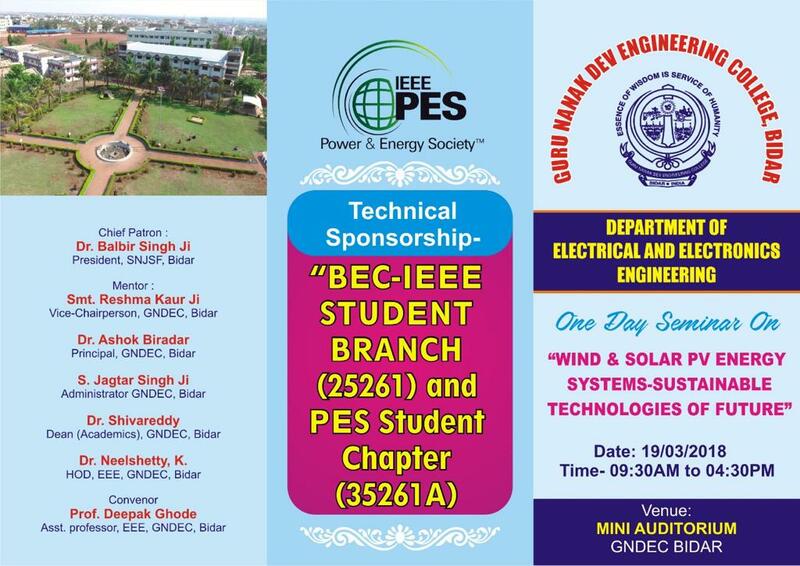 Further Students took an initiation to attend panel discussions also in the seminar by civil engineering department. The program was chaired by Department. Dr. B. 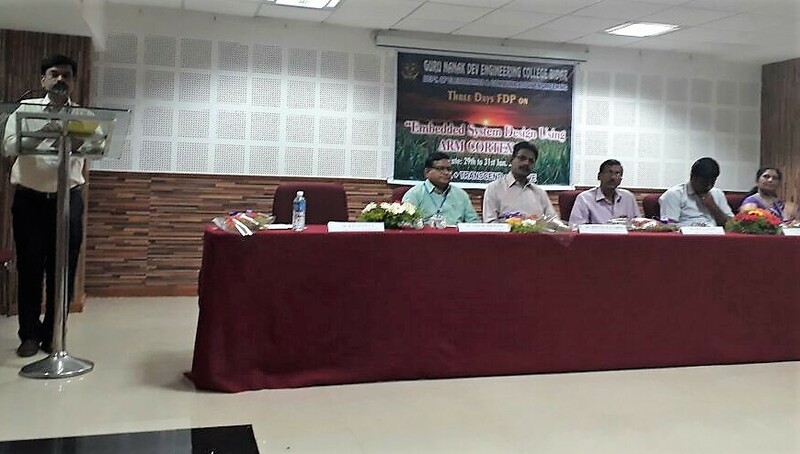 B. Kori Prof & Head along with the entire Staff of Civil Engineering Department at Civil Department GNDEC, Bidar . 1. Dr. S. R. MisePh. D. Professor , PDA COLLEGE Gublarga. 2.Water physical, chemical and biological characteristics. 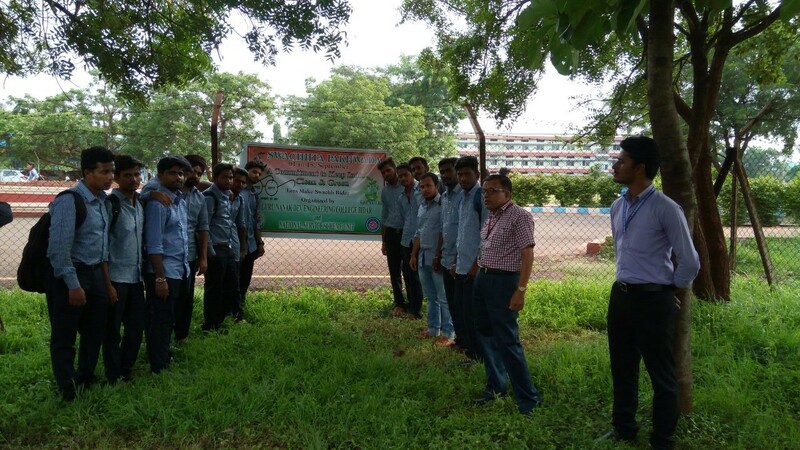 A one -day technical visit was organised for the students of Civil Engineering Department under IEI Student chapter. 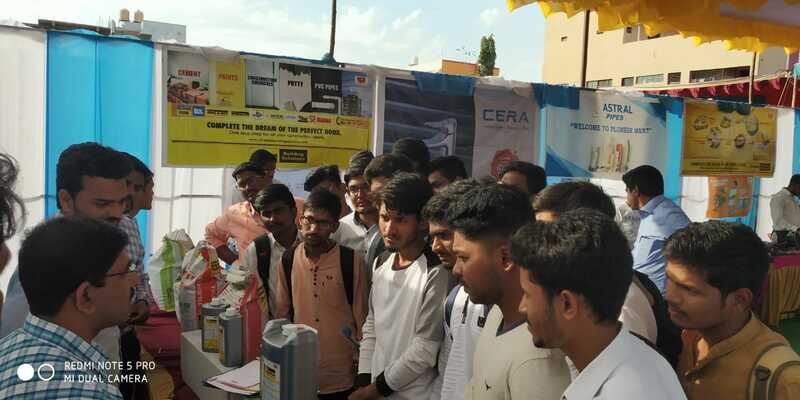 The students were taken to ultra tech technical organised by Ultra Tech in Bidar city. The students were exposed to various advance materials of construction and field test experiments of materials. etc. 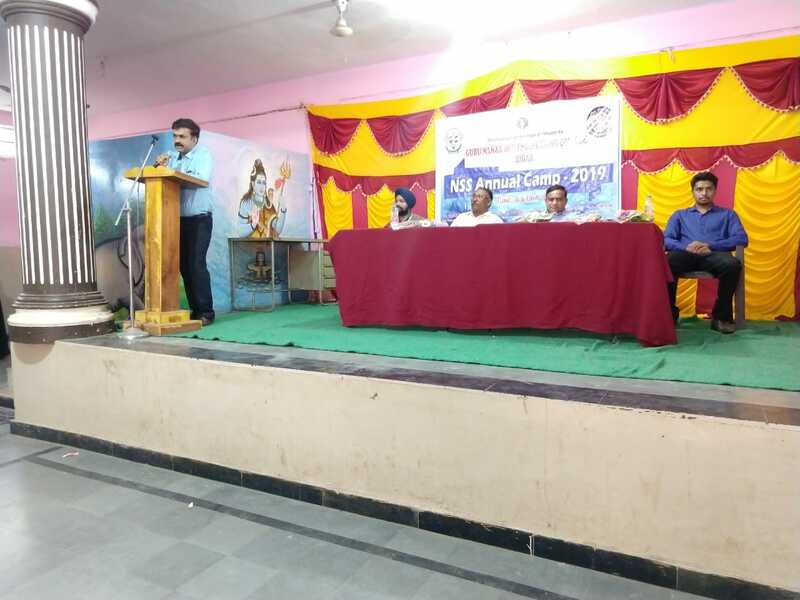 Automobile Engineering Department, Guru Nanak Dev Engineering College Bidar in association with The Institution of Engineers (India) Local Center Kalaburagi, organized one day seminar on Recent Trends in Science and Technology on the eve of Celebration of National Science Day on 28-2-2019 at Guru Nanak Dev Engineering College Bidar. Er. 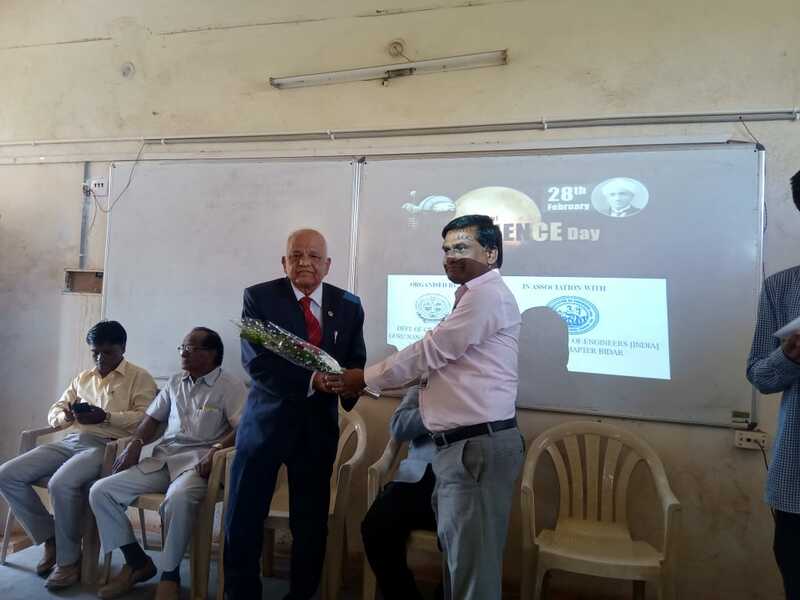 B. S. More, Chairman and Dr. Babu Rao sharikar, Secretary of The Institution of Engineers (India) Local Centre Kalaburagi were the Chief Guest and Guest of Honour of this function. Dr. Sridhar Pande, C.C.T Department P.D.A. 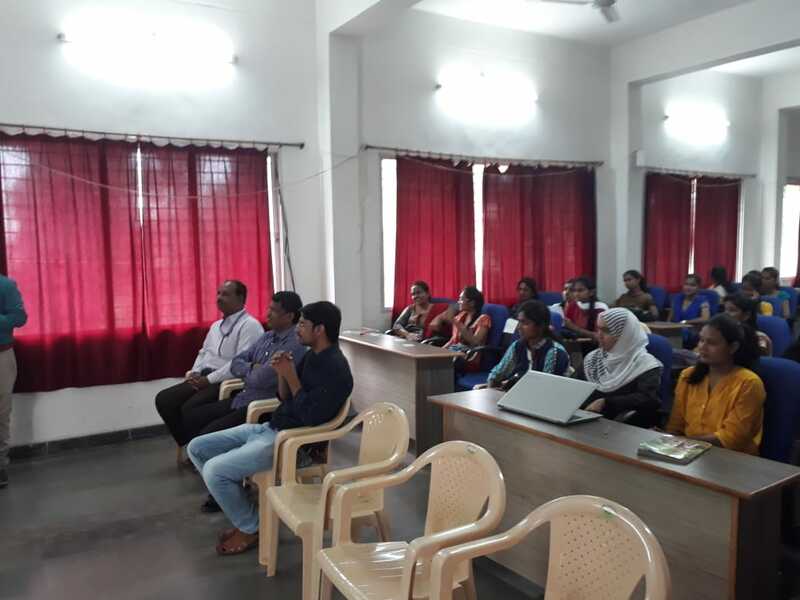 College of Engineering Kalaburagi, deliberated the seminar on the topic Evolution in Science and Technology and Role of Engineers in Developing India. Dr. Prabhudev M S Senior Grade Lecturer Government Polytechnic, Kalgi, spoke on topic Science, People and Sustainable Development. 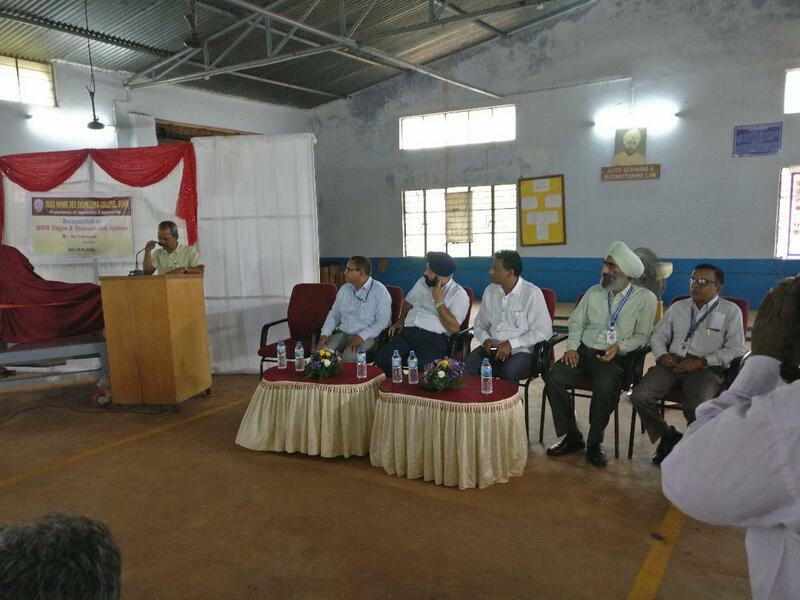 Prof. B. K. Purohit, H.O.D Automobile Engineering Department, GNDEC Bidar delivered welcome speech and Prof. Shivaji Koli, delivered vote of thanks, Dr. Ashok Biradar Principal, Dr. B. S. Dhaliwal (Director Academic) spoke on the occasion; Prof. Shivshankar Chittnalli compered the program. 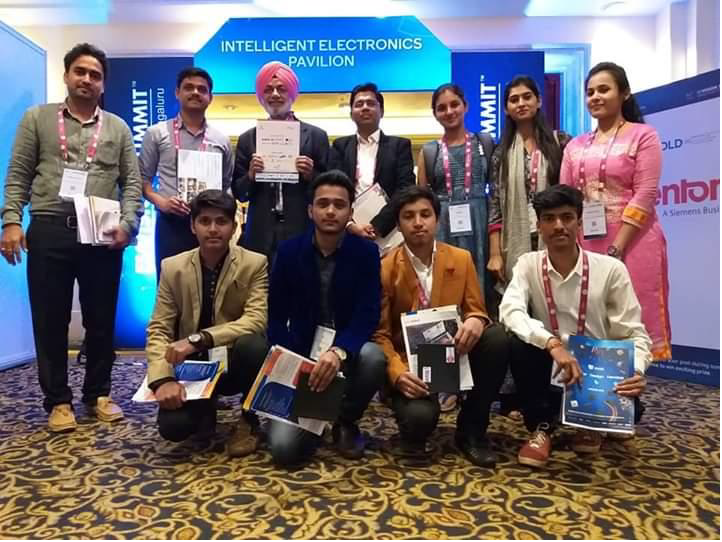 IESA(Indian Electronic Semiconductor Association) Vision Summit 2019 is a great platform for businesses to envisage the future and drive the initiatives/policies of the Industry, that will propel the Government to succeed in the thought process of 'Think Global but do local', and our own 'Make in India'. The summit will focus on different strategies to aim at the turnover of $400 billion in domestic electronics consumption by 2025, along with promoting ease-of-doing business for the entire electronic system design and manufacturing of ESDM sector, and encouraging industry-led research, development and innovation. 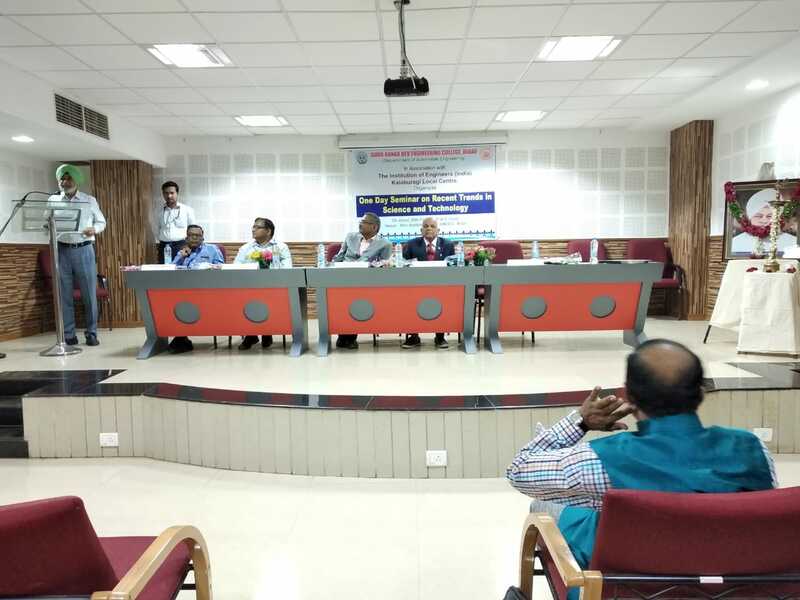 Four days workshop on IOT applications and it's future scopes organized by Department of Electronics and Communication Engineering from Feb 2 to 8 2019. 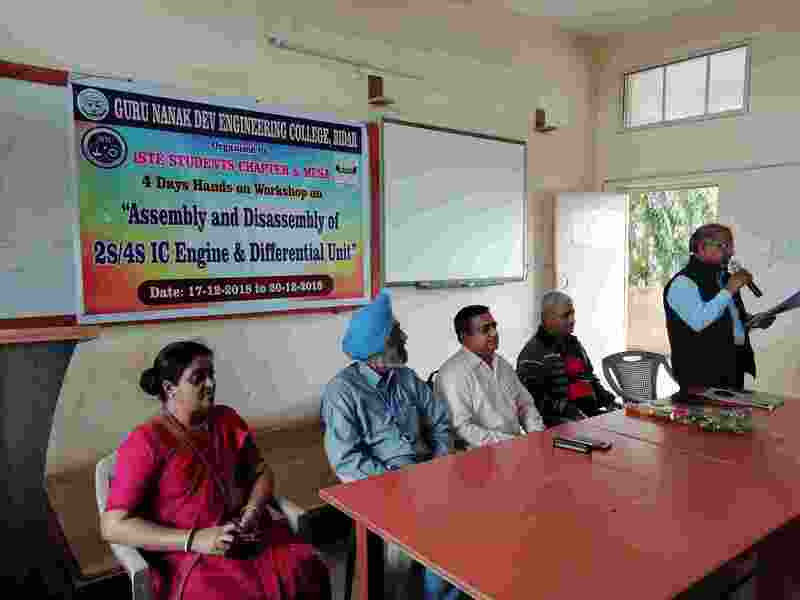 "HANDS ON WORKSHOP OF I.C.ENGINES & DIIFFERENTIAL SYSTEM" organised by ISTE chapter and MESA. 2. LEAST COUNT OF VERNIER & MICROMETER. 3. SHORT DESCRIPTION OF I.C. ENGINE 2-STROKE. 5. TOOLS GENERALLY USED IN INDUSTRY. 7. WORKING OF TRANSFER PORTS PRACTICALLY. 11. PISTON RING DETAIL STUDY. 13. DISASSEMBLY OF TWO STROKE I.C.ENGINE. ( ENGINE HEAD,SPARKPLUG,	BLOCK, PISTON.CONNECTING, CRANK,GEAR BOX, CLUTCH ASSEMBLY,KICK,CARBURETOR ETC.) composition & manufacturing of all parts will be explained in detail. 19. CRANK SHAFT END PLAY (VIDEO). 23. SHORT DESCRIPTION ON DIFFERENTIAL. 25. ASSEMBLY & DISASSEMBLY BY ALL STUDENTS IN BATCHES WILL TAKES PLACE SIDE BY SIDE DURING THE SEMINAR. 26. Questions generally asked at the time of the interview. At GNDECB, it has been our constant endeavour to achieve excellence in education and training and to bring latest technological advancements in the reach of our budding engineers. Hence the Center of Excellence(CoE) is being established in GNDECB in collaboration with Automation Anywhere University, California, USA. 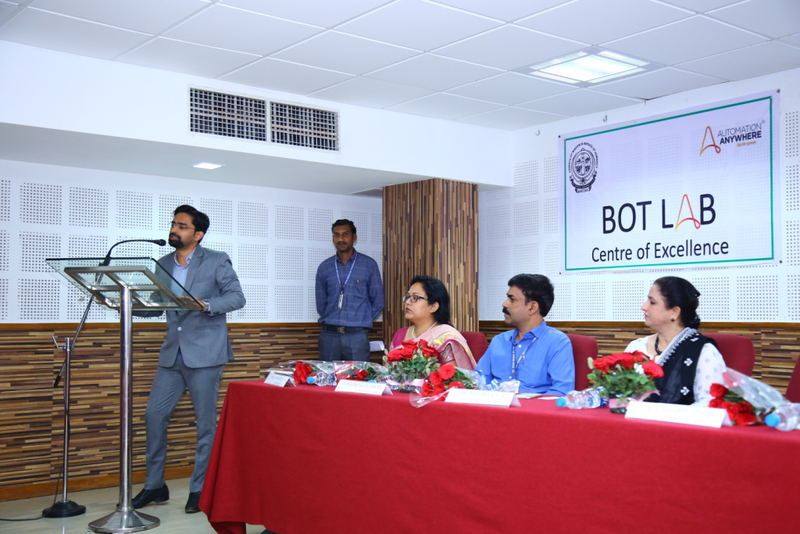 This CoE will be enabling students by providing training in Robotic Processing Automation(RPA). RPA being the latest and cutting edge technological paradigm in the IT industry and is shaping the future of our wok place. Every modern workplace and industry is on the journey of digital transformation, making it only a matter of time before every role within enterprise organizations will evolve with automation. As a resultant it is imperative and the right time to learn RPA. As reported by Delloite, upto 15 percent of business leaders has noted RPA as the wider corporate initiatives in 2016. In 2017, 64 percent of organizations have included RPA in their strategies. Dr. Ashok Biradar, Principal GNDEC, Bidar, has given a warm welcome to all the invitees of the event. Mr. Krishna Raju S, Business Development Manager, AAU, Bangalore has described about the vision of the organization. Automation Anywhere University is preparing the world for the future workforce. Businesses today increasingly employ both human and digital workers. Automation Anywhere University's mission is to help professionals thrive in this new workforce. Using the latest technology and tools, Automation Anywhere University transfers RPA knowledge and skills to professionals across all industries worldwide. By offering these valuable training courses and certifications to our students, Automation Anywhere University prepares the next generation of successful business leaders for the new era of global work. At GNDEC Bidar, it has been our vision to keep pace with the fast developing scenario of technology and socio-economic environments while planning to develop a world class technical institution. To achieve that the Institution is collaborating with the organizations as AAU, so that the students of the region will get benefit-ted with the programs as such. 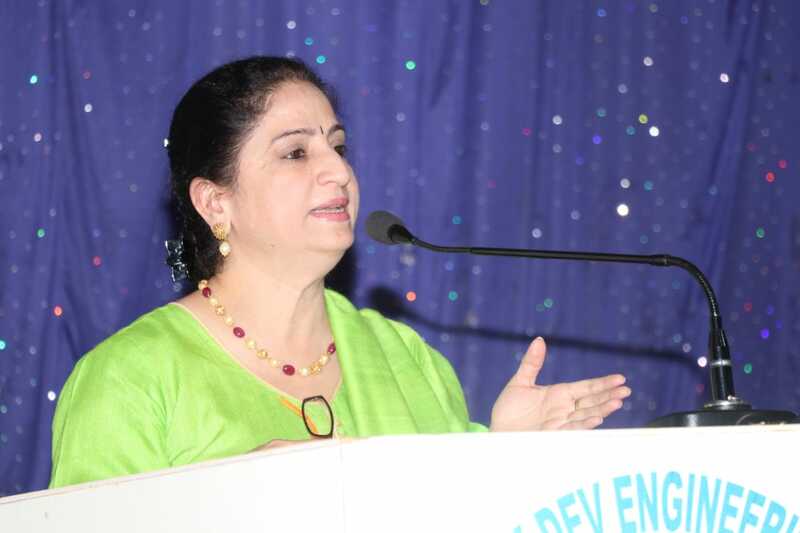 Hon’ble Vice-Chairperson Mrs. Reshma kaur Ji has projected about the transition happening with respect to technology. In the ever evolving and dynamic realm of Technologies, it is the need of the hour that the students must take advantage of this affordable training in latest technological evolution and learn to make themselves ready as a future force. This will make them ready for a better and bright future. Such training programs must be encouraged by parents as well. 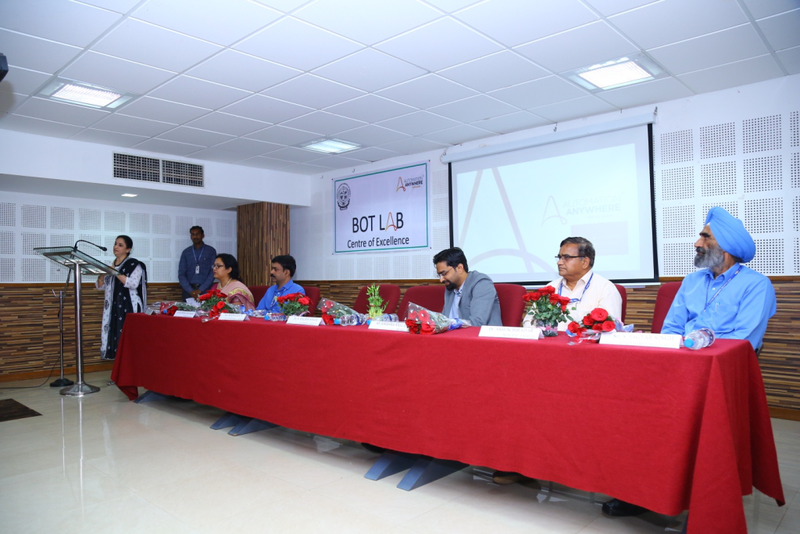 A Center of Excellence, BOTLAB, having capacity of 50 computers was inaugurated during the event as well. 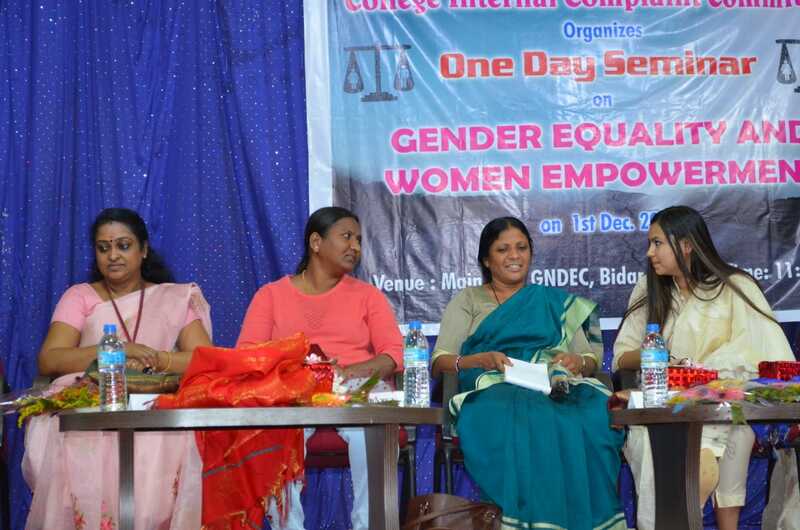 Dr. Shamla Dutta, Principal GND Degree College, who has also witnessed the event. 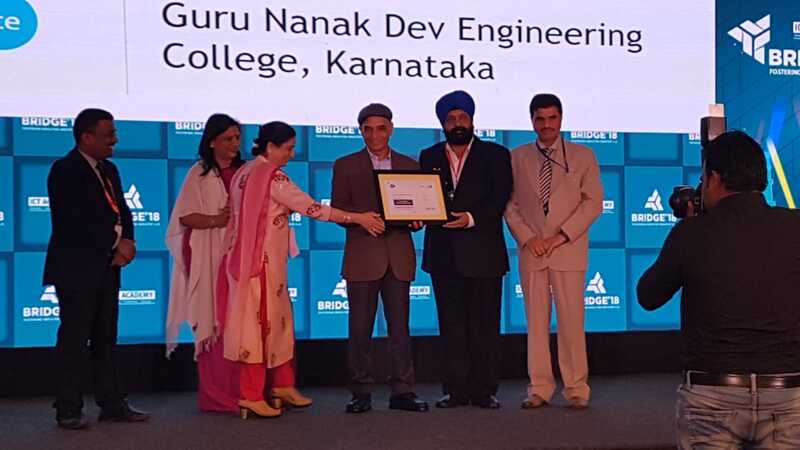 The Guru Nanak DeV Engineering College , Bidar has signed the MOU with ICT Academy Centre of Excellence, Bangalore and Salesforce Technology Hyderabad for training and placement to the students who can develop their carrier and improve the employability of student these companies will provide training on latest Technology. On 16-11-2018 at Guru Nanak Dev Engineering College Campus. With this MOU majority of Engineering & Degree college students would get benefited. The ICT academy and Salesforce Technology Hyderabad has arranged a function BRIDGE-18 in 36th Edition of ICT Academy BRIDGE Conference held the Largest Industry Institute Interaction Event of Asia, scheduled on Wednesday the 12 Dec 2018 at Shangri La-Eros Hotel, New Delhi, India. 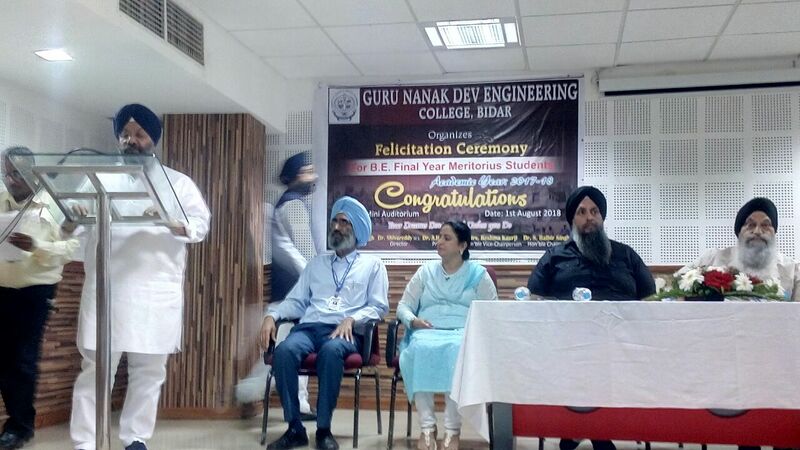 Dr. S. Balbir Singh, Chairman Guru Nanak Dev Engineering College and Smt. Reshma Kaur Vice Chair person GND Engg. 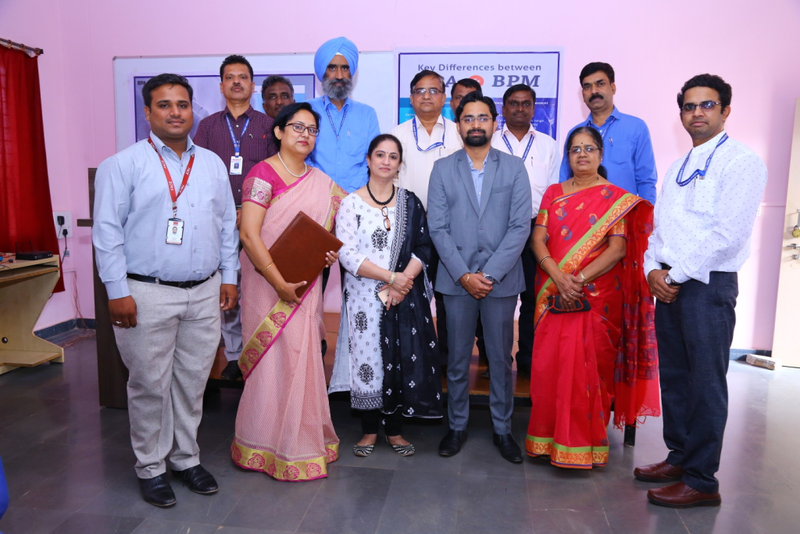 College were specially invited to received the Certificate of ICT Academy Centre of Excellence the MOU was signed between GND Engg College and ICT Academy, Salesforce Technology on 16-11-2018 and participating in the Govt. of India move on industry and academia bridge-18 event. The Chief Guest of the BRIDGE-18 function was Dr. Satpal Singh Ji Union Minster of State for Human Resource Development who has distributed certificates to the special invitees on this occasion Hon’ble HRD Minister focused the theme of this edition is "Fostering India for Industry 4.0", which will bring together industry experts, academic leaders and Government policymakers to address the challenges faced by India in the era of Fourth Industrial Revolution, and thus creating a correlated education ecosystem and formulating a strategic regulatory framework. It is the only event addressing the stakeholders and leaders in the process of bridging the government, industry & academia towards building future India. On this occasion Dr. M.P. Punia, Vice Chairman AICTE , Sri M. Shivakumar, Chief Executive officer , ICT Academy , Dr. Pankaj Mittal, Additional Secretary University Grant Commission , Sri Manish Behl , Senior Director Centre for the Future of work Cognizent, Dr. Neetu Bhagat , Deputy director AICTE , Mr. Suresh Babu L , Regional Head – Education south India were present on the occasion. 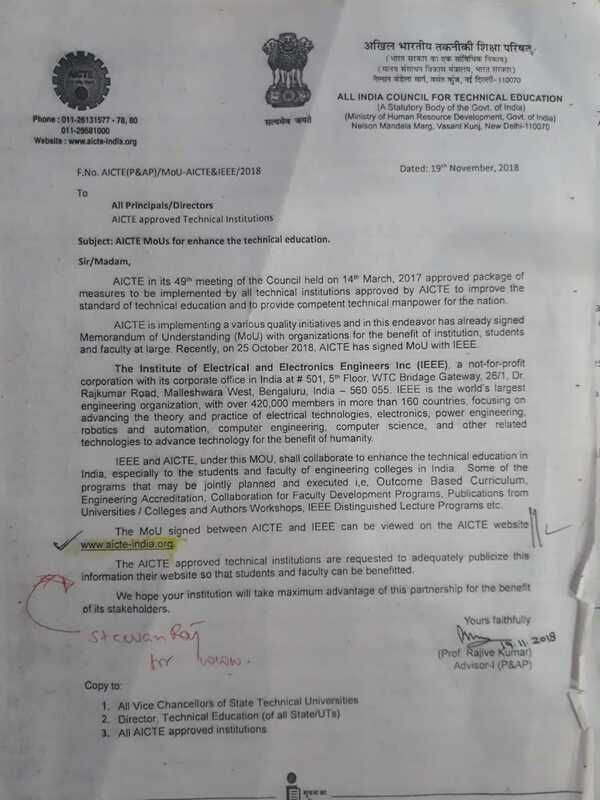 AICTE in its 49th meeting of council held on 14th March package of measures to be implemented by all technical institutions approved by AICTE to improve the standards of technical education and to provide competent technical manpower for the nation. The Dept. 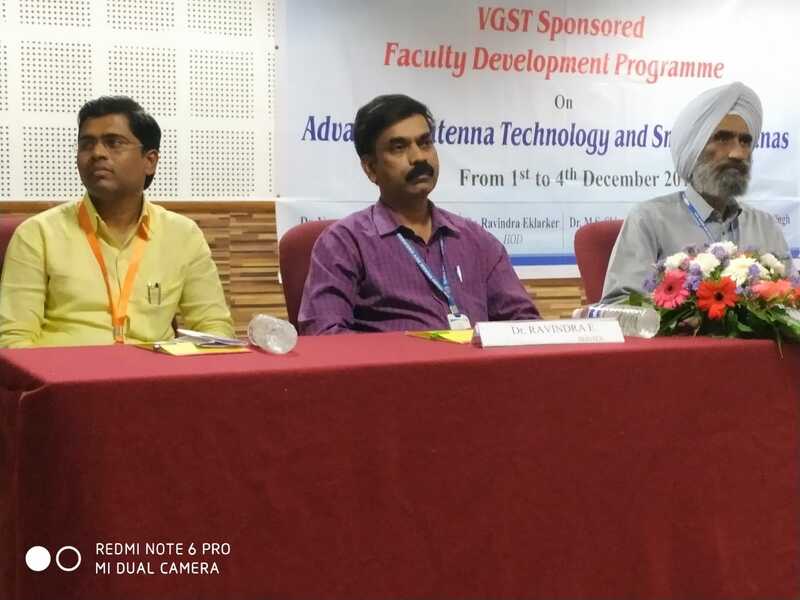 of E&CE has organized the four days Faculty Development Programme (FDP) on “Advances in Antenna Technology and Smart Antennas” from 1st Dec. 2018 to 4th Dec. 2018. 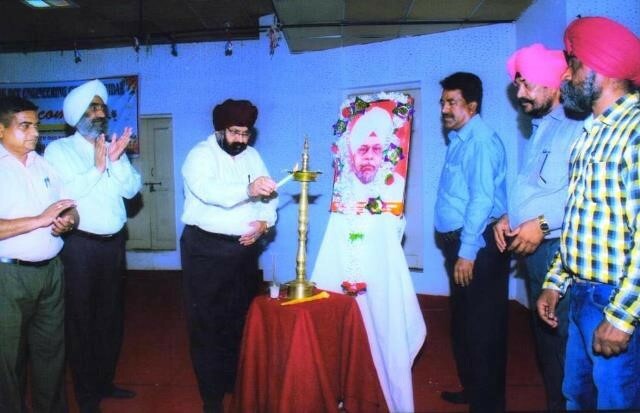 The workshop was inaugurated by, Dr. Sardar Balbir Singh, honorable president of SNJSF. 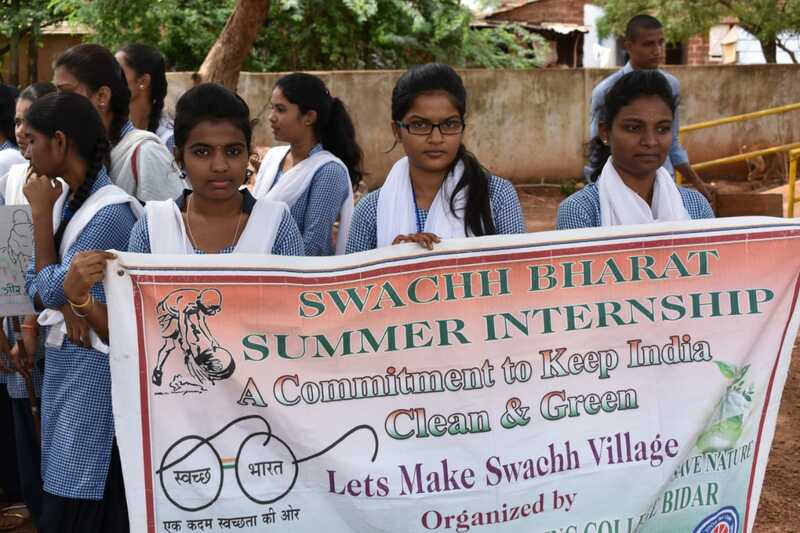 This programme trained nearly 45 participants of various parts of the country. Beam scanning antenna, Sector antenna (fixed narrow multi-beam system), Diversity antenna, SDMA antenna, MIMO antenna. 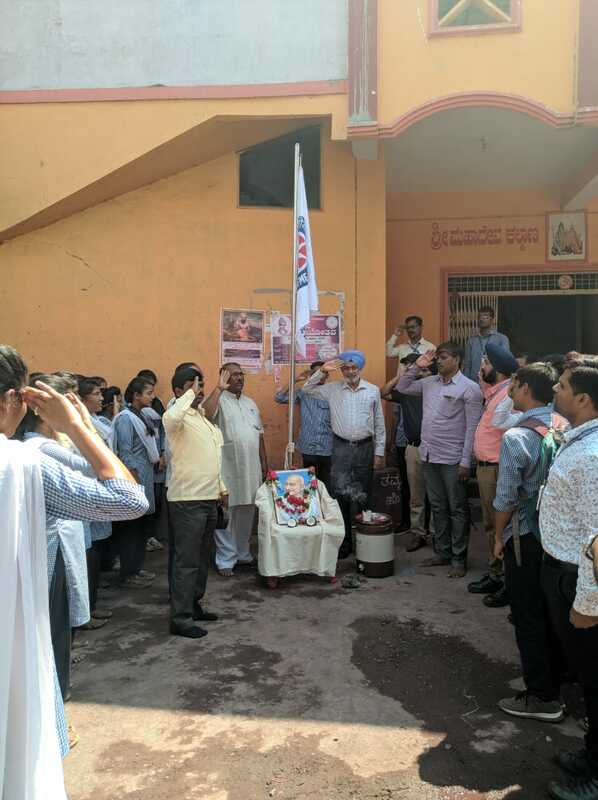 This FDP was coordinated by Dr. Ravindra.E, Dr. Md.Bakhar & Dr.Veerendra.D of E&CE dept., Guru Nanak Dev Engineering College, Bidar. Silicon Association (SiA) of E&CE Department has organized two days National level Techno cultural fest E-Buzz- 10 on 26th & 28th November 2018. 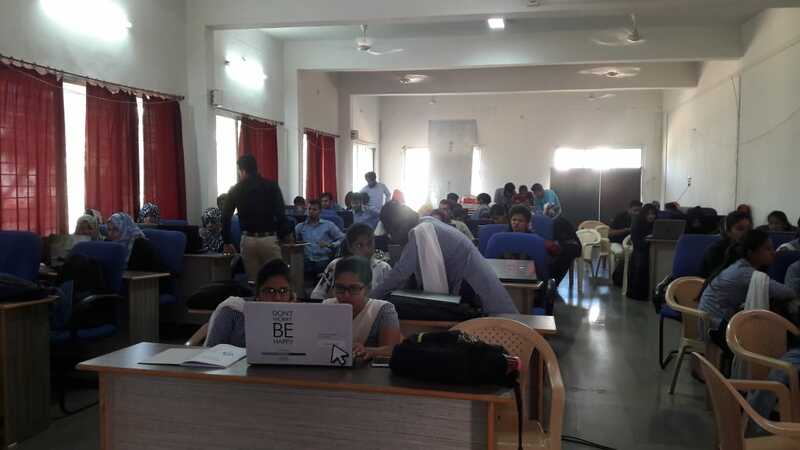 A total of 970 students from various parts of the country have participated in E-Buzz-10 events. This fest was a platform to exhibit the skills and innovative ideas of the students. 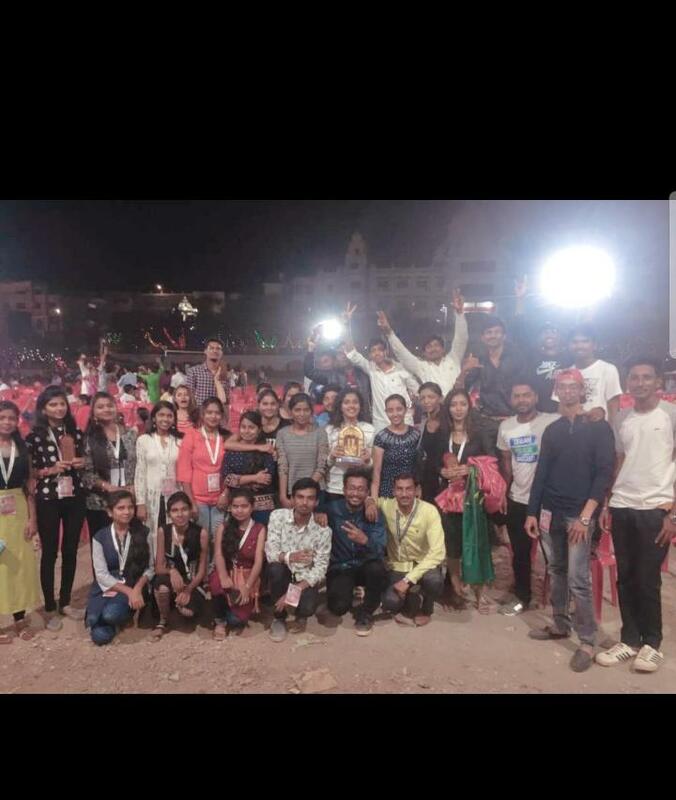 Dr. Ravindra Eklarker was the Chairman, Dr. Kishan Singh was the convener and Miss.Savita Hugar was the vice chairperson of this fest and Mr. Srinivas was the joint vice chairperson of this fest. 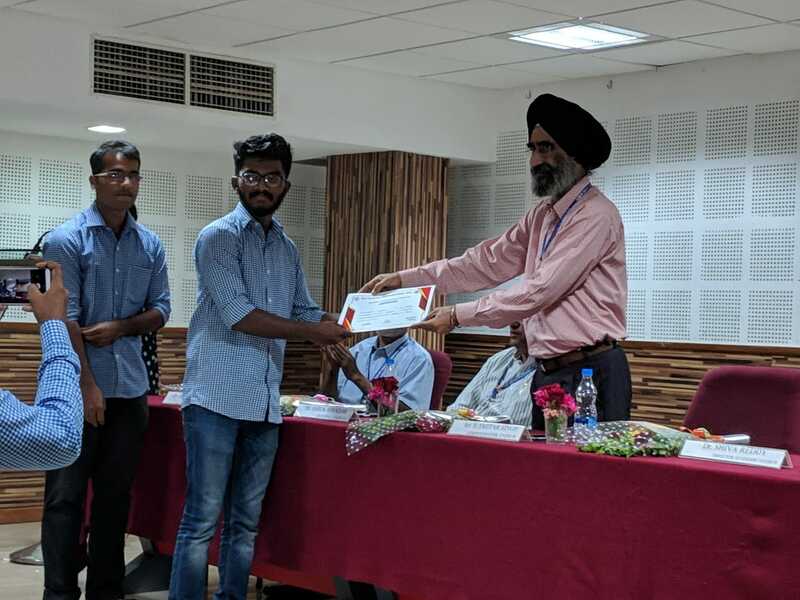 Students of Civil Engineering Department and all the Faculties of Civil Engg Dept have participated in Workshop organized by Department of Civil Engineering GNDEC, Bidar. The Students took part in workshop of civil engineering department. Further Students took an initiation to attend panel discussions also in the workshop by civil engineering department. 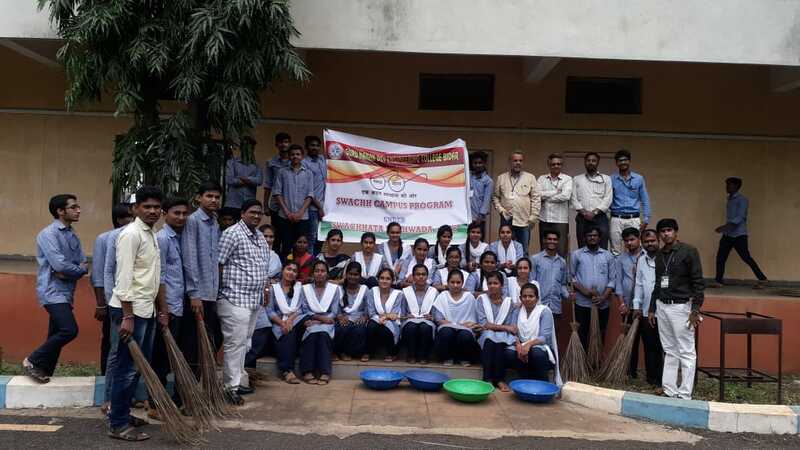 The Financial Support was aided by Management GNDEC Bidar in association with ACCI Bidar centre. The H.O.D (civil), Dr B.B Kori was the Conveyor for one day workshop. All the final year students of civil engineering and faculties were present . A Center of excellence is being established in our college in collaboration with ICT Academy and Salesforce for conducting training and supports in Salesforce technologies. 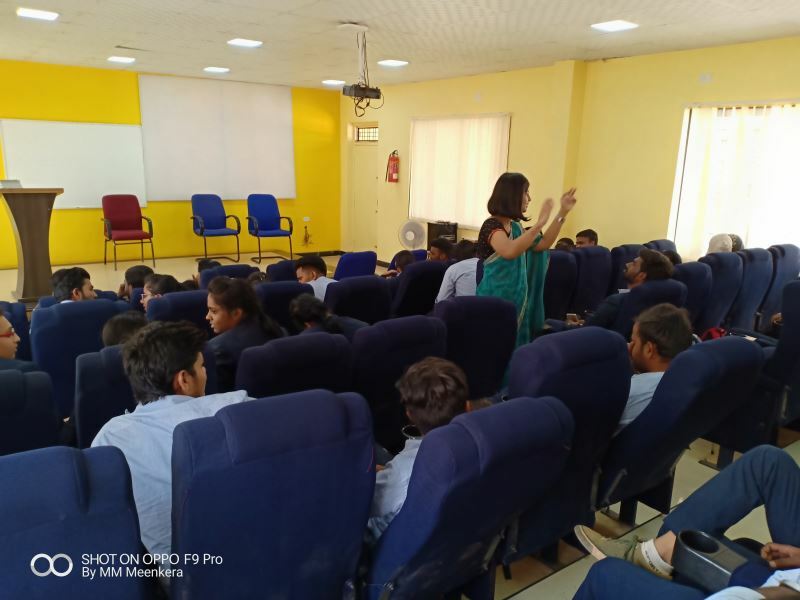 ICT Academy in partnership with Salesforce proposes to offer Industry specific student skill development programs for Circuit branch students from the academic Institutions. The proposal was submitted to offer training of students in the academic institution. Salesforce programs can provide access to students for obtaining industry-recognized credentials that can help students succeed in their IT Industry career. 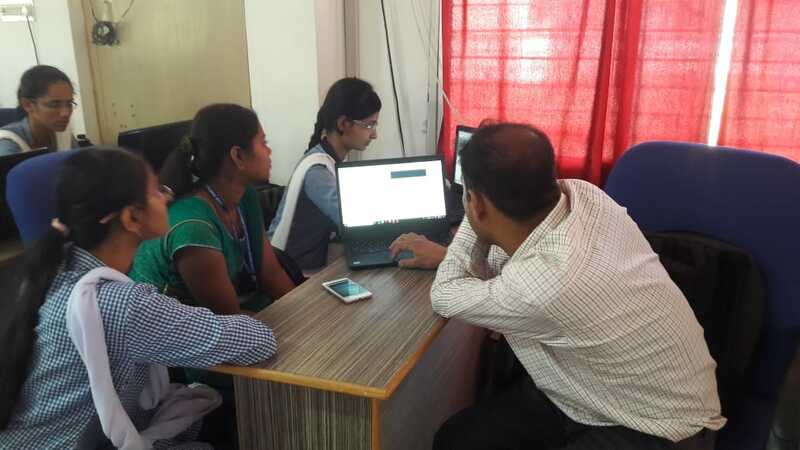 The inspiration behind the initiative is that, colleges who obtain Salesforce partnership shall consider making Salesforce programs compulsory for students or integrate the development of these skills into the teaching learning program by allocating credits to these programs. This delivery model is specifically designed for Academic institutions to offer a richer learning experience, thereby creating a more employable and industry-ready workforce. This course shall be delivered to the students through Direct Trainer model. The benefits the Kalburgi region is going to get from this collaboration is the opportunity to lead the ecosystem through regional Salesforce User Groups. The trainees will be getting the authorized curriculum for Salesforce professional certifications. The CoE will be the regional hub for this training w.r.t ICT academy’s Salesforce technologies training. The trainees will be getting the Authorized Certificate from Salesforce and ICT academy. The Main beneficiaries will be the students of pre final and final year of any Graduate of B.E/B.Tech,B. Sc., B.C.A, M.Sc., MCA. 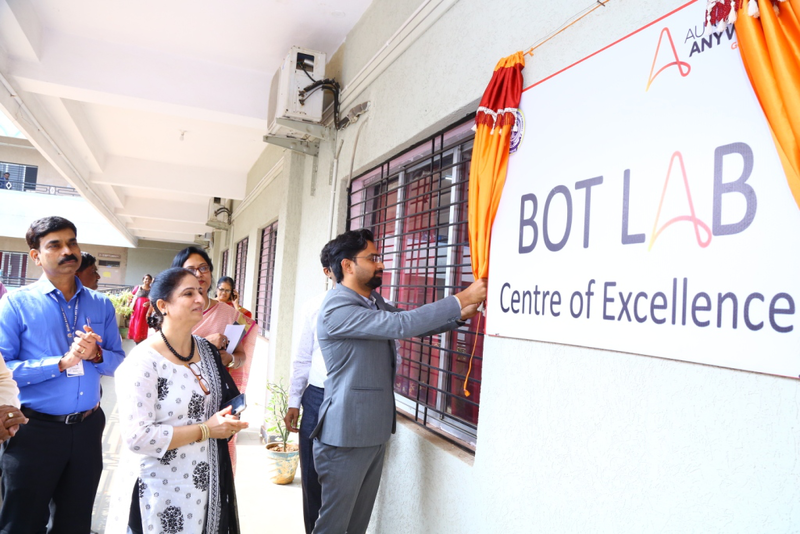 The inauguration of the Center of Excellence has been done on 16th November 2018. In presence of Mr. Kiran Manyala, Developer Relations manager, Salesforce, Hyderabad, Mr. Vishwa Vikas, Associate manager Developer relations, Salesforce as well, Mr. Suresh Babu L Regional Head-South India, ICT Academy. 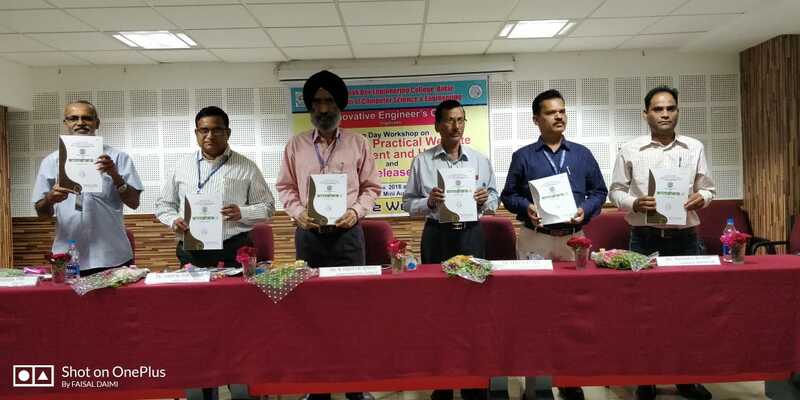 Department of CSE has organised Two Day Workshop on "Intensive Website Development and Web Hosting" and released a Department Magazine Anveshana-II on 10 and 11 Nov 2018 under the Banner of Innovative Engineer's Club. 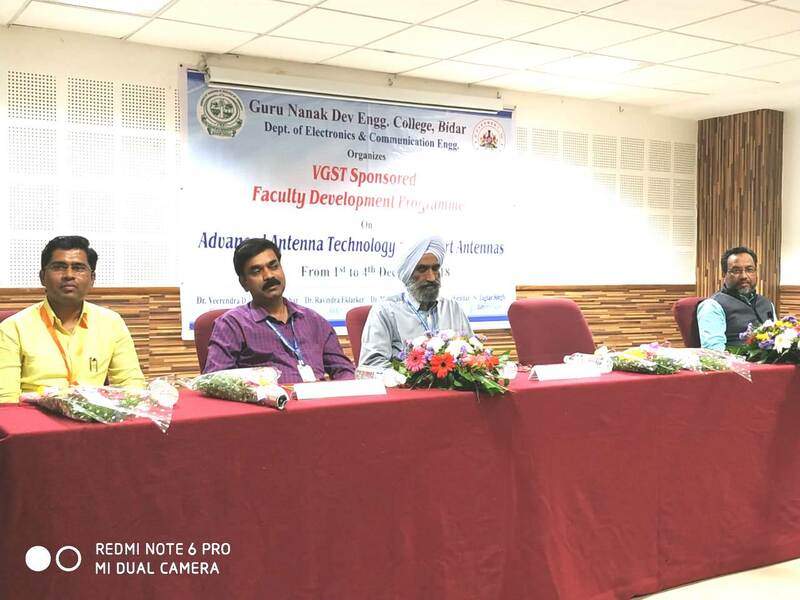 The Chief guest for Inauguration Dr. Ashok Biradar, Principal GNDEC highlighted the importance of innovation and importance of learning different technologies.This session is also chaired by Guest of Honor Sardar Jagtar Singh(Administrator),Dr Shivareddy M S(Director Academics), Prof. Ramesh Patil(Assoc. 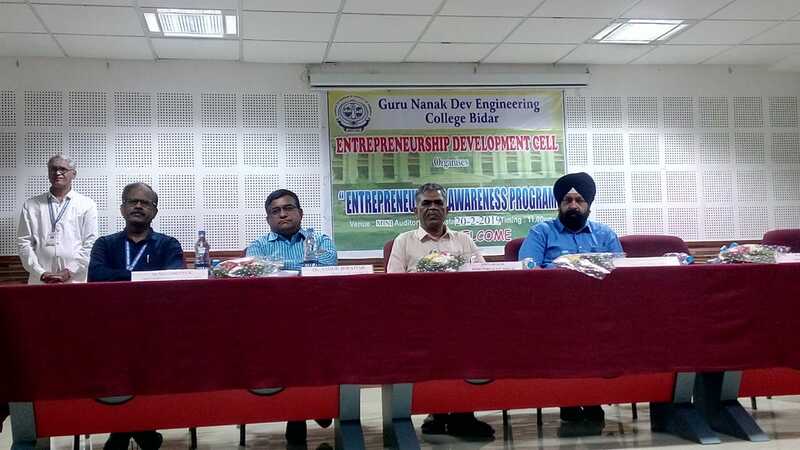 Prof E & C E Dept), Mr. Ravindra (Alumni & Co-partner Innoovatum ),Shaukat Koutwal(Alumni & CEO Innoovatum),Md. 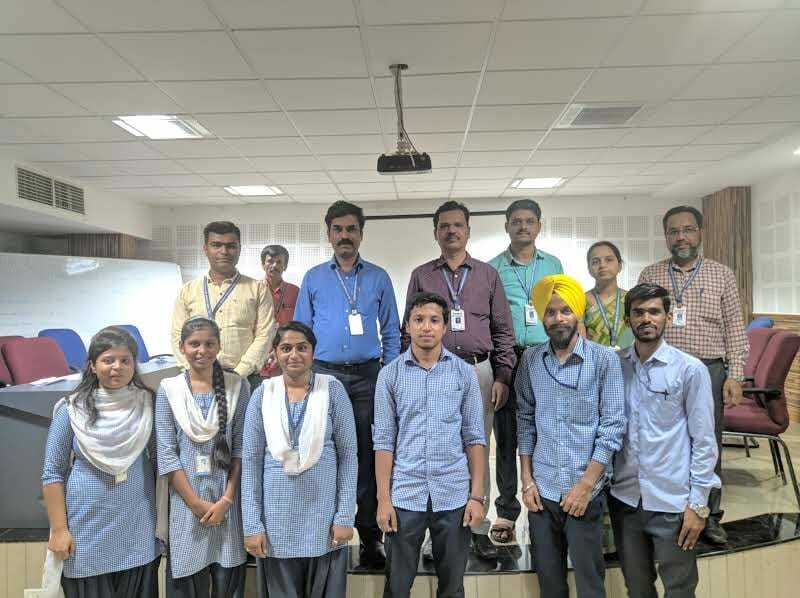 Abdul Sutar (Software Developer), Dr. Dhananjay(HOD CSE),HOD's of various deparments,Staff members and students and participant. During the inauguration prize 's were given to winners of IEC events. This session is concluded with vote of thanks by Dr. Dhananjay (HOD CSE). 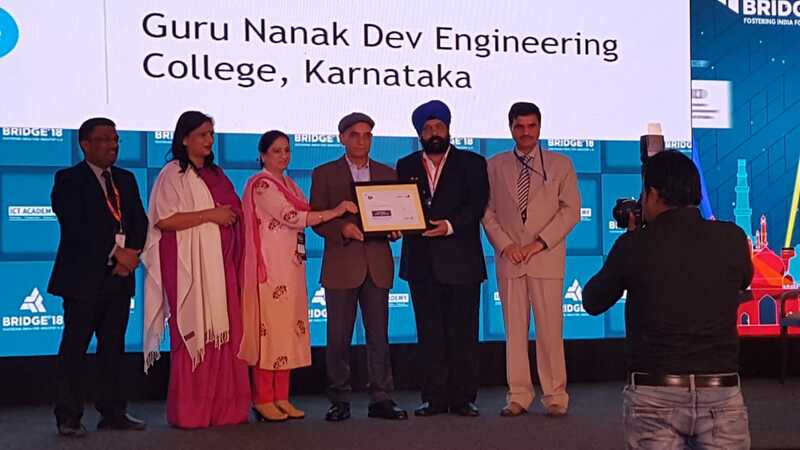 The Automobile Engineering Department of Guru Nanak Dev Engineering College Bidar was selected in the BMW SKILLNEXT technical skilling initiative. Under this initiative the department is donated with BMW twin power 4 cylinder diesel engine with 8 speed steptronic automatic transmission system on 08-09-2018. 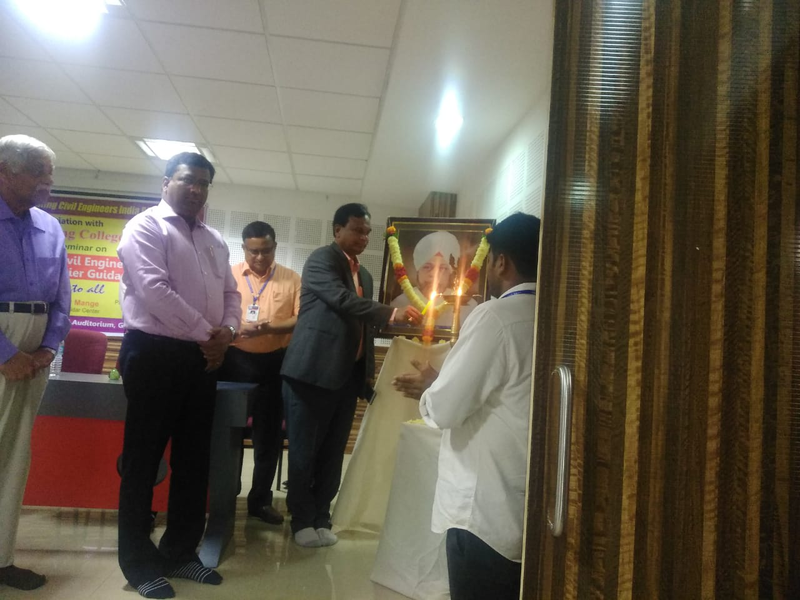 The inaugural ceremony for the same was organized by the department on 10-09-2018. 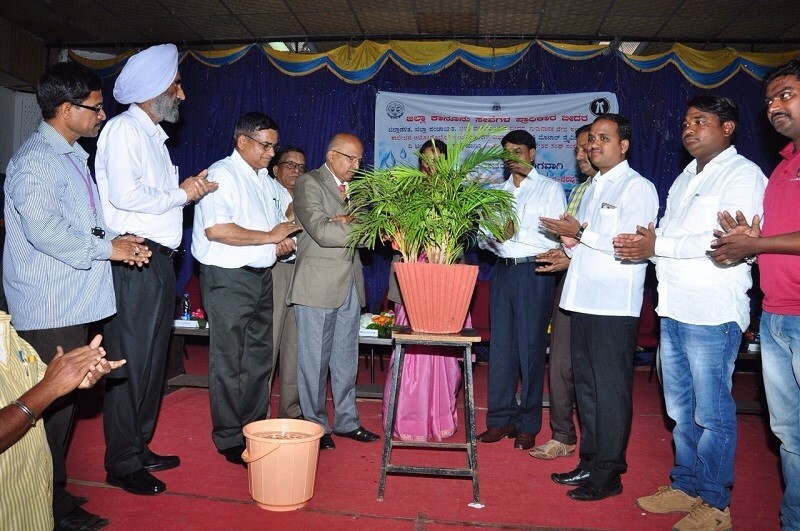 Mr Vishwanath, RTO Bidar inaugurated the ceremony, Dr Balbir Singh, Chairman, was the Guest of Honour. Dr. Ashok Biradar, Principal, S Jagtar Singh, Administrator, Prof. B. K. Purohit, HOD, Heads of other departments, Staff were present. 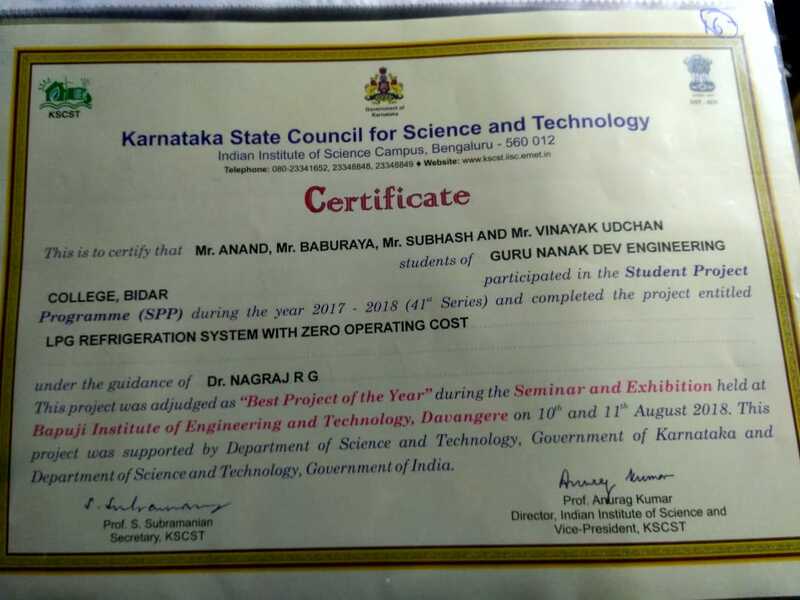 Best Project of Year selected by KSCST during seminar and Exhibiton at BIET Davangere. 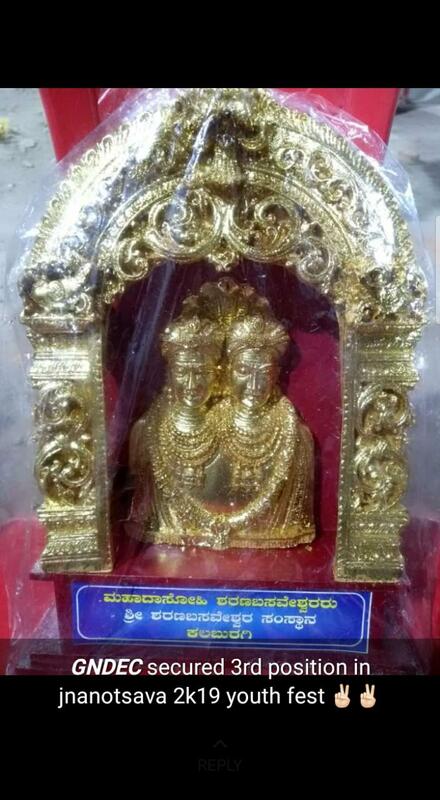 This project was adjudged as "Best Project of Year" during the seminar and Exhibition held at BIET Davangere on 10thAug and 11th Aug-2018. 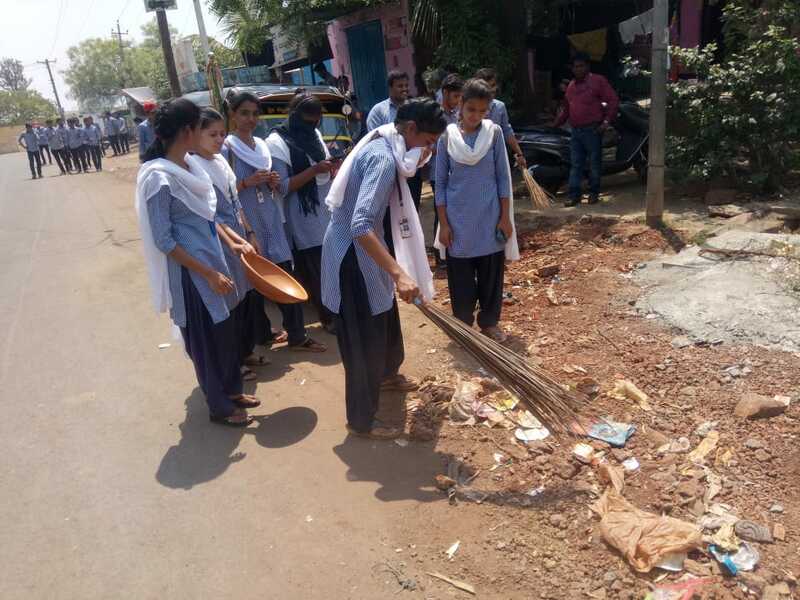 This project was supported by Department of Science and Technology, Government of Karnataka and Department of Science and Technology, Government of India. 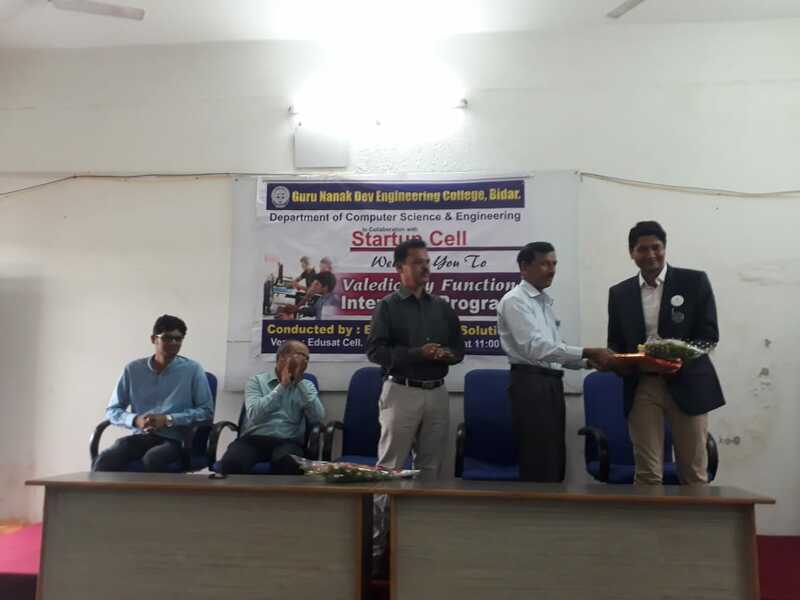 Department of CSE in Collaboration with Startup Cell has organized a valedictory function of four week internship program held at Edusat & Startup Cell, GNDEC.Function is organized on 12 th Aug 2018 at 11:00 AM Sunday. Chief guest of the function: Dr. Shiva Reddy, Director Academics. Mr. Rakesh Bisht, Industry Expert, Empowerment Solutions, Delhi NCR.Prof. 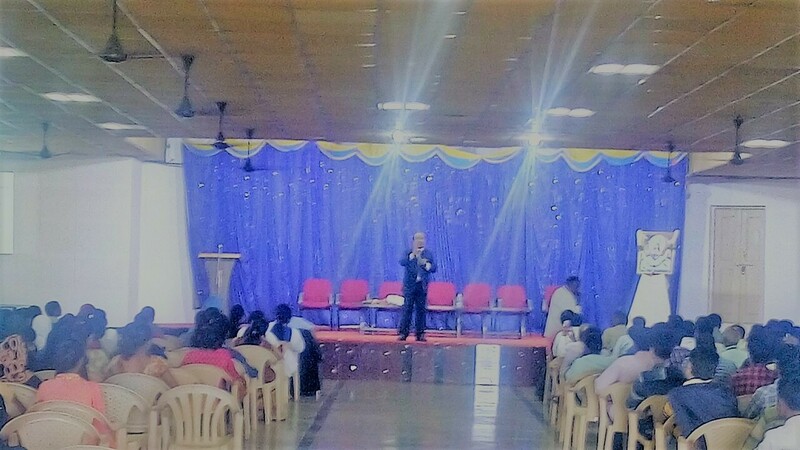 Ramesh Patil, HOD CSE.Prof. Rajshekar Gaithonde, TPO.Prof. Durgesh Shastri, Internship Coordinator. 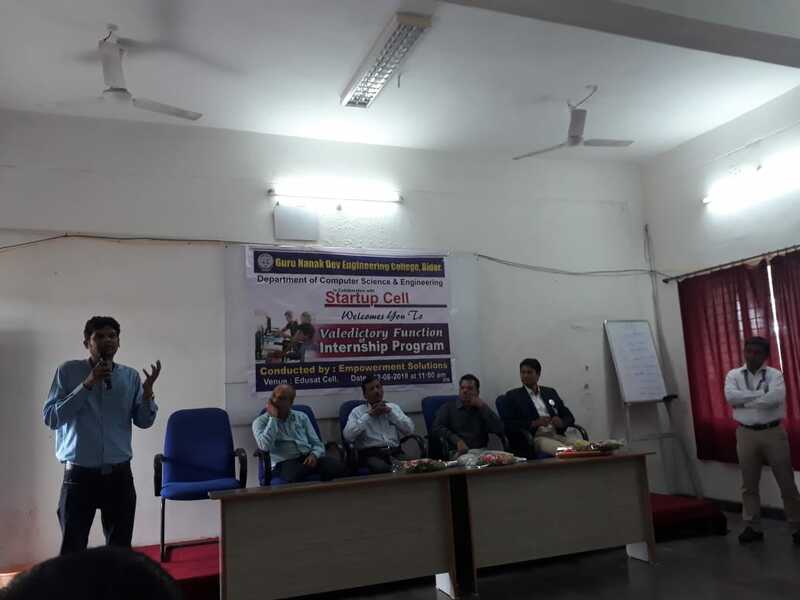 Prof. Durgesh shastri, has given a talk on one month internship program. Prof. Ramesh Patil, addressed the gathering with motivating words and explained them the importance of this program in their career. 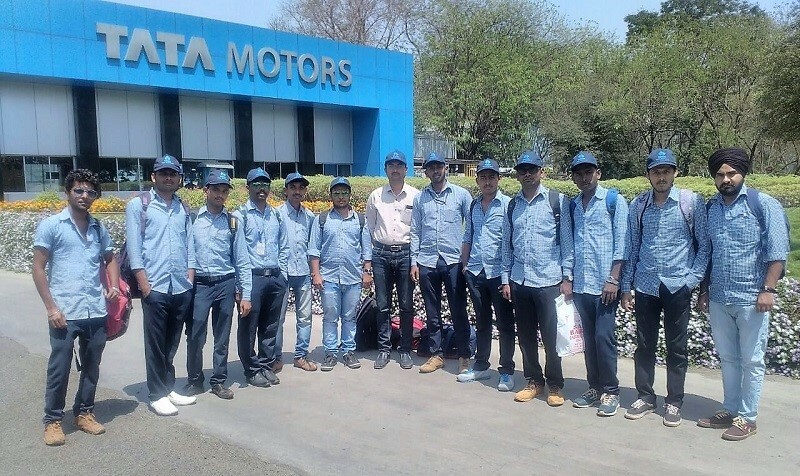 Dr. Shiva Reddy explained the importance of this genuine internship program and how exactly it improves your industrial skills. More than 12 students have come willingly and given feedback. Vote of thanks by Prof. Gururaj S.
Anchored by Prof. Mahesh Hundekar. The Mechanical Engineering Dept has organised 3 days FDP on " Noise and Vibration Measurement and Analysis" from 26 to 28/07/18 conducted by Mr. Kumaraswamy from Siemens company B'lore. PRAVAH, is the long awaited magazine of E&CE Department for the academic year 2017-18. The name of the magazine PRAVAH may seem unique, but it just means flow, the act of flowing; continuous progression. This magazine gives an insight into GNDECB way of life, their creativity and activities. This magazine is a platform that exhibits the literary skills and innovative ideas of faculty and students. PRAVAH presents the hard work and dedications of students and contributions of faculty for this academic year. 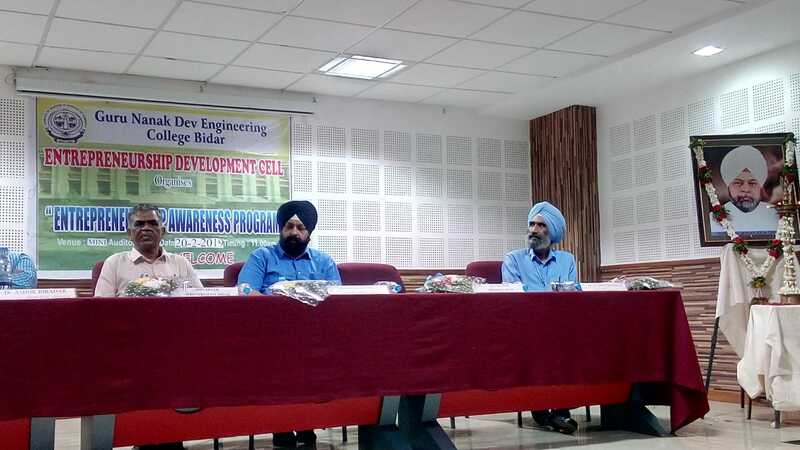 A 3-days FDP on "Embedded System Design Using ARM CORTEX M3 was inaugurated at the Guru Nanak Dev Engineering College, Bidar on 29/01/2018. 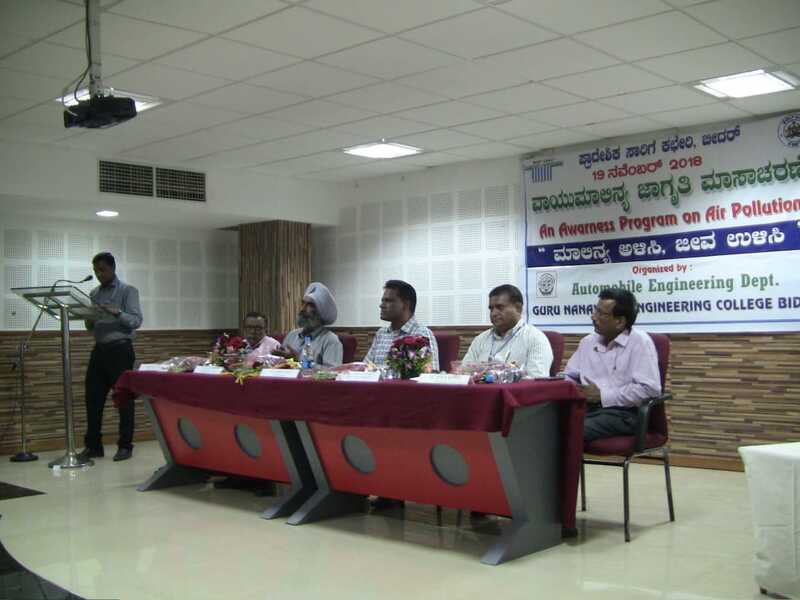 The FDP is organized by the Department of ECE, GNDEC, Bidar in association with ALS, Bengaluru. 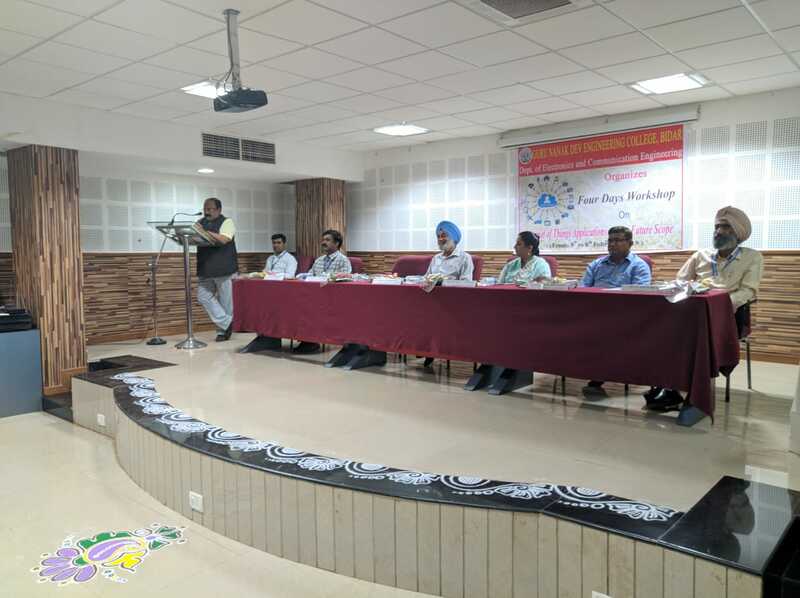 Mr. Jeevan Kataria, Technical Advisor, ALS Bengaluru addressing the participants inaugurating the FDP said, in present competitive world opportunity never comes repeated so students pursuing the professional courses must prepare themselves to grab the prospects as if it comes to them. Instances are there when individuals not prepared to meet professional challenges instead have second thought on it. But one must gave hard try before letting the opportunity go which sometimes give astonishing results, he stressed. It was never one should lose the hope and keep goes on trying, he added. 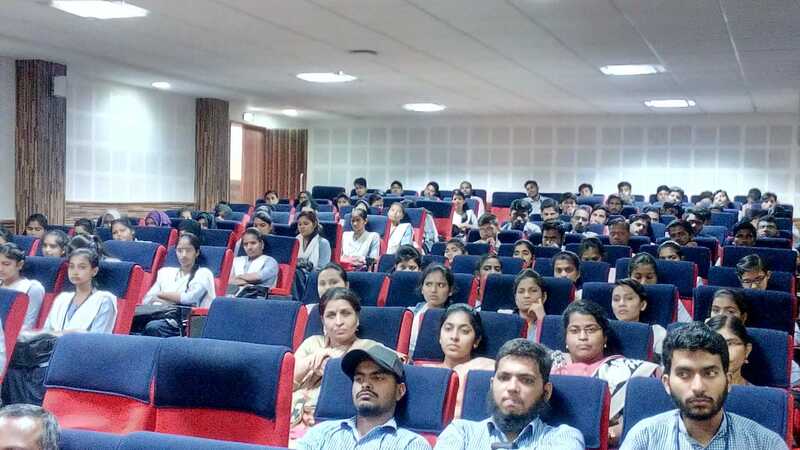 Mr. Chidambar K, Marketing Engineer ALS, Bengaluru in his guest note said that, this is an attempt to prepare the students pursuing professional courses to meet the challenges of industry. It enhances the employable aspects of the candidates and bridges the gap of industry and academia which remains a major challenge in present times. Participants therefore not only had the opportunity to enhance their technical skills but it was the value addition for them in terms of professional growth in future, he said. Principal Dr. Ashok Biradar in his presidential note highlighted efforts, resources from their institution put in place to make the facility a reality which he termed one of its kind in entire Hyderabad Karnataka region. Urged students to avail the opportunity offered by the college and shape their professional meet future challenges. 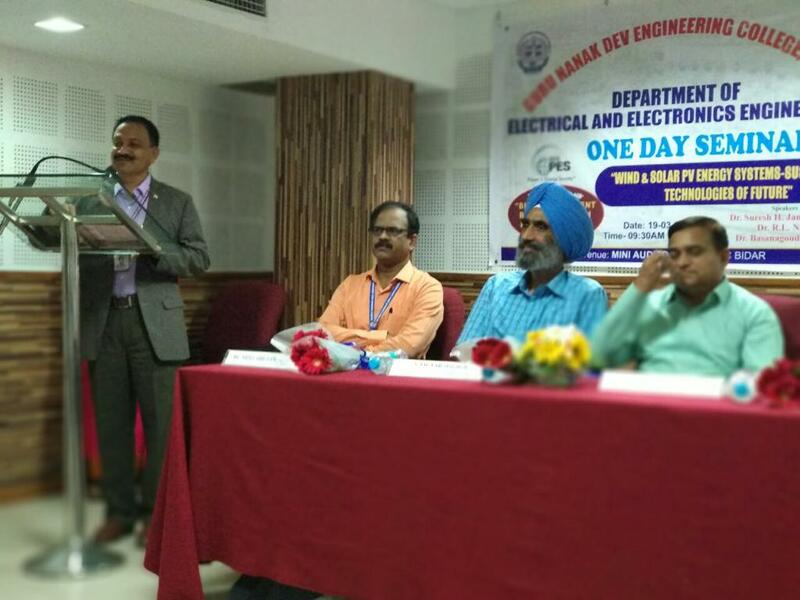 Electronics and Communication Engineering Head of Department Dr Ravindra Eklarkar motivated the participants to make use of this program positively. Dr. Anuradha, Convener of the event delivered the welcome speech Dr. Kishan Singh delivered the vote of thanks. 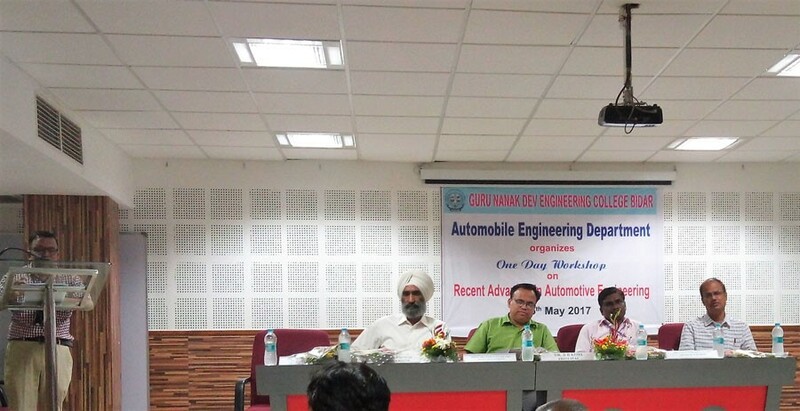 One day workshop was organized by Automobile Engineering Department on the topic "Recent Advances in Automotive Engineering" Coordinated by Prof. Suresh Dabke and Convened by Prof. B. K. Purohit, HOD. Prof. Shankrayya, HOD, Mech. Dept. 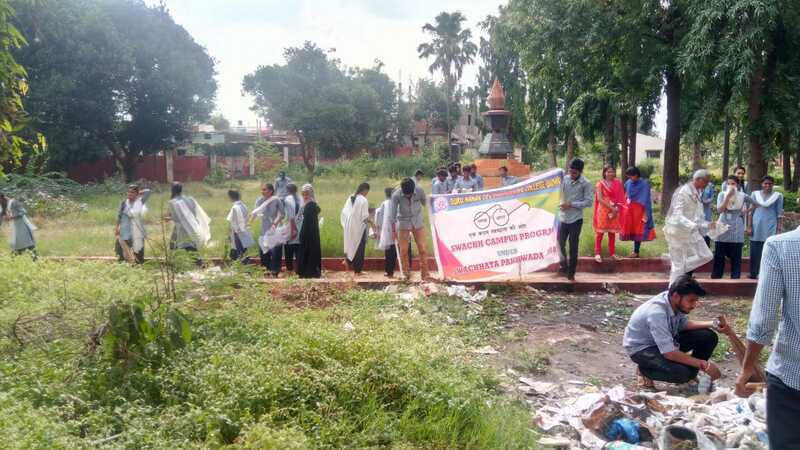 TRRCT Hyderabad and Dr. Sangamesh G. Sakri, Prof. E & E Dept, PDACE Kalburagi were the resource persons. Total 50 participants attended the workshop. 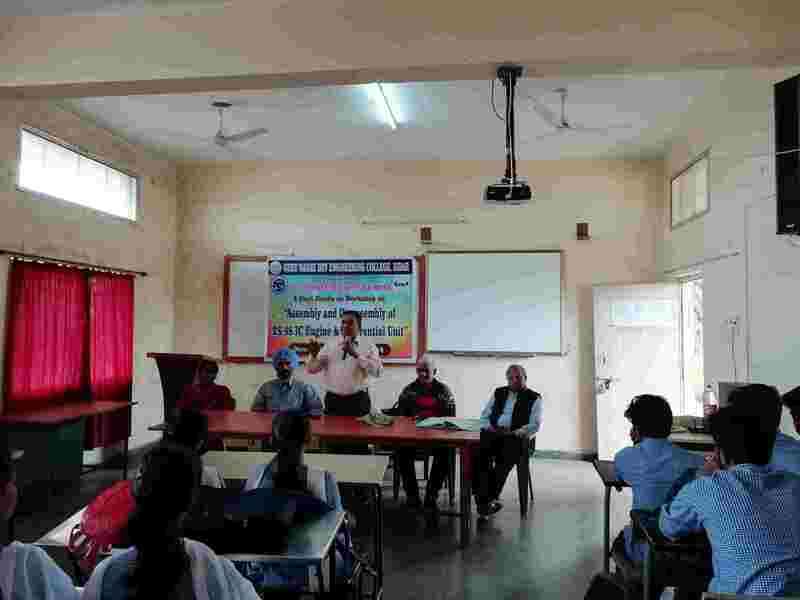 IEI Student chapter, department of civil engineering of Guru Nanak Dev Engineering college, Bidar and KSPCB-Bangalore jointly organized technical talk on "POLLUTION CONTROL LAWS" on 9th March 2017. Resource person for the above talk was D.R.Kumarswamy, Chief Environmental Officer, Karnataka State Pollution Control Board, Bangalore. 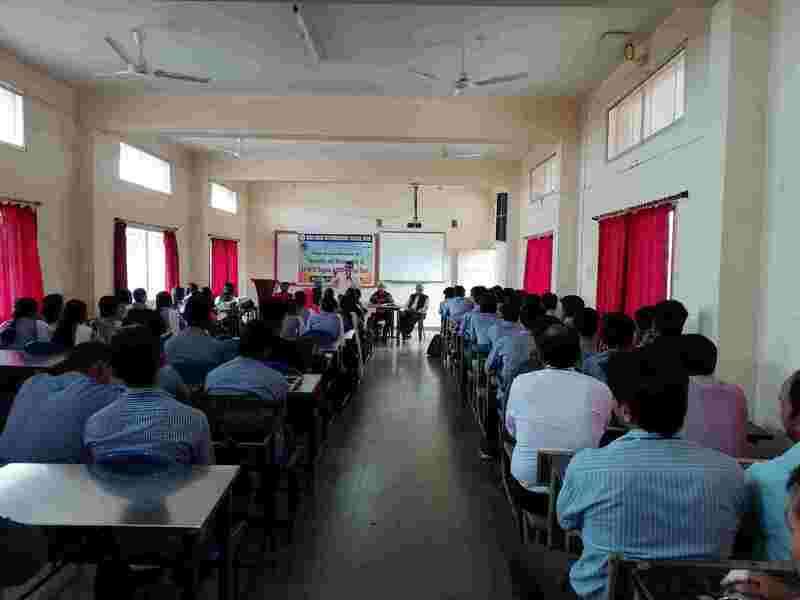 All the faculty members of Civil Engg dept and final year students have attended the technical talk. 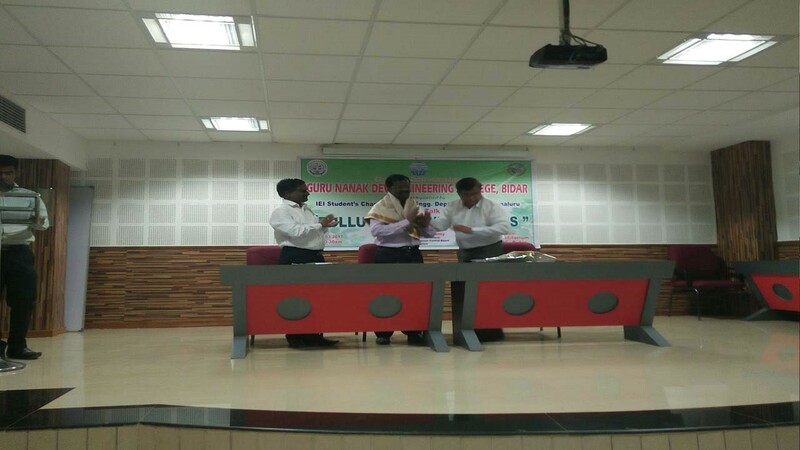 The event was held at Mini auditorium of the college and was presided by D.R.Kumarswamy, Chief Env. Officer KSPCB, Bangalore. 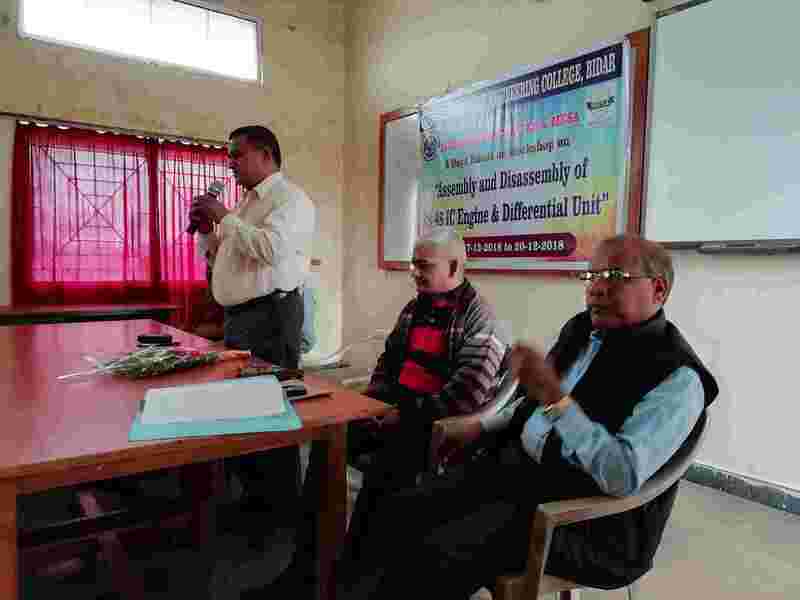 Dr. Ashok H.Biradar, principal GNDECB and Dr. B.B.Kori Prof & Head of Civil Engg dept. 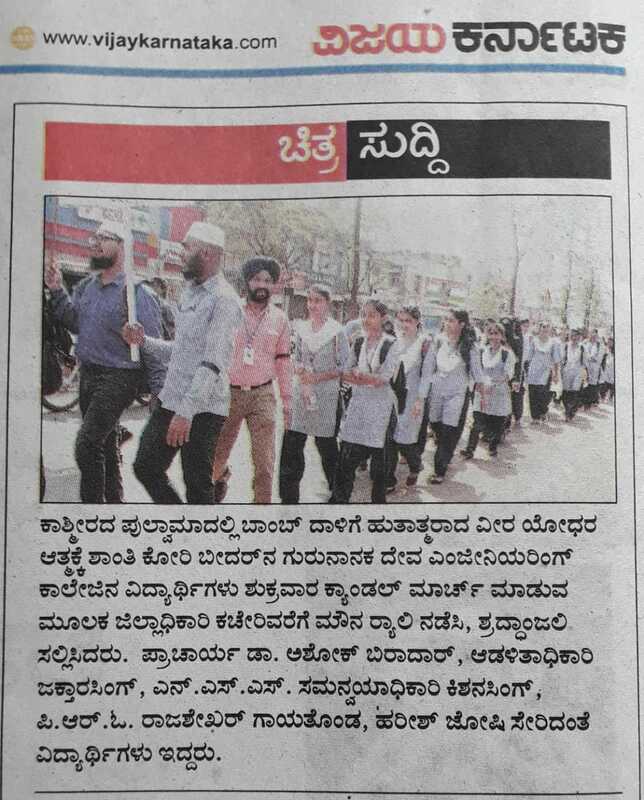 Conducted by ISTE Students chapter GNDEC Bidar on 20th and 21st of April, 2017. The Inaugural ceremony of technovision-2017, the 12th edition of technical symposium was held at main auditorium of GNDEC Bidar. 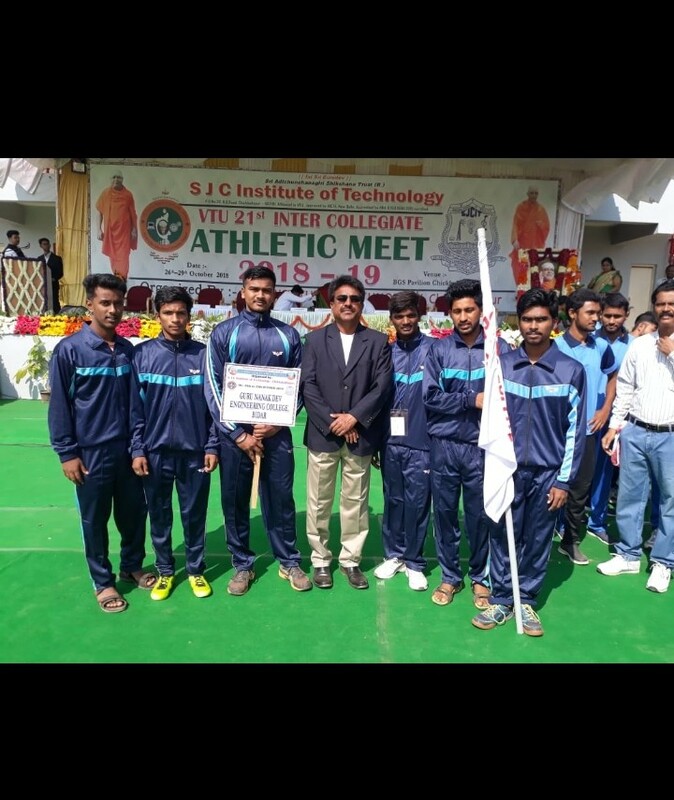 The chief guest on this occasion was Mr. Basavaraj Y.K, Manager, KSFC, Bidar. Speaking on this occasion he advised the students to use this opportunity to enhance their soft skills and technical skills. He narrated how as a student difficulties in bringing a project to computation. He advised with lot resources in available in over ---. 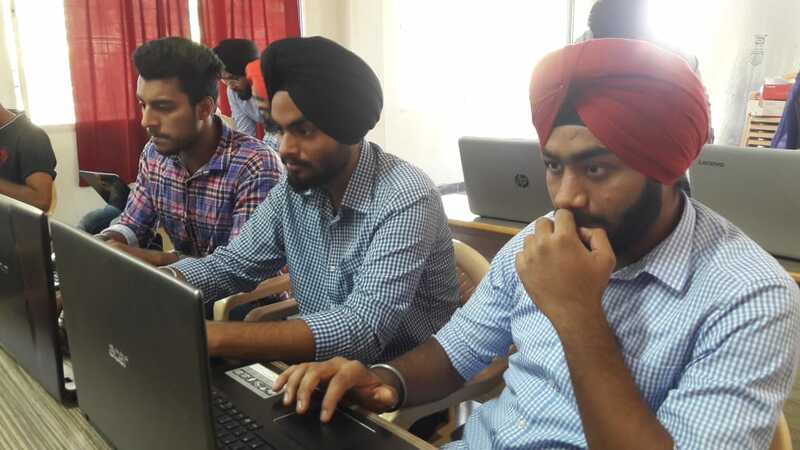 The students should utilize these technologies to enhance their skills at computing level. 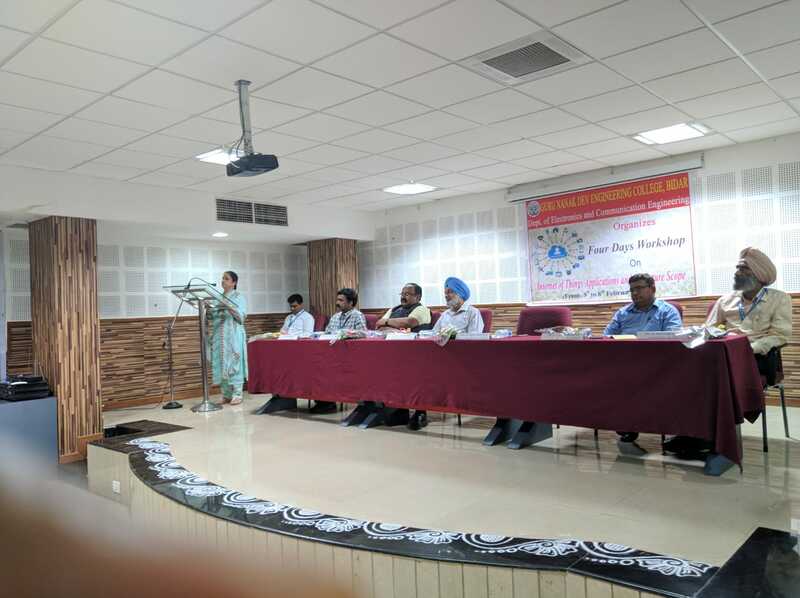 Mrs. Reshma Kaur, VCP, GNDEC Bidar addressing the gathering advised the students to use these technical symposium to evaluate them selfs and be ready for global competition. She mentioned that if the student have good attitude and determination will lead to success. She is stressed on how important role such technical symposium and training play in moulding their future. She encouraged the students to participate actively in every event. 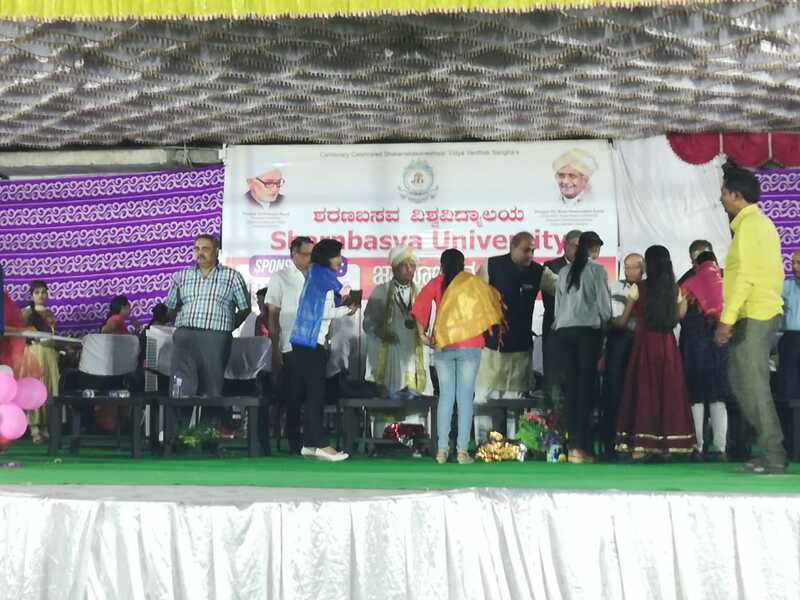 Guest of honour Prof. Devendra Kamal, Retired Professor, BVB College Bidar. 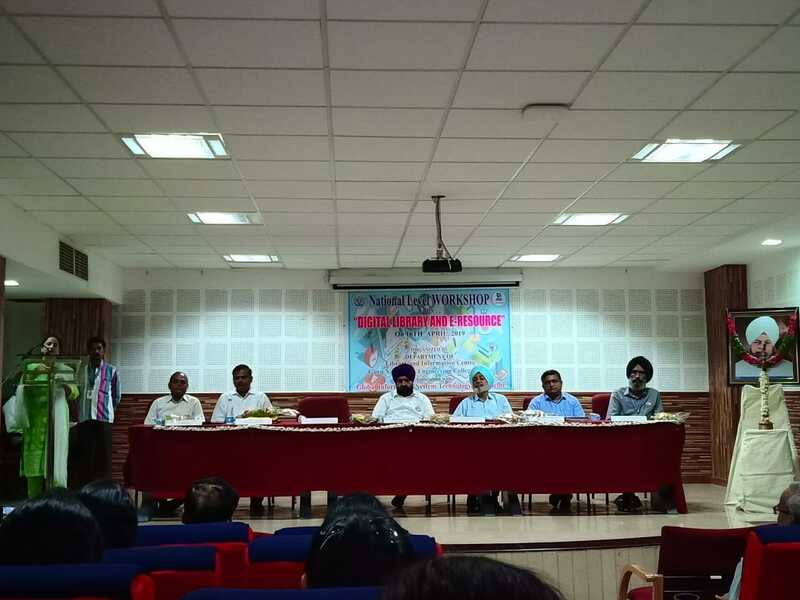 Administrator Saradar Jagtar Singh, Chariman ISTE, Dr. D. Choudhary, faculty advisor, Dr. Nagraj G were present on the occasion. 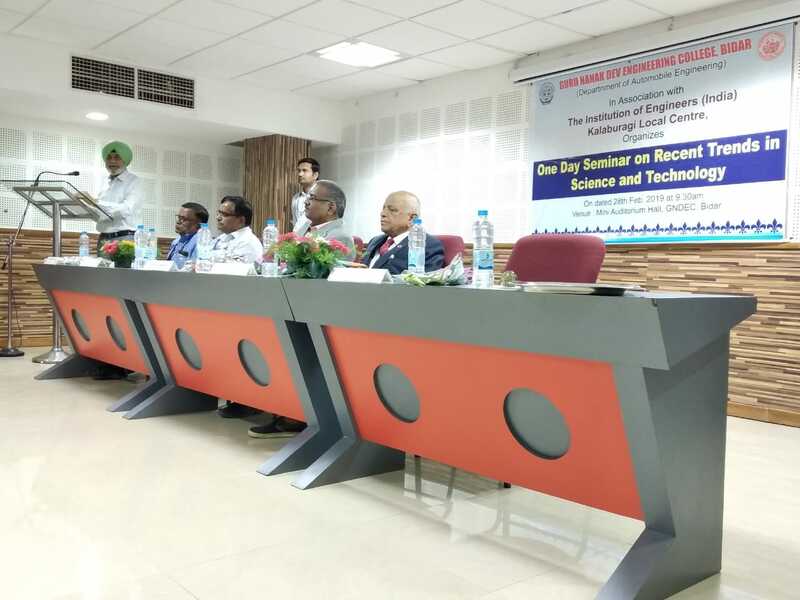 The inaugural ceremony was attended by HOD's of various departments, faculty and core members of students from various colleges of India and few students from other countries. 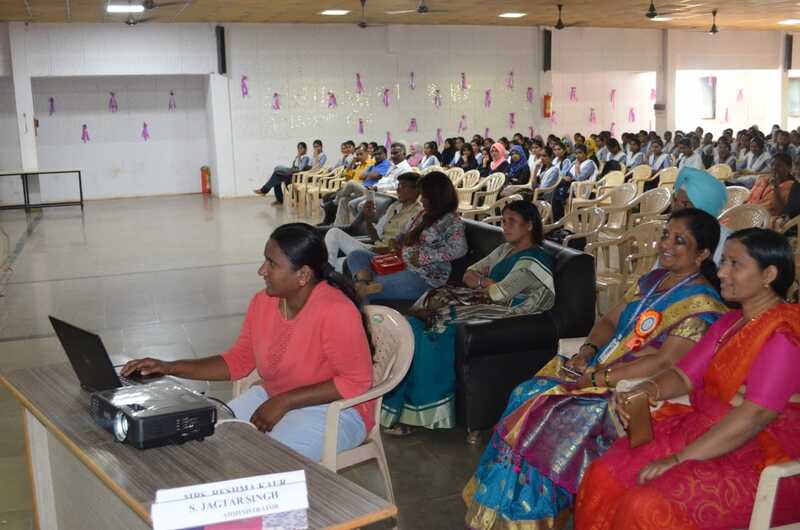 The program was enhanced and coordinated by Mr. Rachel Rodney as Ms. Lithika Bajaj and team members of ISTE students chapter GNDEC Bidar. Vaious technical events are scheduled during this technical symposium. 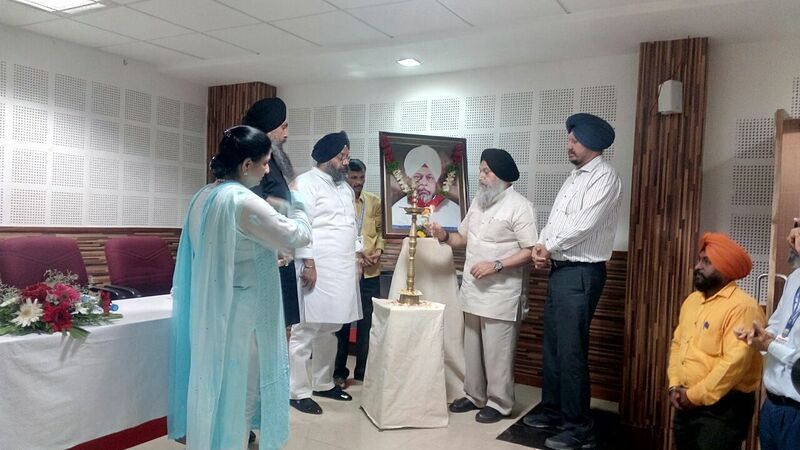 On the occasion of 82nd birth anniversary of Panth Ratan Shiromani late Joga Singhji, founder President of Sri Nanak Jhira Saheb Foundation and Guru Nanak Dev Engineering College (GNDEC), to commemorate the occasion GNDEC launched start-up cell. 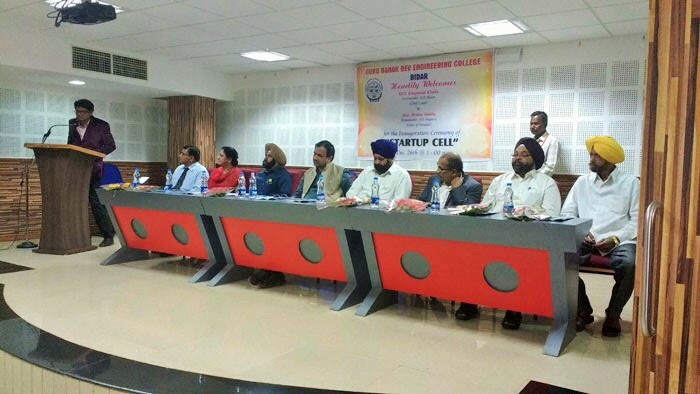 Member of Parliament Bhagwanth Khuba inaugurating start-up cell at an event held at mini-auditorium hall in GNDEC on Monday, has said this venture will facilitate the upcoming entrepreneurs where expert will share valuable inputs and the technical know-how to those who are interested to launch their own venture. 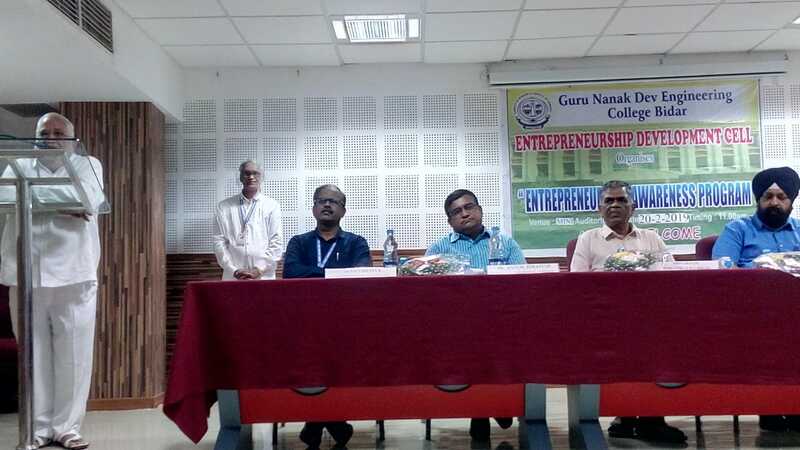 Referring to the efforts of GNDEC, Mr Khuba said the start-up concept launched by Central government is dream concept of Prime Minister Narendra Modi which aimed to extend technical and financial support to budding entrepreneurs. So the initiative taken up by GNDEC will turn as boon for professional talent of this region. He also promised of securing financial support from the Centre for start-up cell. 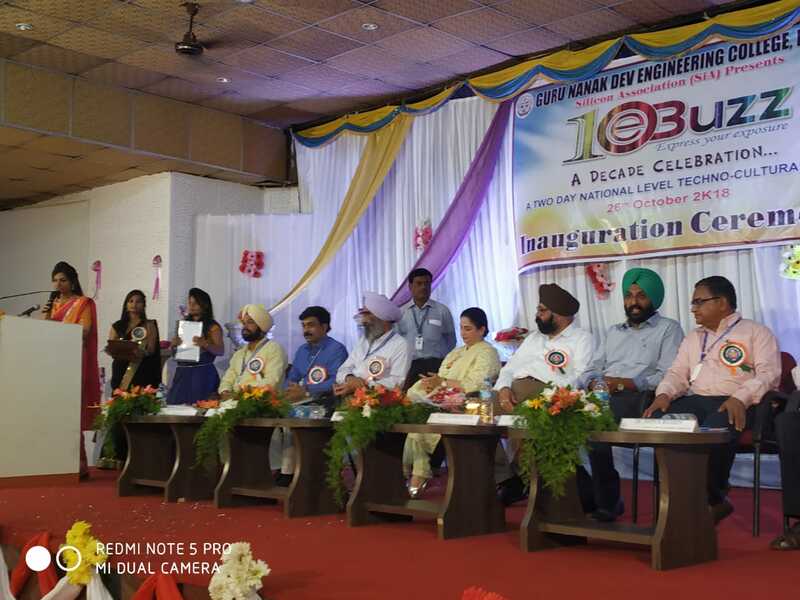 GNDEC Vice Chairperson Reshma Kaur in her remarks said their institution will come up with such initiatives in future and extend their support. 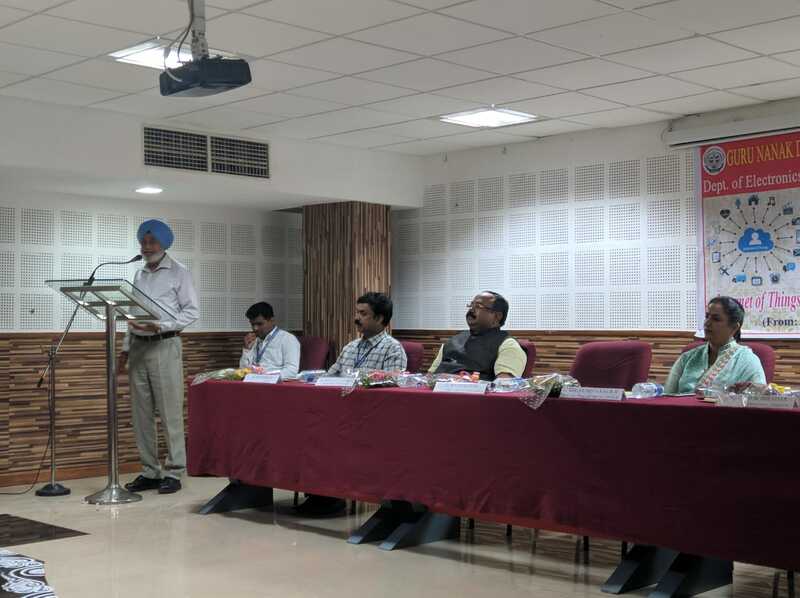 GNDEC Chairperson Balbir Singh presided over, Bengaluru�s CMR University Pro Vice Chancellor DH Rao, Mr Preetam Singh, Mr Darshan Singh, Mr Nanak Singh, were present. 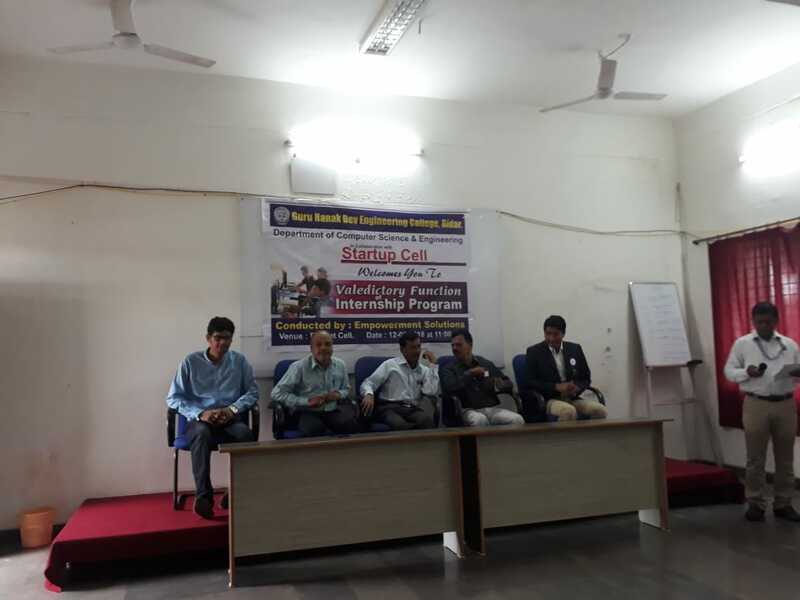 Earlier Start-up cell Coordinators Professors Durgesh Shashtri and Mahesh Hundekar briefed the gathering on aims and objectives of launching the initiative. Also saplings were planted by our alumni on median of Mailoor Road on this occasion. 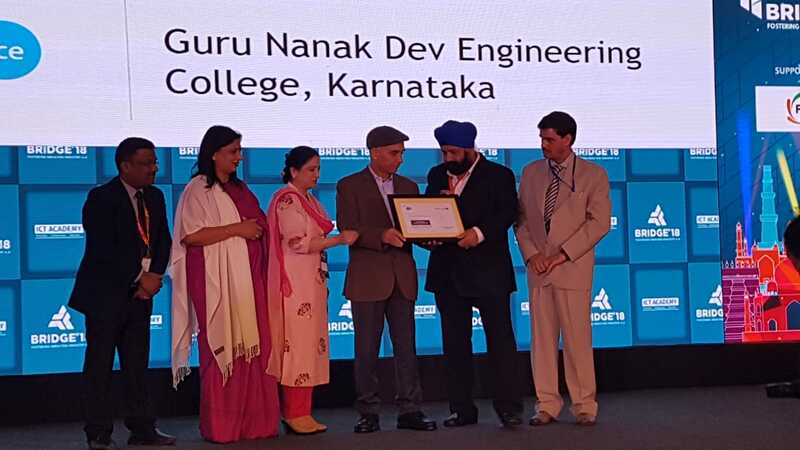 Bengaluru's based monthly newspaper Shikshan Gyana selected Guru Nanak Dev Engineering College (GNDEC) of Bidar as best educational institution in the State. 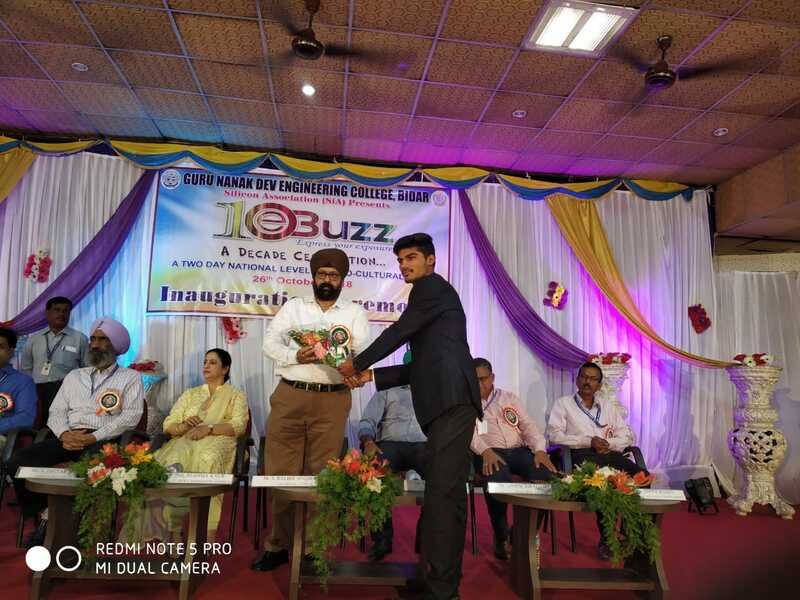 The honour consist of citation and memento presented in association with Rotary Club of Kolar at a public function held at Channayya Rangmandir recently at Kolar. Shikshana Gyana publish monthly educational newspaper did survey of institutions working in the field of education. 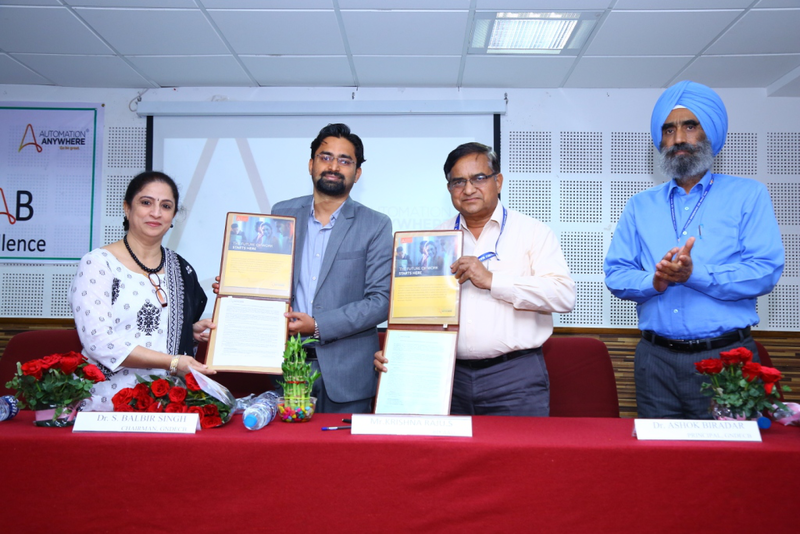 Based on their findings GNDEC got selected for imparting quality education to the students and services rendered to churn out the quality talent in the field of technical education. The honour was presented by Karnataka High Court former Judge H Bilappa. It was received by Dr Neelshetty, HoD EEE Department and Professor Rajshekar Gaithonde, Training and Placement officer. 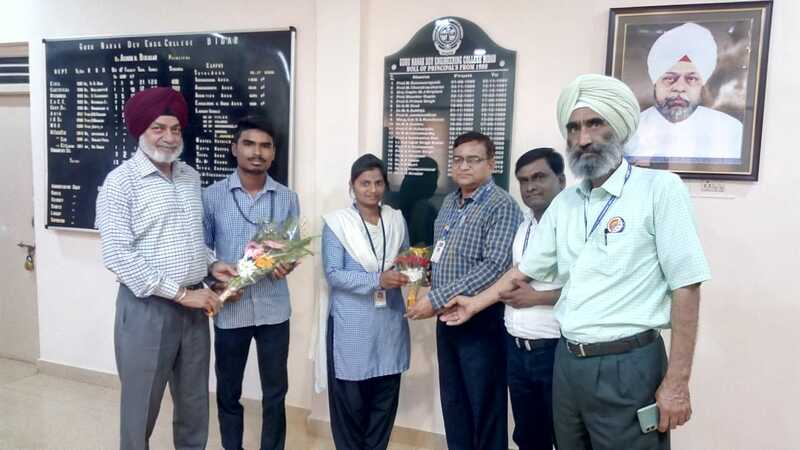 Chairman Sardar Balbir Singhji, Vice Chairpersons Reshma Kaur, Principal Dr Ashok Biradar congratulated teaching staff and students for the feat. 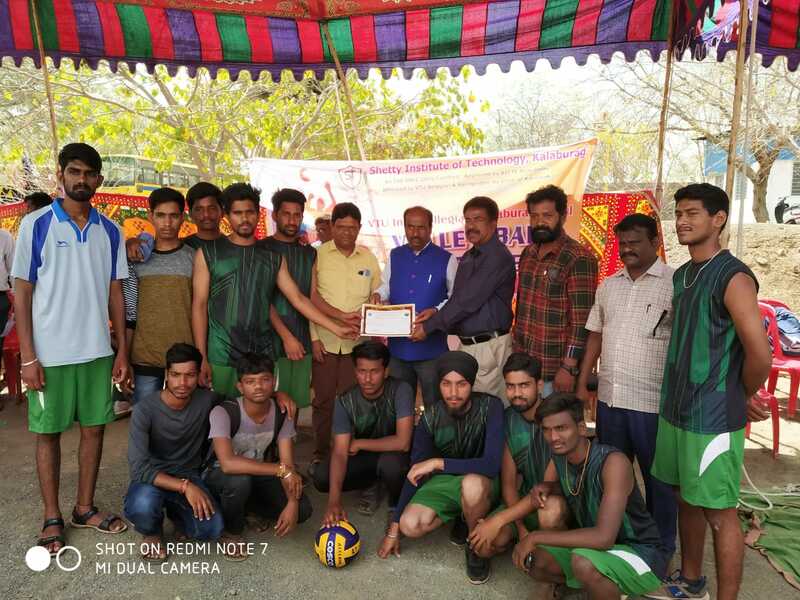 GNDEC Bidar students has got 2nd Runners up in VTU inter collegiate kalaburgi zonal level volley ball Championship 2018-19. 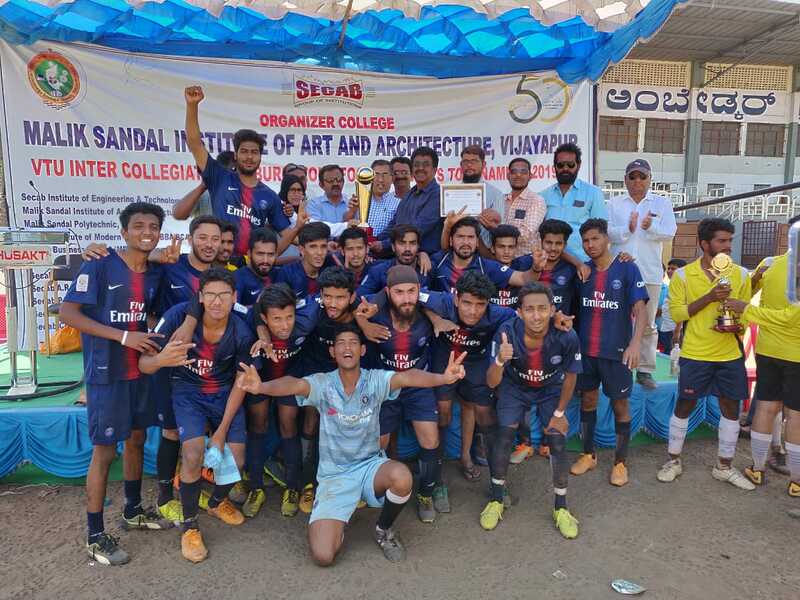 Guru Nanak Dev Engg College ,bidar students has won VTU inter collegiate kalaburgi zonal level Football Championship of 2018-19 .Three time in row. 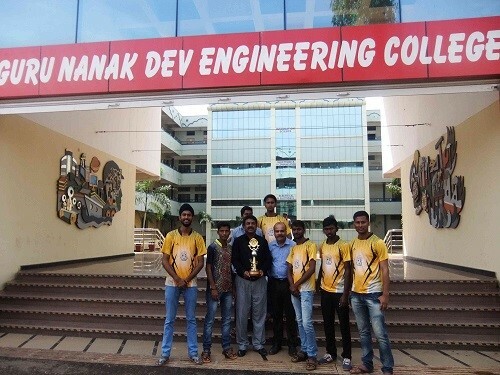 Guru Nanak Dev Engineering College Bidar has organized VTU Inter-collegiate Gulbarga Zone Football Tournament on 11th and 12th April, 2016. 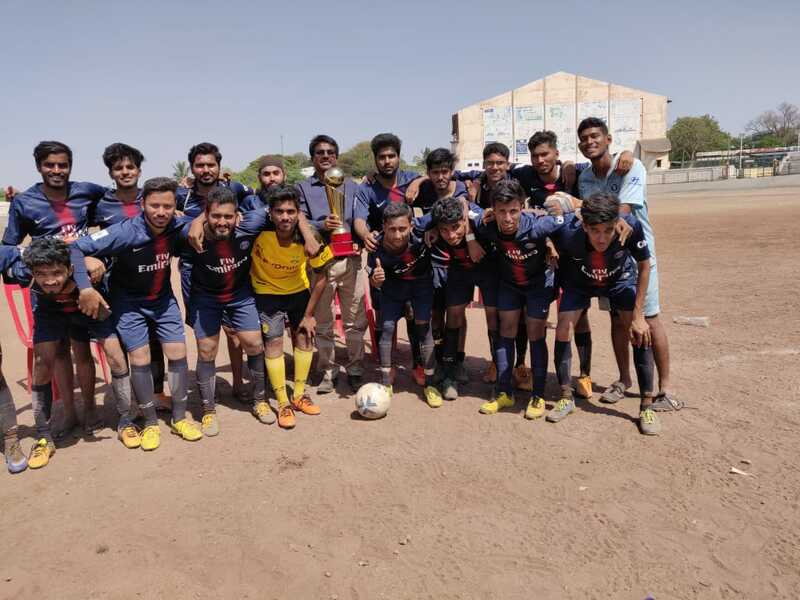 Various colleges from gulbarga zone are participated in the tournament like BEC Bagalkot, BLDEC Bijapur, RYMCE Bellary, BITM Bellary, PDIT Hospet, NCE Raichur, PDAEC Gulbarga, KBNCE Gulbarga, BKIT Bhalki, LEC Bidar, GNDEC Bidar, etc. 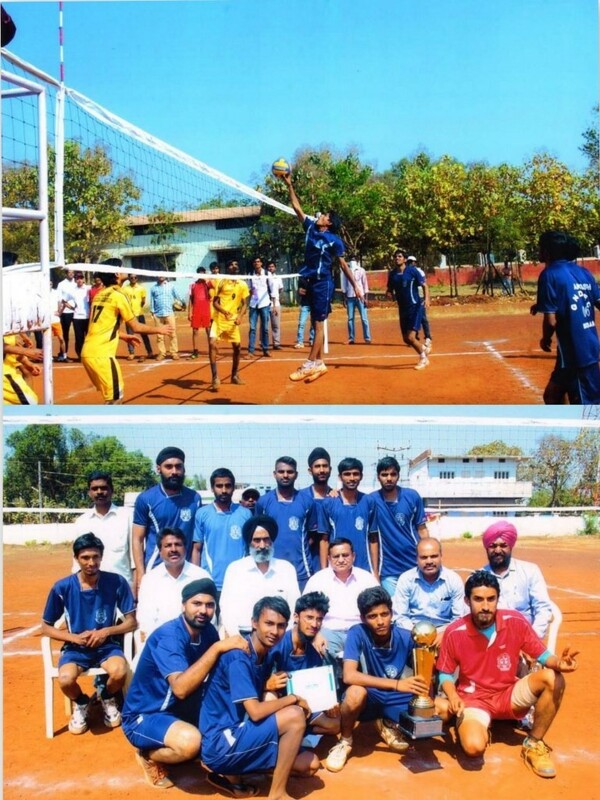 VTU Inter Collegiate Gulbarga Zone Volley Ball Tournament was conducted by RYMEC, Bellary on 29th Feb, 2016 at Bellary. 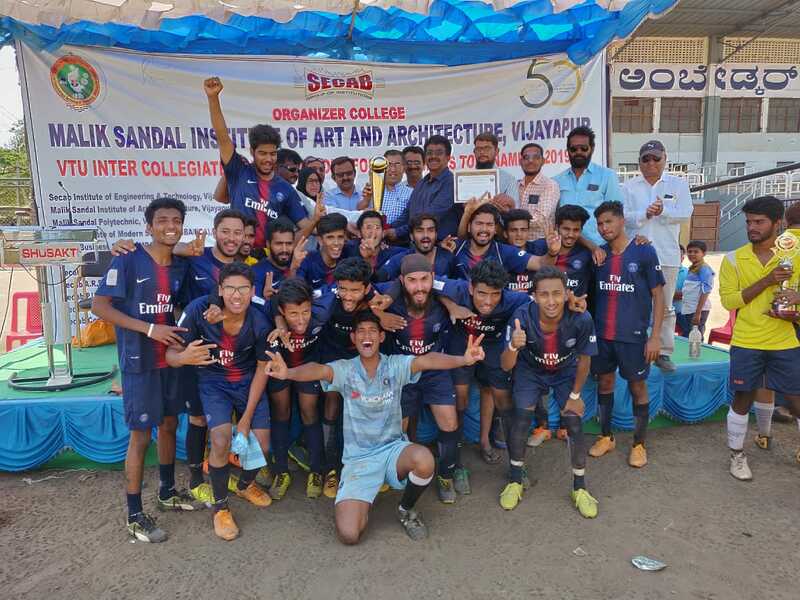 In this tournament 16 teams from North Karnataka have participated like GNDEC Bidar, PDACE Gulbarga, BEC Bagalkot, BITM Bellary, SLNCE Raichur, APPIT Gulbarga, LACE Bidar, KBNEC Gulbarga, Mudhol College of Engg. 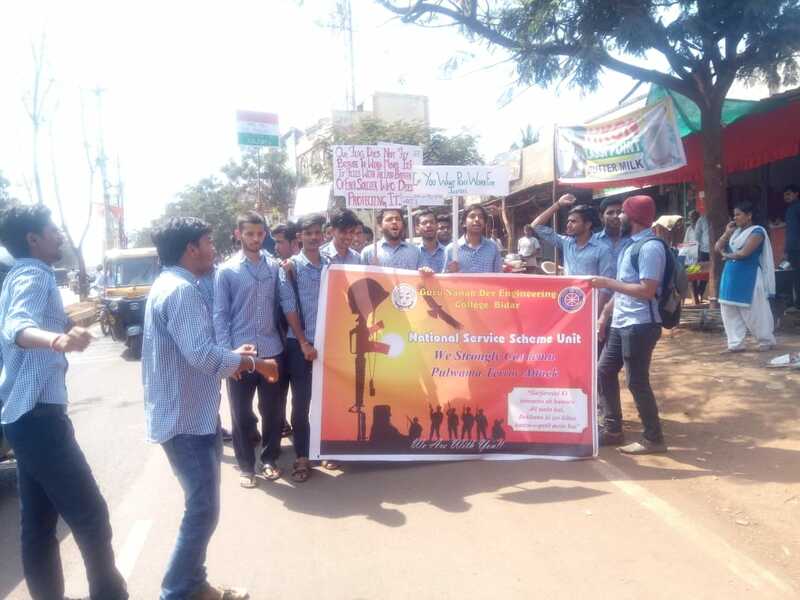 Mudhol, PDIT Hospet, CSEA Bijapur, BLDEC Bijapur, and other Engineering Colleges. 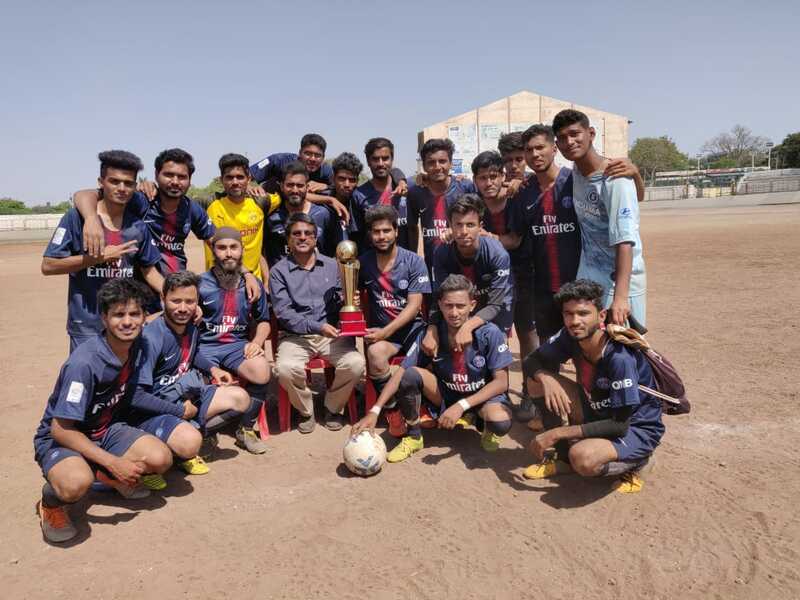 GNDECB emerged as runner up in the tournament. This is consecutively 5th time emerging as winner of the tournament. Visvesvaraya Technological University has awarded Rs. 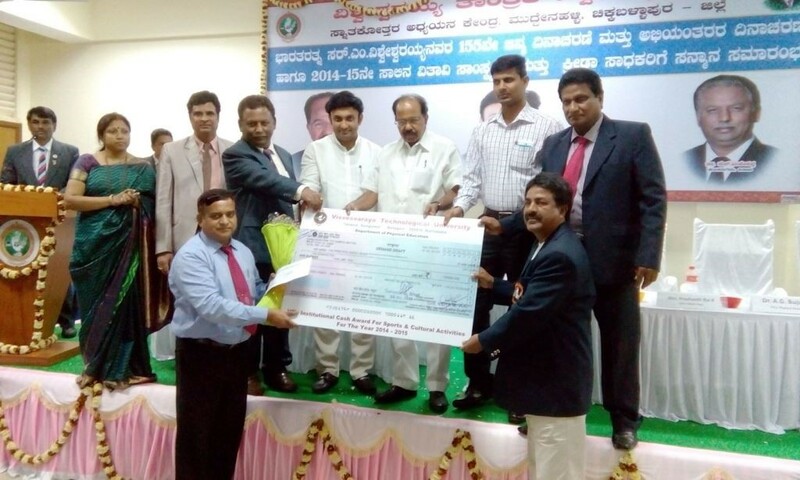 1 Lakh for Sports Activities for the year 2014-15. The same award has been received during the year 2004-05, 2005-06 of Rs. 1 Lakh. The award is issued from the Pro-kabbaddi and National Kabbaddi Player, VTU vice- chancelor, VTU registrar and Honable Minister Shree. Veerappa Moili and other dignities. On the occasion of inauguration function of VTU intercollegiate Gulbarga Zone - Table Tennis for Men and Women tournament, all the colleges of Gulbarga Zone of VTU were actively participated. 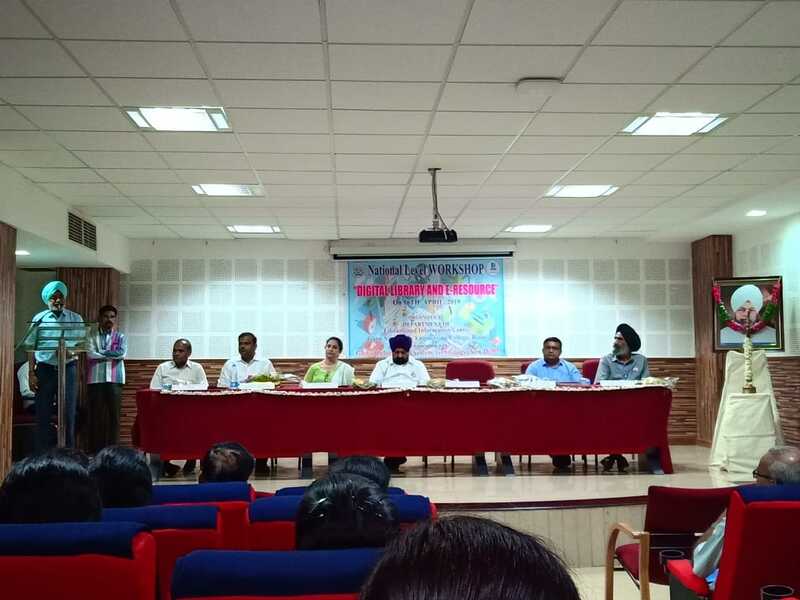 The has been chaired by Sardar Balbir Singh Ji (Chairman, GNDECB), Dr. Ashok Biradar (Principal, GNDECB), Sardar Jagtar Singh Ji (Administarator, GNDECB), M.A. Gaffar (Physical Director, GNDECB). This event has been organized by the GNDEC Bidar on 30th March 2015 on the eve of Shaheedi Divas of Panth Ratan Shiromani Saradar Joga Singh Ji. 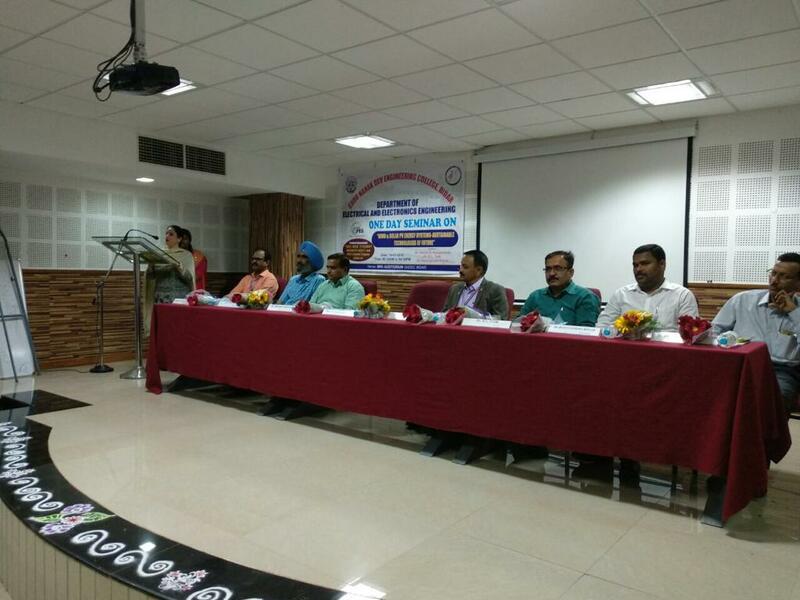 All affiliated VTU colleges have been participated in the this event. 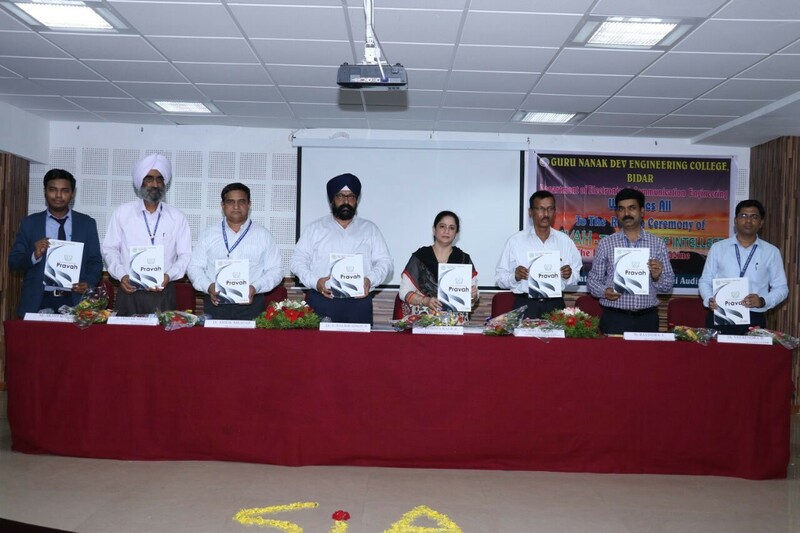 This event was chaired by Sardarni Reshma Kaur ji (Vice Chairperson of GNDECB), Dr. Ashok Biradar (Principal, GNDECB), Sardar Jagtar Singh (Administrator, GNDECB), M.A. Gaffar (Physical Director, GNDECB). 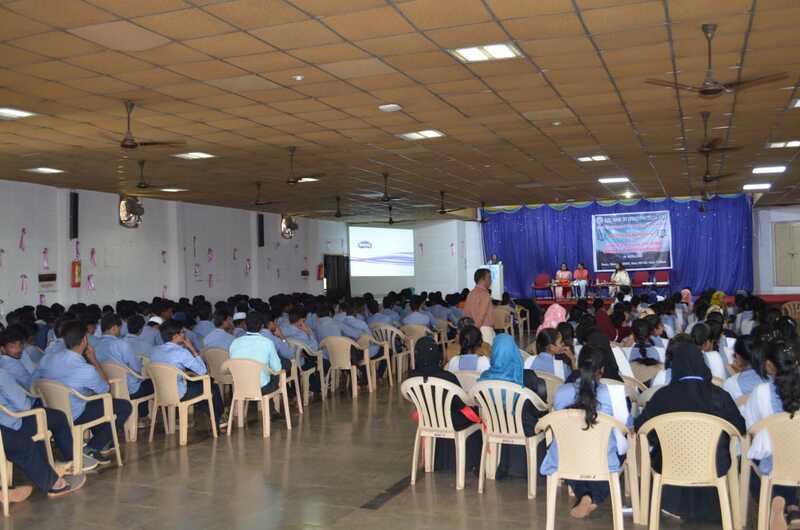 This event nearly 23 engineering colleges from all over the north karnataka have participated. 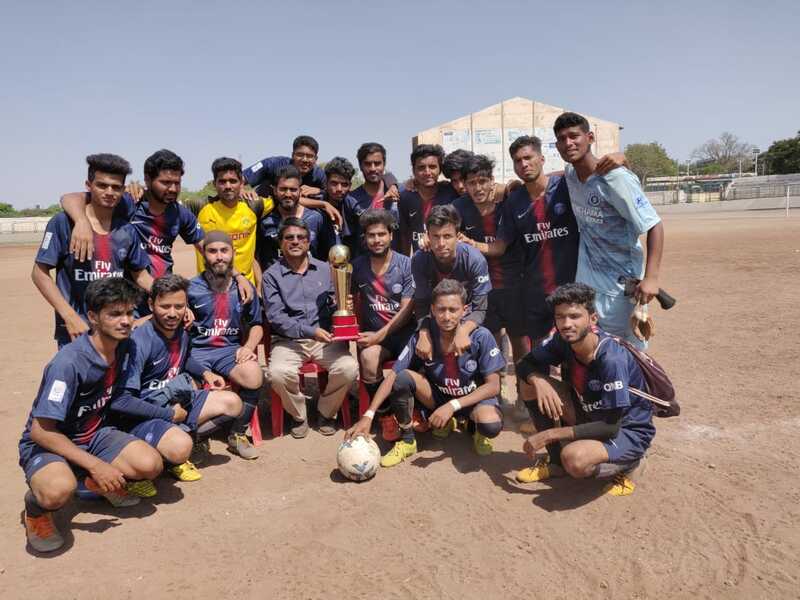 The most exciting final was played between SLNCE, Raichur and GNDEC Bidar. 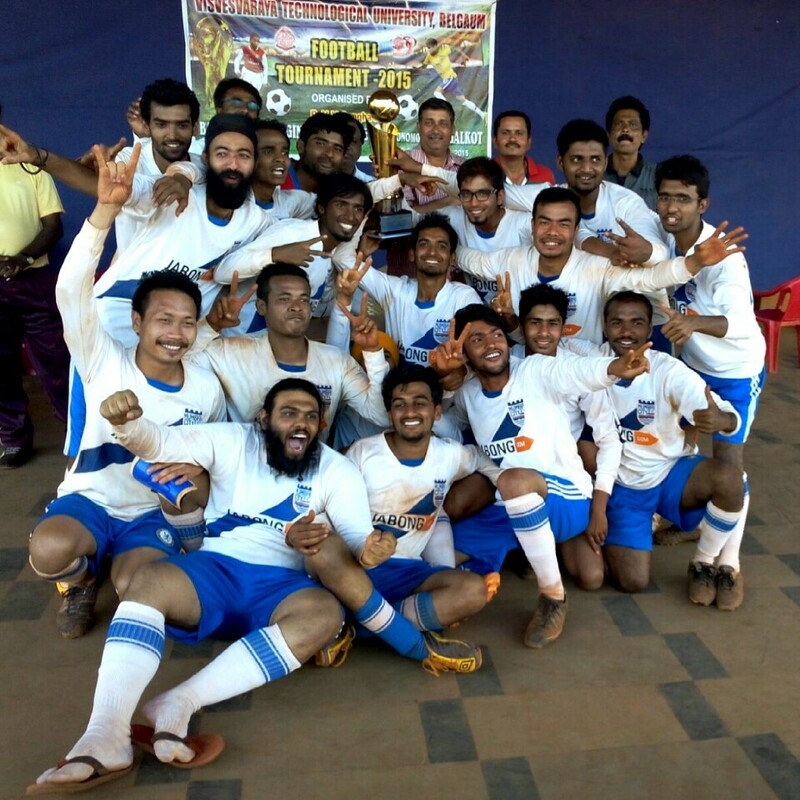 Eventually the tournament was won by the GNDEC Bidar and SLNCE has been declared to be runner up. 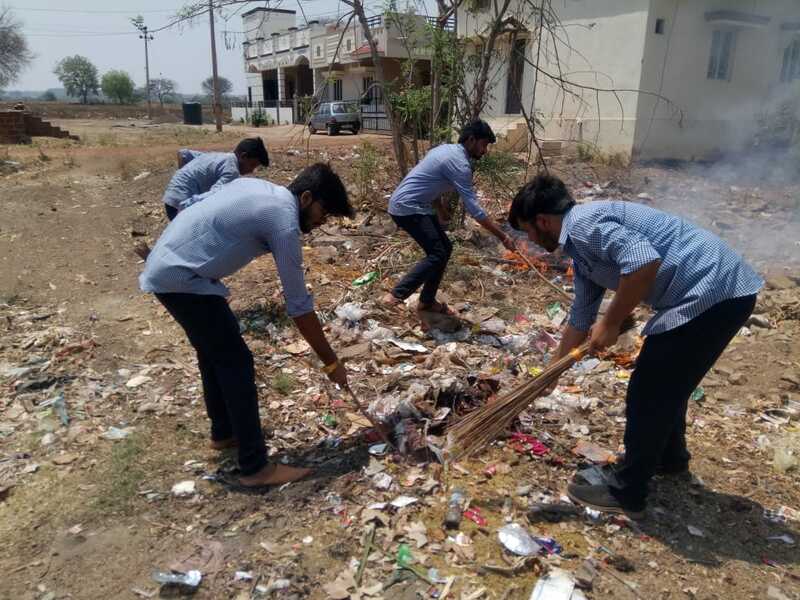 The National Service Scheme is an Indian government-sponsored public service program conducted by ministry of youth affairs and sports of government of India. Popularly known as NSS, the scheme was launched in 1969. 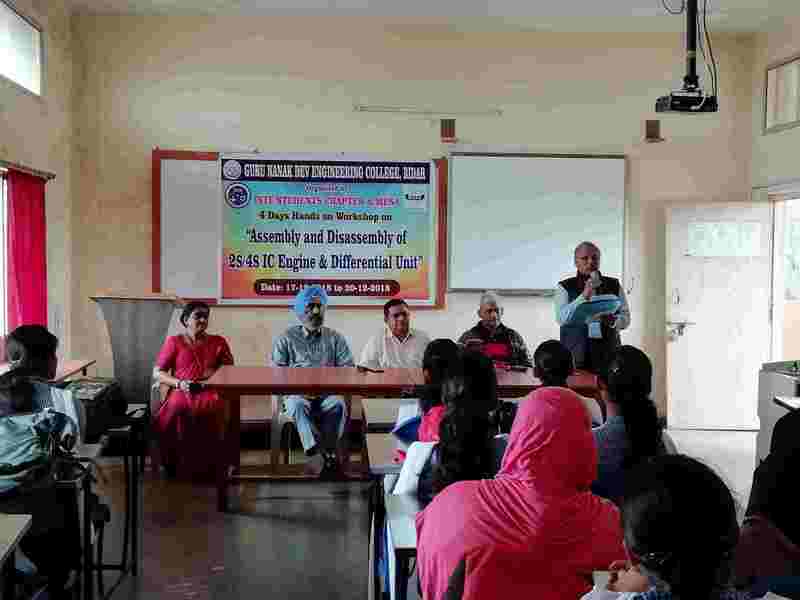 Internal Complaints Committee of Guru Nanak Dev Engineering College, Bidar, celebrated International Women’s Day on 8th March, 2019 in the college campus. 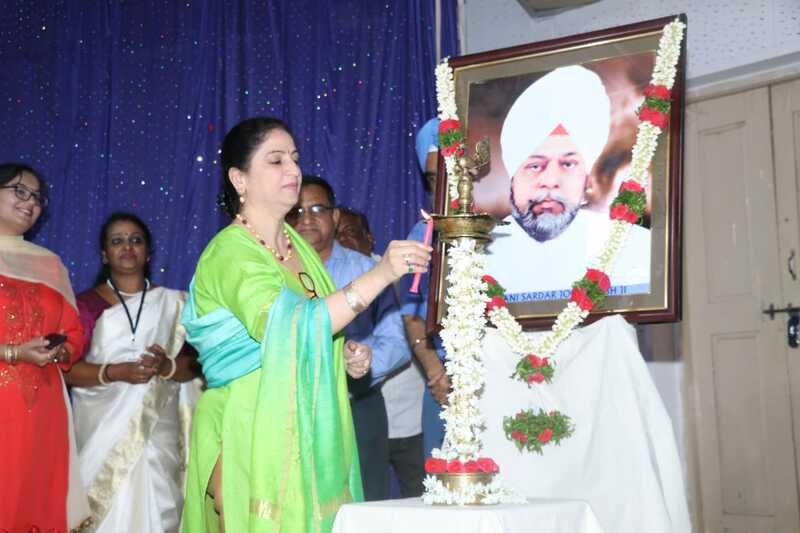 Mrs. Reshma Kaur, Vice Chairperson was the Chief Guest. 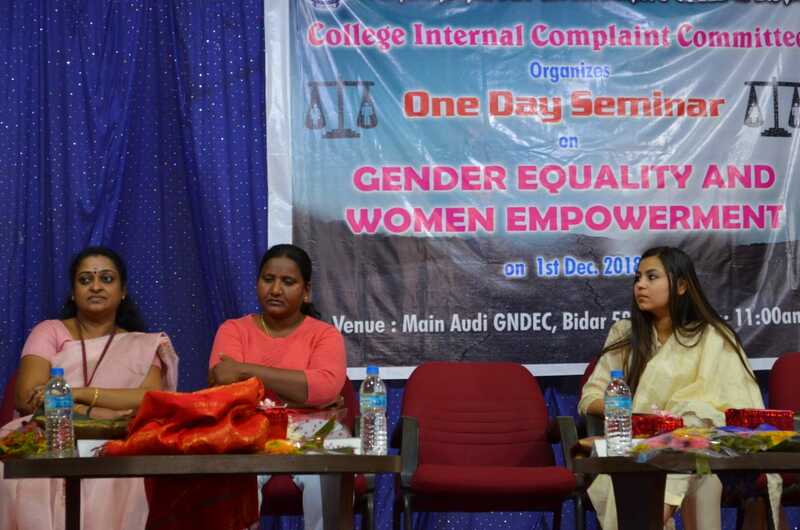 She spoke on the occasion and sensitized students about women empowerment, gender equality and relevance of educating women in the society. Dr. Ashok Biradar, Principal, S.Jagtar Singh, Administrator, Mrs. Jasmaneet Kaur and Dr. Sindhu S. Prasad, Chairperson ICC graced the occasion. 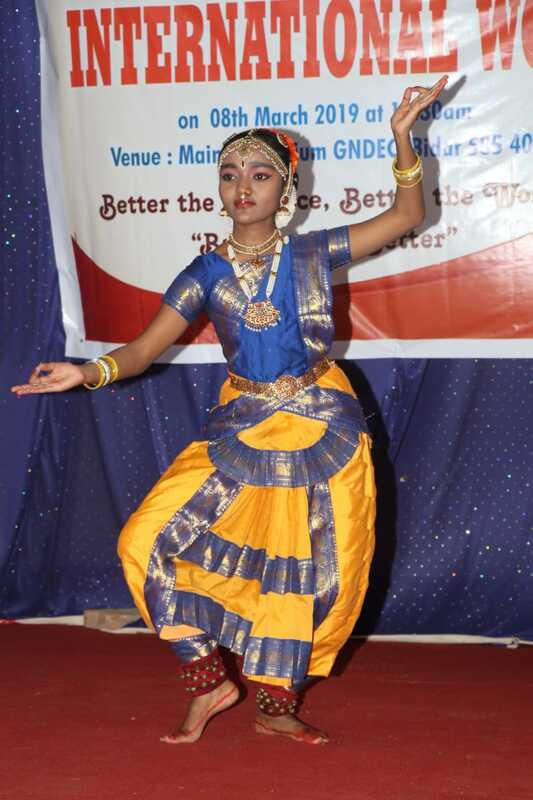 Students showcased their talents through the cultural programme followed thereafter. 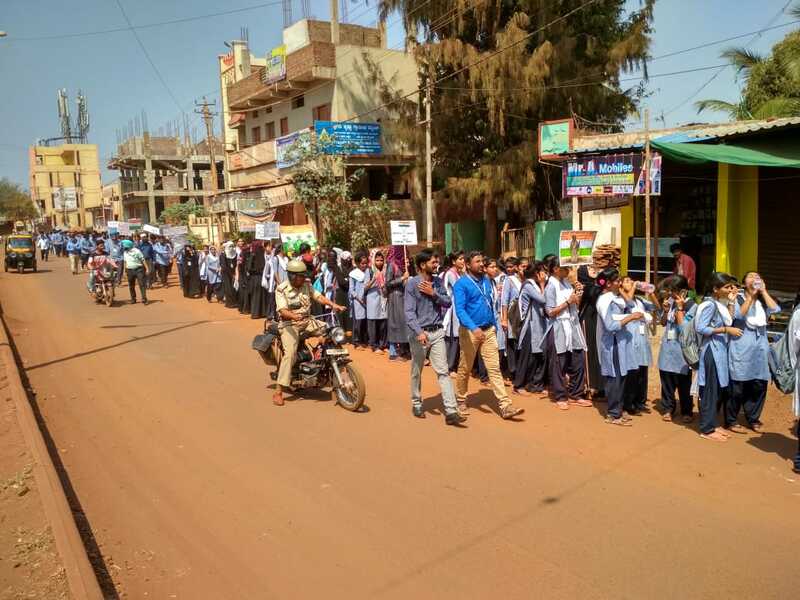 More than 500 students and staff members were present during the function. 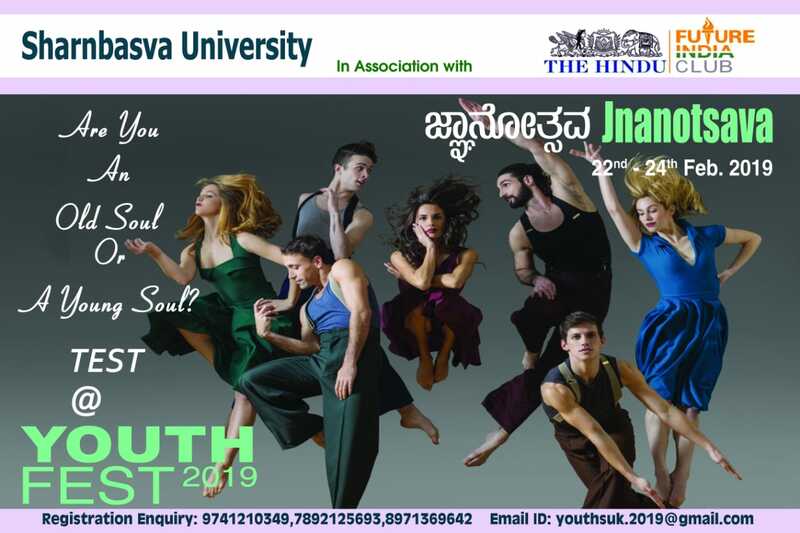 Students Of GNDEC Bidar has Secured Third Position in Jnanotsava Youth-Fest - 2019 conducted by Sharnbasva University,Kalaburagi . 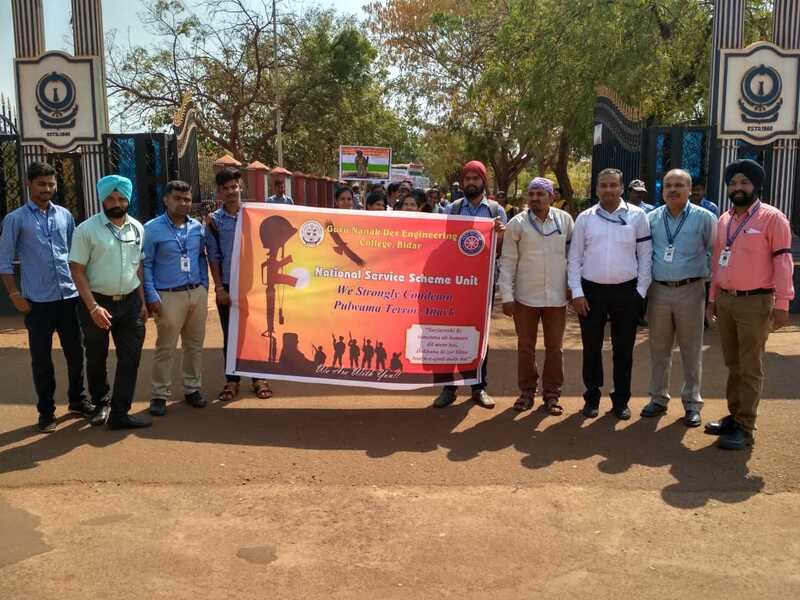 #GNDECB management,staff and students payed tributes to 49 CRPF personnel martyred in a dastardly attack on Thursday in Pulwama, Jammu and Kashmir and and stood in silence for minutes mourning the death of the Bravehearts. 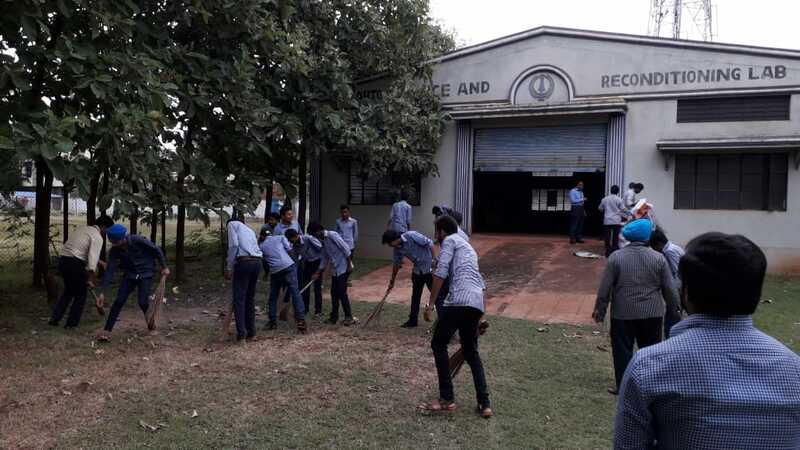 The Department of Civil engineering has conducted Swachh Campus Program under Swach Pakhwada 2018 at GNDEC campus on 22/09/2018 at 11.00 a.m.
All the staff and students of civil engineering department actively participated and the program given awareness regarding keeping and maintaining campus and society clean. 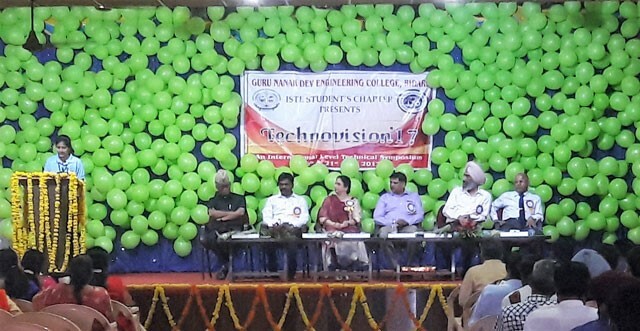 The management of GNDEC and the staff have supported and encouraged the students for taking part in such activities. 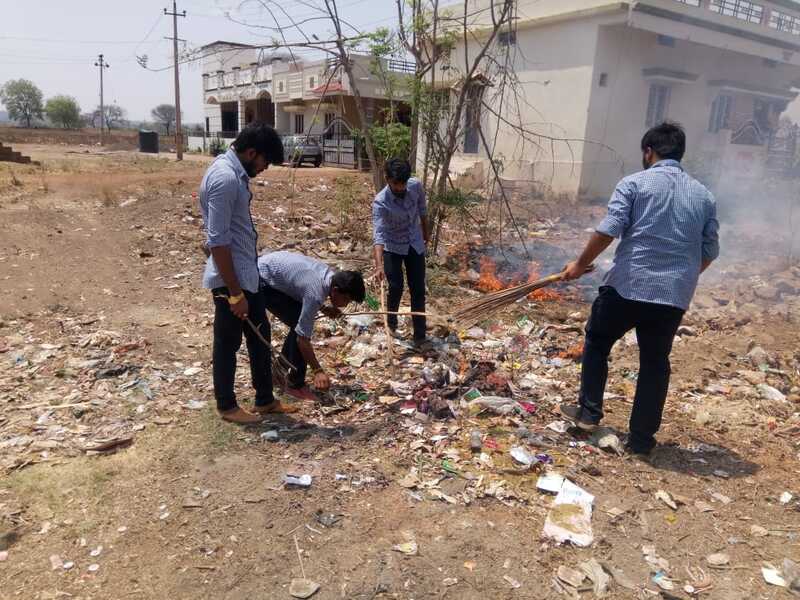 Event:	Swachh Campus Program under Swachh Pakhwada 2018. 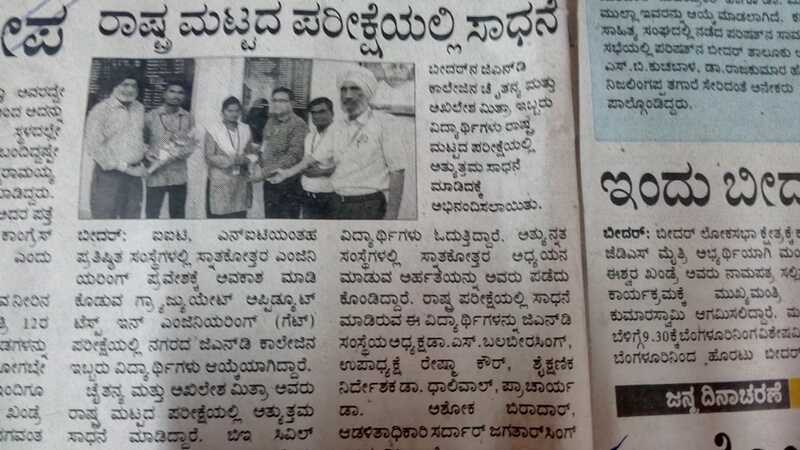 News Publication: Prajavani daily news paper. 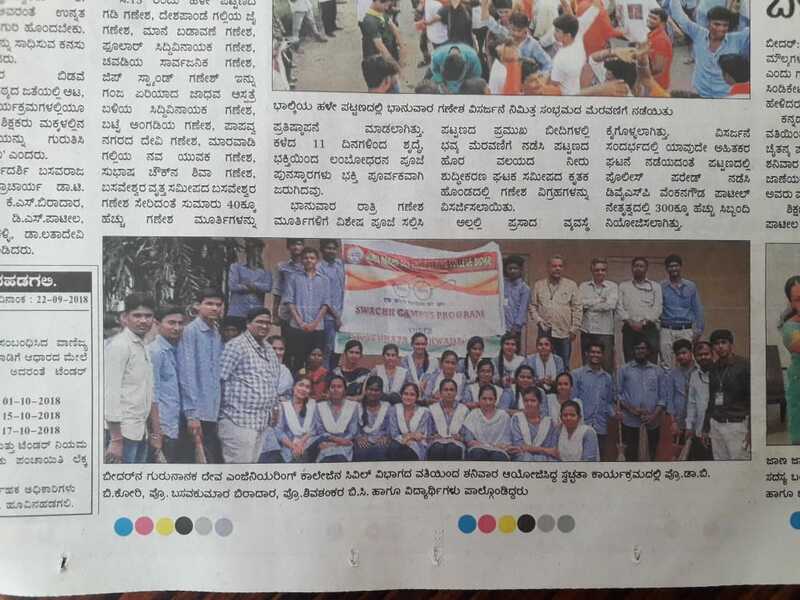 Vijaya Karnataka daily news paper. 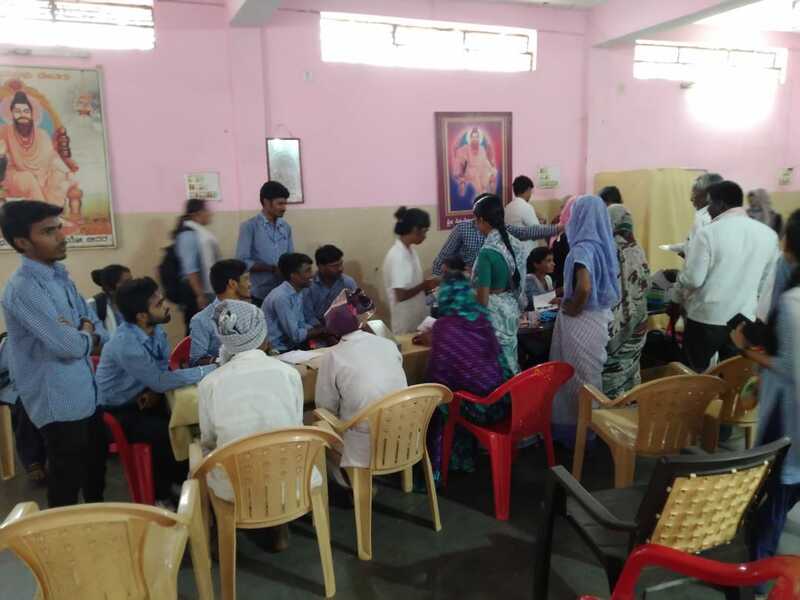 NSS Volunteers of GNDEC worked in rural areas,adopted villages and school to the serving the cause of society through survey, education and health awareness program. GNDEC Students performed skits,dance to bring the awareness among the rural people of the district. The College Internal Committee is organising a seminar on "Women Empowerment and Gender Equality" on 1st Dec 2018 at 11.00 am in Mini-auditorium . 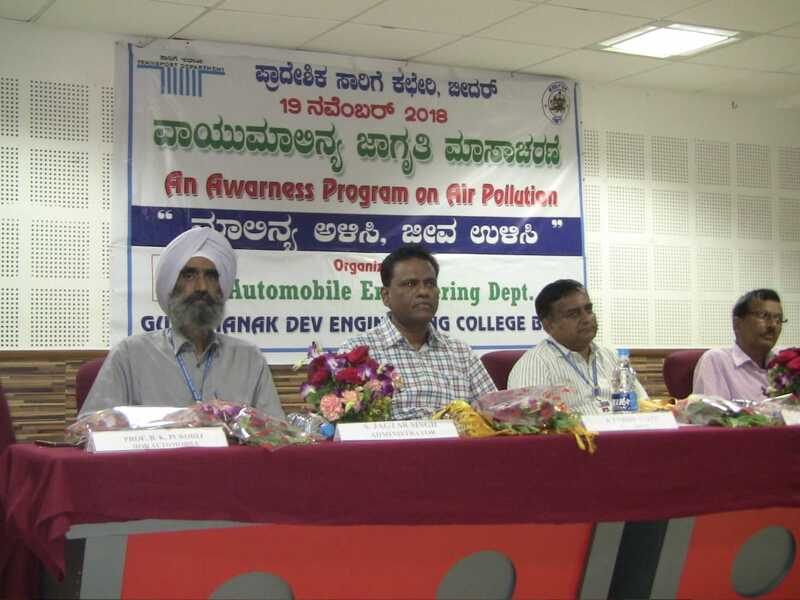 Automobile Engineering Department organized a program jointly with RTO Bidar on “Awareness on Air Pollution” on 19-11-2018. in Mini Auditorium. Mr. K T Vishwanath, Regional Transport Officer, Bidar graced the program as Chief Guest. Principal, Director (academics), Administrator, Heads of various Departments, faculty and students were present. Prof. B. K. Purohit, HOD Automobile Department and Mr. Md. Junaid Khan, a student of B.E. III semester gave presentation on the topic. 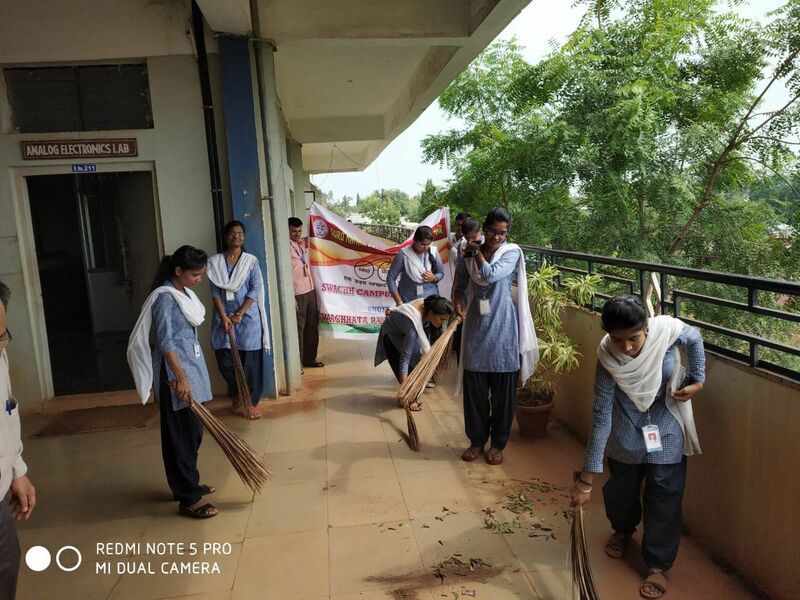 The Swachhta Pakhwada – 2018 program was conducted in the college to clean the college campus and hostel. 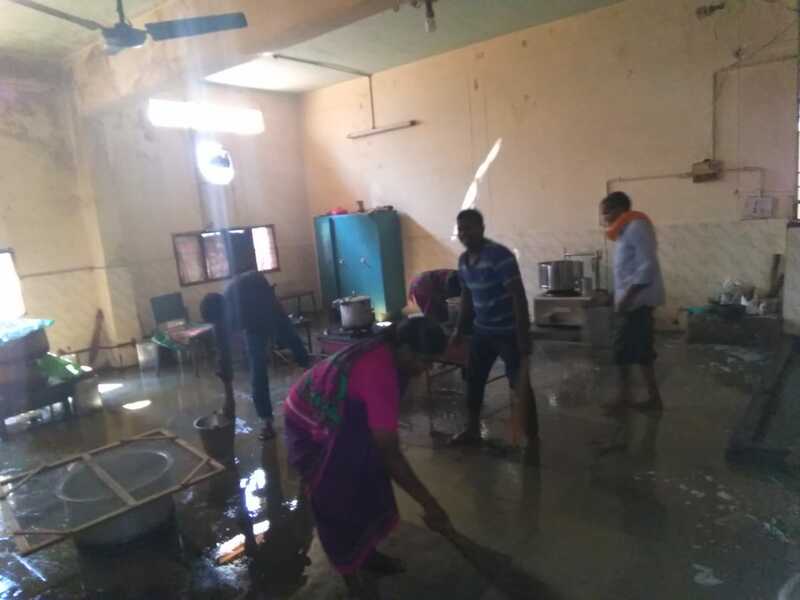 The campus cleaning was done from 17-09-2018 to 01-10-2018 to clean the class rooms, laboratories, seminar halls, administrative blocks, library, hostels, toilets, kitchen, mess rooms, canteen etc. 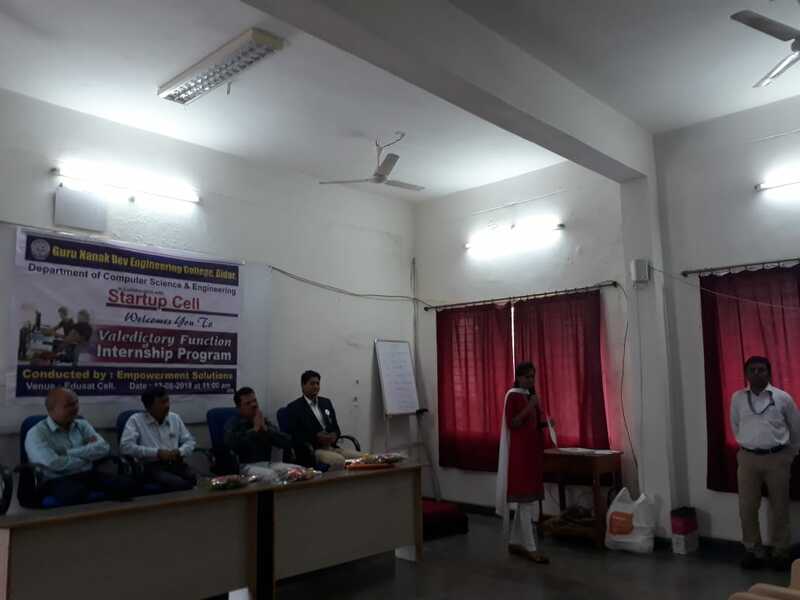 All the staff members along with students participated in the program. 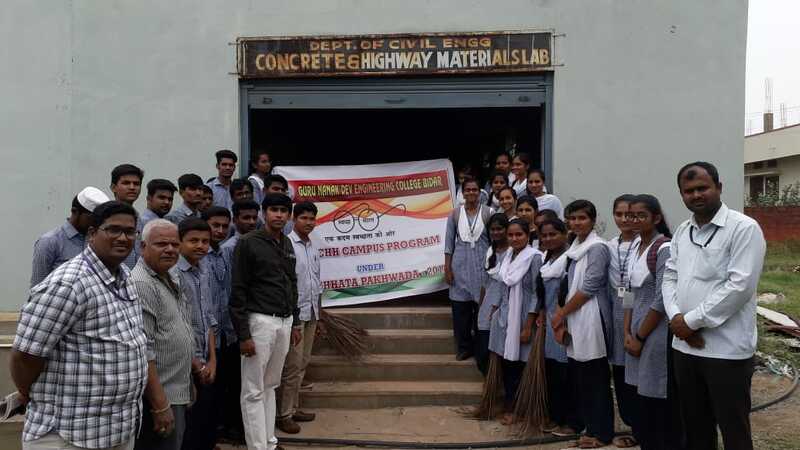 The Swachhta Pakhwada – 2018 program was entrusted to Automobile Engineering Department. 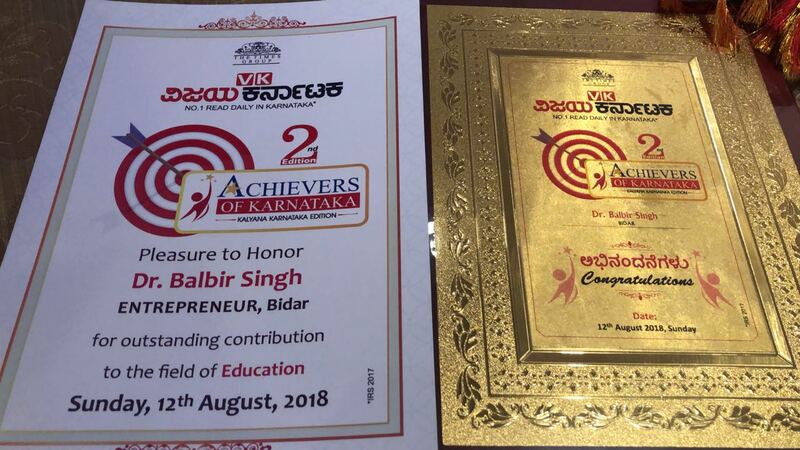 Dr. Sardar Balbir Singhji President of Guru Nanak Group of Institutions Bidar is honoured with "Achievers of Karnataka" award for outstanding contribution to the field of Education by the Times Group at chancery pavilion Bangalore Karnataka by the Union Minister of Statistics and Programme Implementation Shri. DV Sadananda Gowda and Minister of Social Welfare, Government of Karnataka Shri. Priyank Kharge. 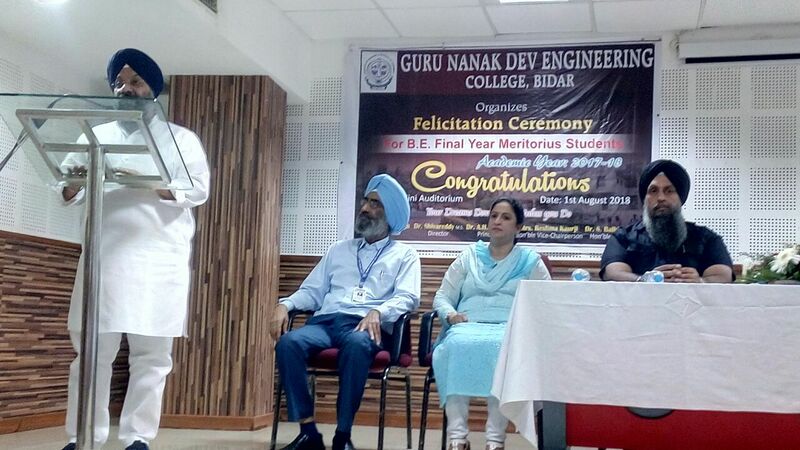 Guru Nanak Dev Engineering College has organized felicitation program to B.E 8th all branch topper in college campus on 1st Aug 2018. 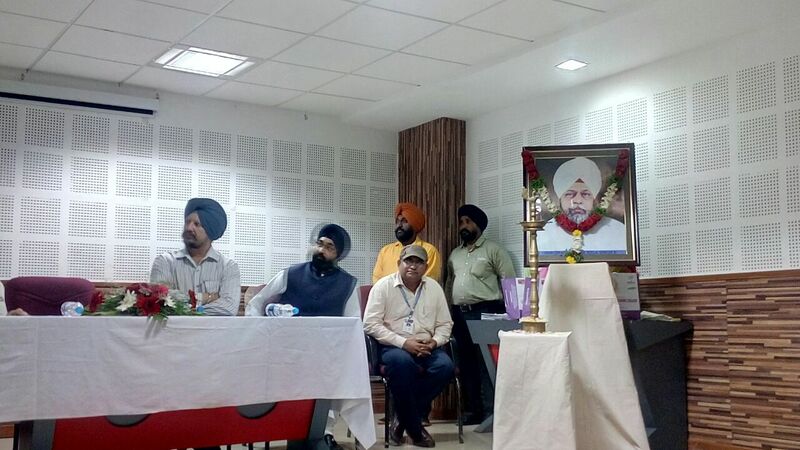 The Function chief Guest Dr.Jaspal Singh Former High Commissioner to Mosaboque and former VC of Punjab University Patiala addressing gathering said students should try achieve wisdom rather than knowledge. Unfortunately today educational system tries to attain knowledge but not wisdom, he said knowledge is past ,wisdom is future. He appreciated the efforts of management GNDEC for attaining greater height in the field to technical education and congratulated the staff and management of GNDECB. Another Guest Sardar Manjeet Singh President Gurudwara Delhi, a prolofic speaker, a role model for youth today; urged students to be more disciplined. He also said discipline and hardwork are two steps for success. S.Jasbir Singh Dham Member SNJF, Vice Chairperson Smt. 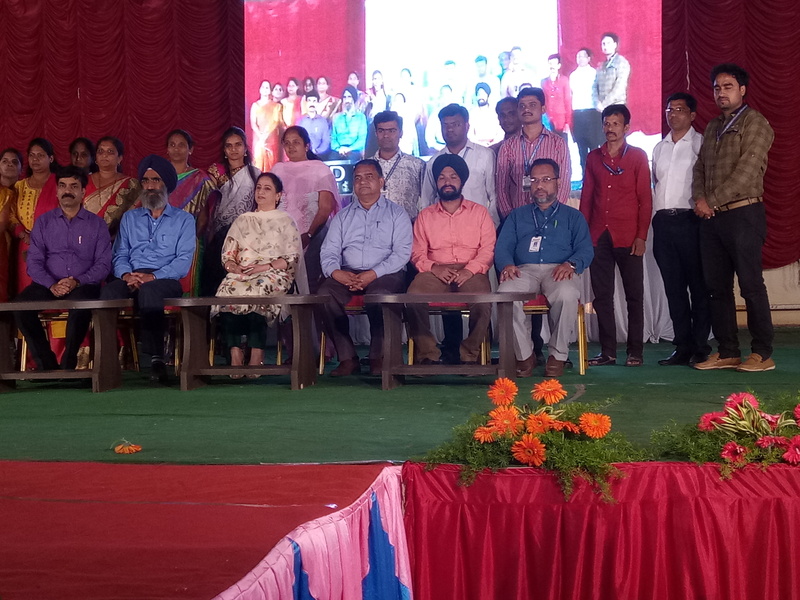 Reshma Kaur, Principal Ashok Biradar, Administrator Sardar Jagtar Singh,Academic Director Dr. Shiva Reddy M S, Student toppers,parents and faculty members attended the function. 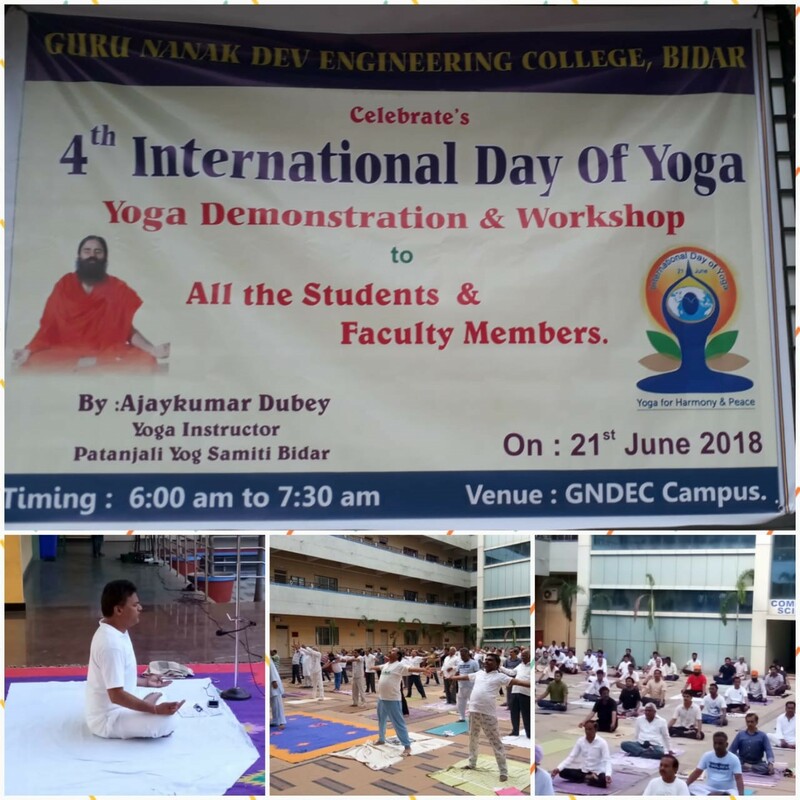 4th International Day of Yoga was organised and celebrated at GNDEC Campus Bidar. Mr.Ajaykumar Dubey, Yoga Instructor Patanjali Yog Samiti Bidar trained staff members and students of GNDEC in performing Pranayam and Ashana . Ajaykumar also explained benefits and advantages of various yogic Pratices. This celebration was concluded with vote of thanks by Dr.Ashok Biradar Principal, GNDEC Bidar. INSTITUTION HAS RECEIVED DR. APJ ABDUL KALAM AWARD FOR EXCELLENCE IN EDUCATION-2017 7TH SEP, 2017. 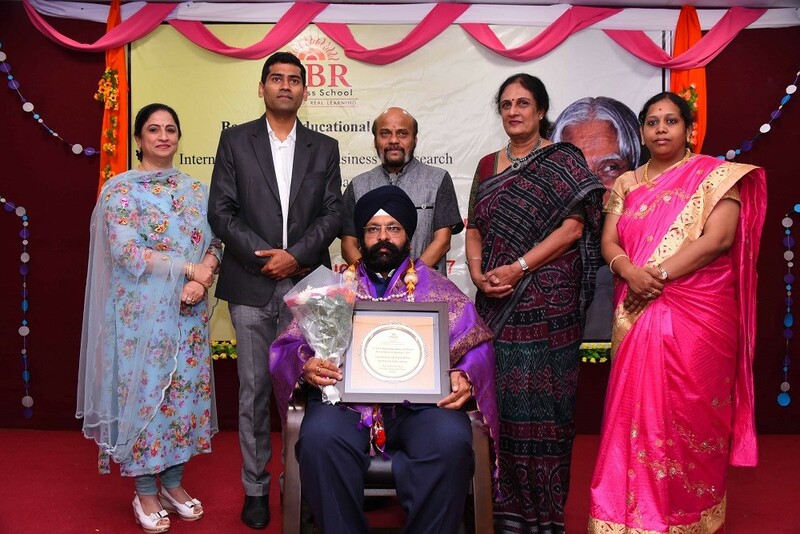 Institution has received Dr. APJ Abdul Kalam Award for Excellence in Education-2017.